Our second Service Spotlight for this week is on Cassie Greco. 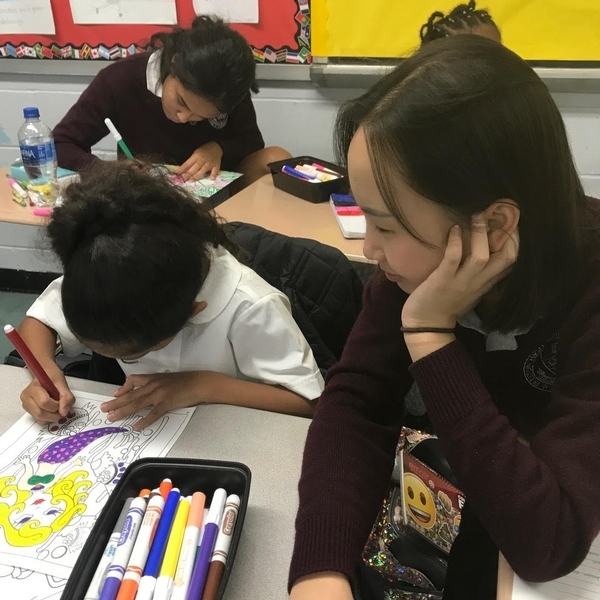 At her elementary school, St. Clare's of Assisi School, Cassie volunteers at their CCD program. As a runner, she assists teachers, collects payments and bulletins, and helps out with the children. When asked to describe her service, she said, "My favorite thing about my service is watching how the kids grow in their faith." 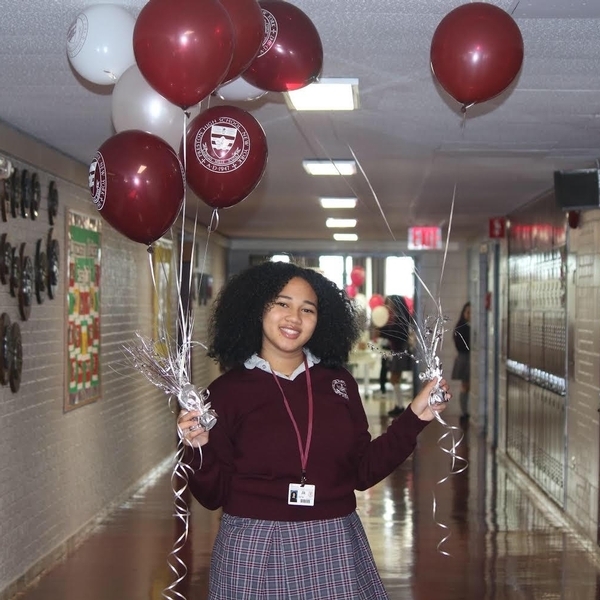 This year's event was very special, since Compassion Connection was able to raise over $2,000 for Lamp Ministries, an NYC Catholic organization with which Preston High School is closely affiliated. Throughout the year, CoCo made sandwiches for Lamp Ministries, who then distributed these sandwiches to the poor in New York City. 1000 people were fed through the hands of Lamp Ministries. 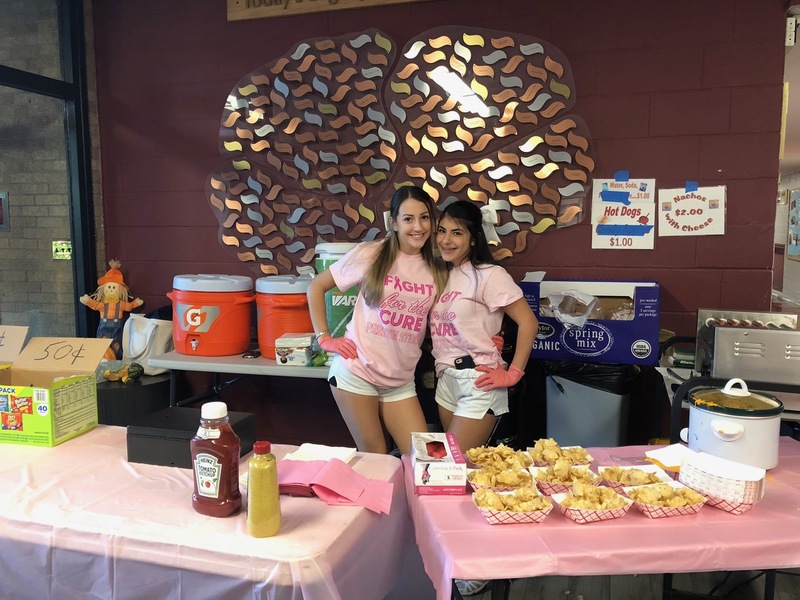 After selling tickets for almost two weeks prior to the event, CoCo exceeded their goal of $1,000, and raised another $200 on the day of the event! Also, a representative from Altice USA’s Charity Champions Program presented a big check of $1,000 to Lamp Ministries, Compassion Connection's chosen charity. Compassion Connection would like to thank all those who helped to make this event possible. Ms. Suzi Myers-Tipa, who has participated as the Zumba instructor at every Preston Dance Marathon, Mr. Teemsma - our DJ, Ms. McEvoy, who helped with decorations and set-up, Mrs. Brescia and Sr. Lorretta for their assistance with snacks and refreshments, and most especially, all of the participants whose donations made it possible to support Lamp Ministries in the wonderful work they do. 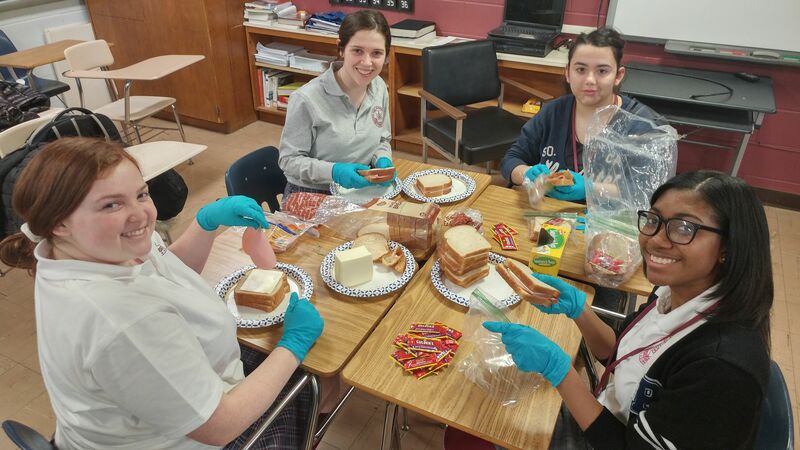 Compassion Connection has reached the final week of sandwich making for Lent! 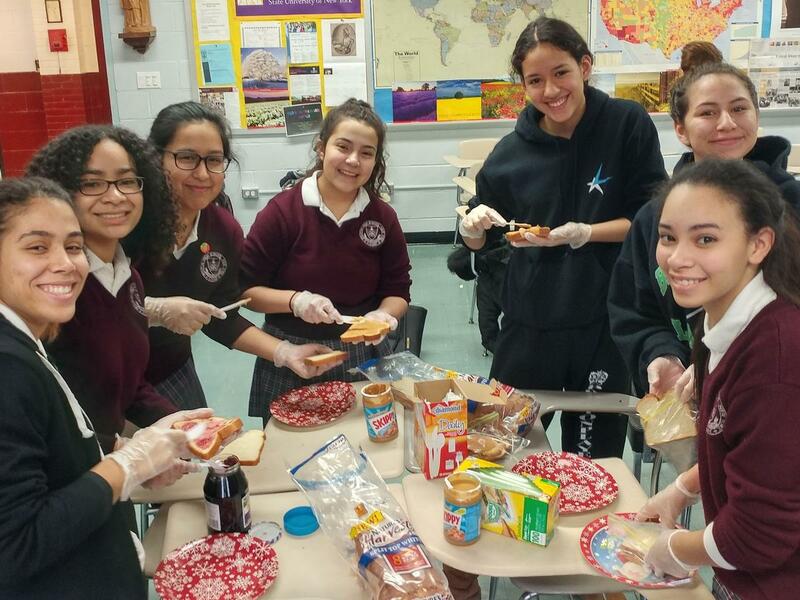 Throughout this school year, CoCo members and volunteers made over 1,000 sandwiches! About 500 turkey and cheese sandwiches, and 500 peanut butter and jelly, through Lamp Ministries - fed one thousand hungry people! A HUGE thank you to all those who participated in this project!!! As we approach Holy Week, let's not forget the sacrifice Jesus made for us and continue to help all those in need of our compassion everyday. 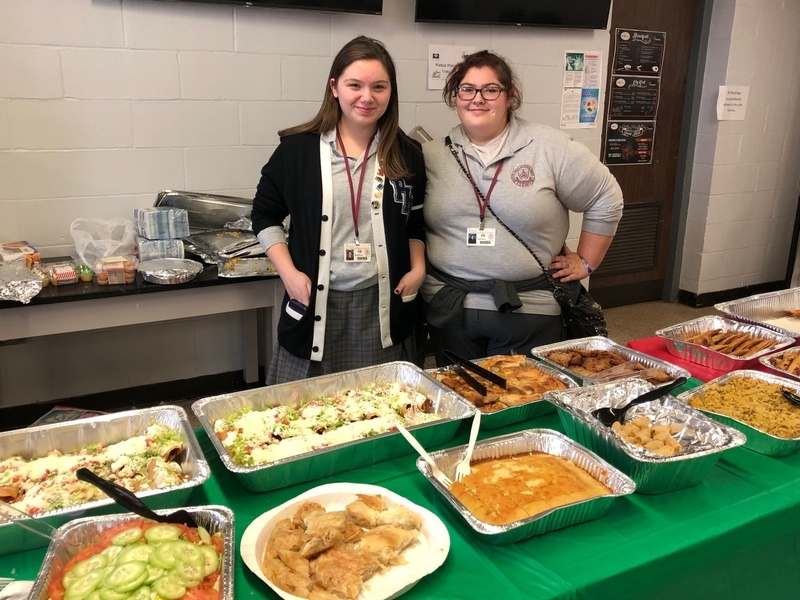 Italian Club hosted their annual Spring Party on April 11th. 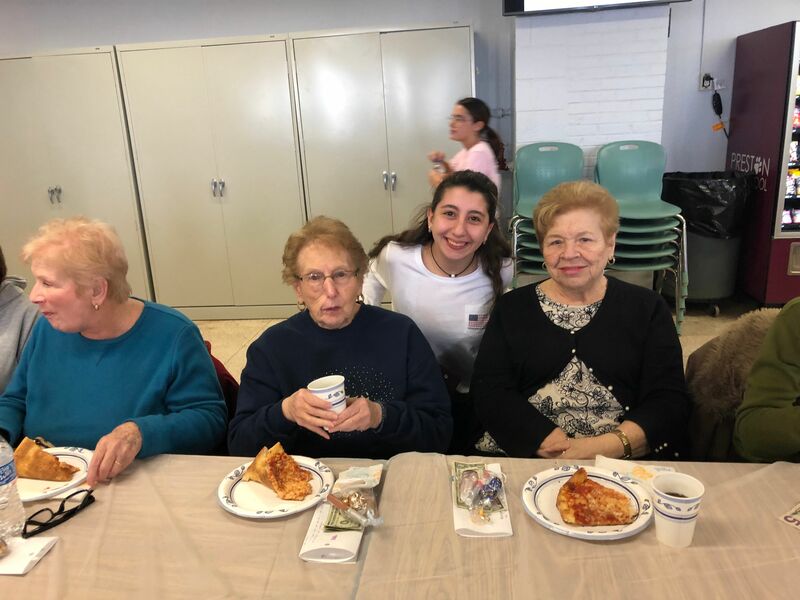 At this event, senior citizens were served pizza and baked goods, including brownies and traditional Italian desserts. 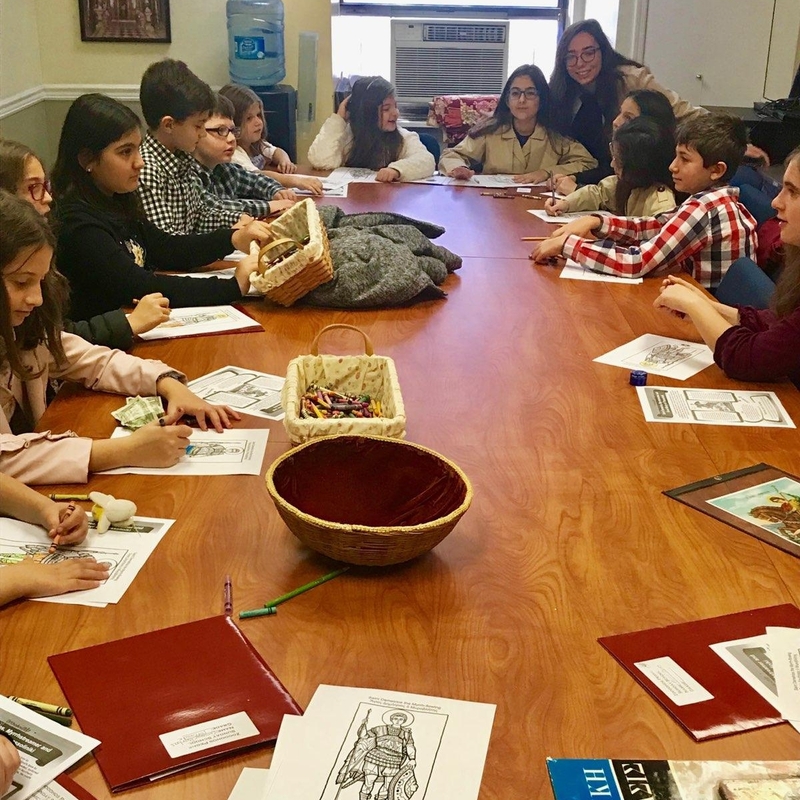 Members of Italian Club and Italian Honor Society and students in Italian classes wrote personal letters and made goody bags for the guests. 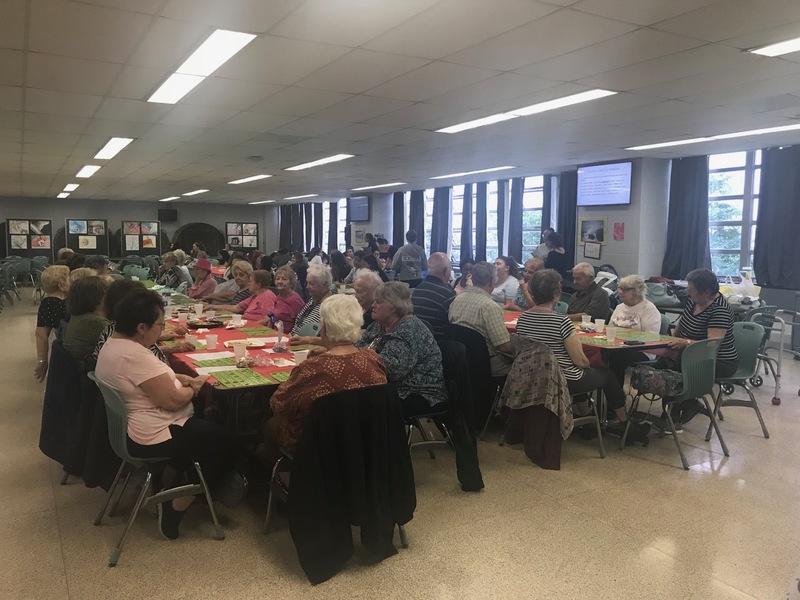 In addition, the senior citizens played several games of bingo and listened to Italian music. Thank you Italian Club for your ongoing service to the community! 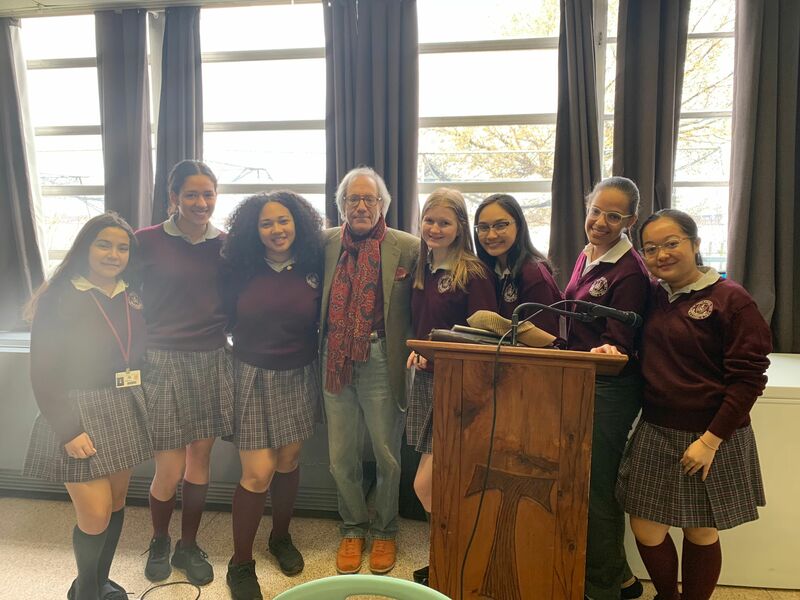 On Thursday, April 11, Ms. Connolly's AP U.S. History and Honors Humanities classes and Dr. Unger's Honors U.S. History class had a guest speaker, Mr. Lewis Zuchman. 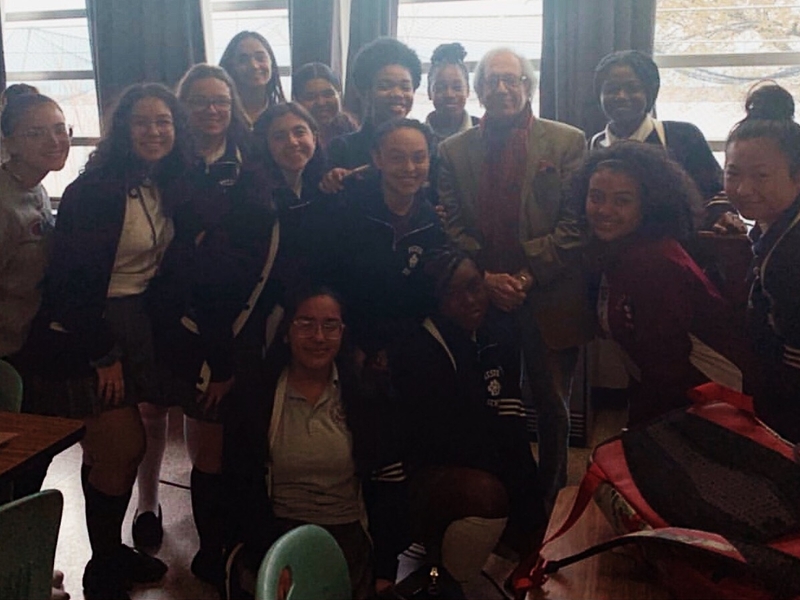 As a Civil Rights Activist and Freedom Rider, Mr. Zuchman experienced life during the time of a segregated America and was able to share his experiences during the 1960s Civil Rights Movement. Encouraging our students to strive for progress, he reminded our students of the importance of unity and working towards the common good for all. We are more alike than we are different and we must always do what is right to help others. 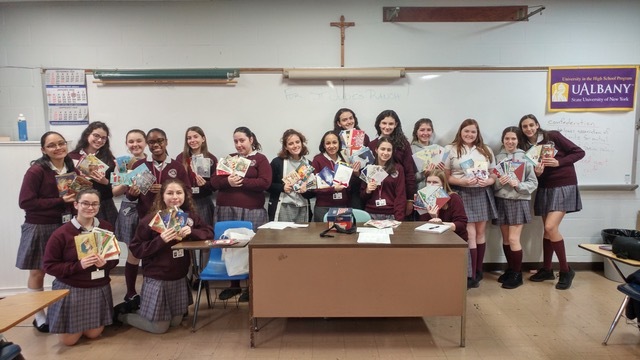 This Spring, the National English Honor Society is sponsoring their annual Book Drive for Jacobi Hospital. All books, including picture books, novels, and short stories, will be given to patients, both children and adults, at Jacobi. NEHS asks all members of the Preston community to donate books to spread hope by placing all donations in the boxes near Room 100. A huge thank you to NEHS and all those who donated for your service to the community! 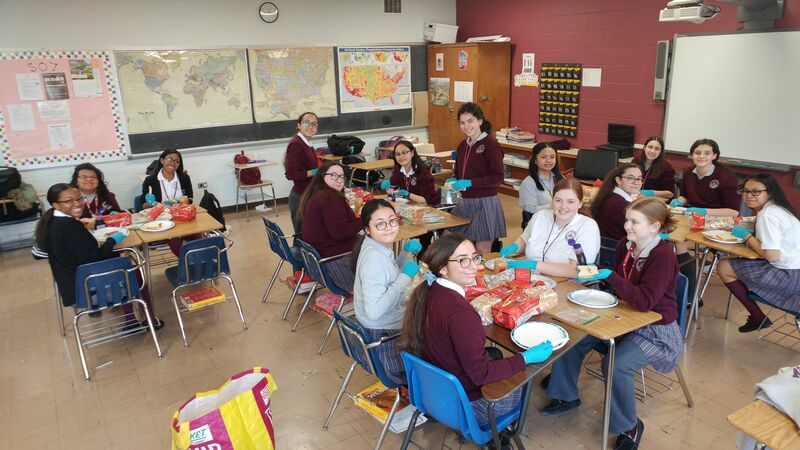 As we approach the end of the Lenten Season, Compassion Connection is continuing to make as many sandwiches as they can for Lamp Ministries! During this 5th week of sandwich making, 20 members of the Preston community made 130 turkey and cheese sandwiches. Thank you to all volunteers! All are welcome to help make sandwiches next Thursday, the last sandwich making meeting of Lent, in Room 104. In just a couple of weeks, Compassion Connection will be hosting their annual Dance Marathon! Dance Marathon is CoCo's largest fundraising event in which there are snacks, Wii Sports, and, of course, lots of dancing! This year, all proceeds from this event will go to Lamp Ministries, an organization that is closely affiliated with Preston High School. 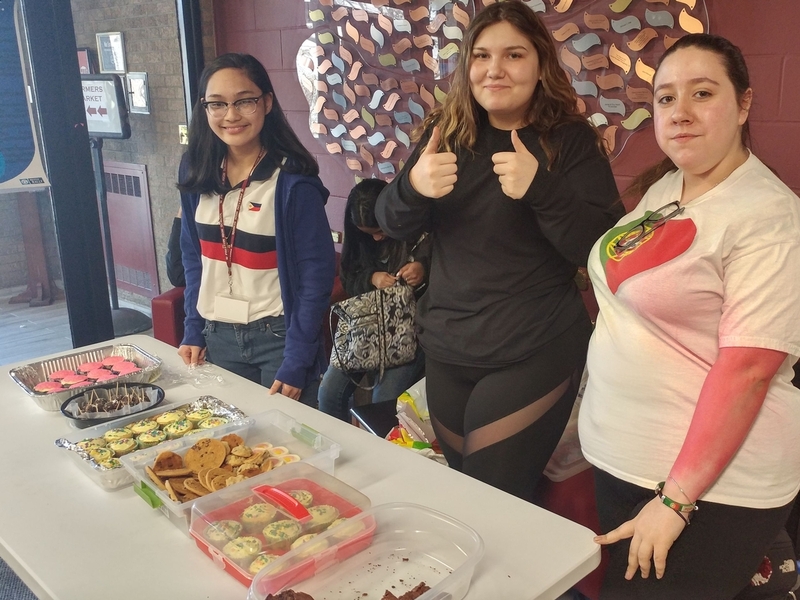 To help fund the T-shirts for this event, Compassion Connection had a bake sale on April 4. Selling homemade baked goods, including cupcakes, cookies, and brownies, they made $72! 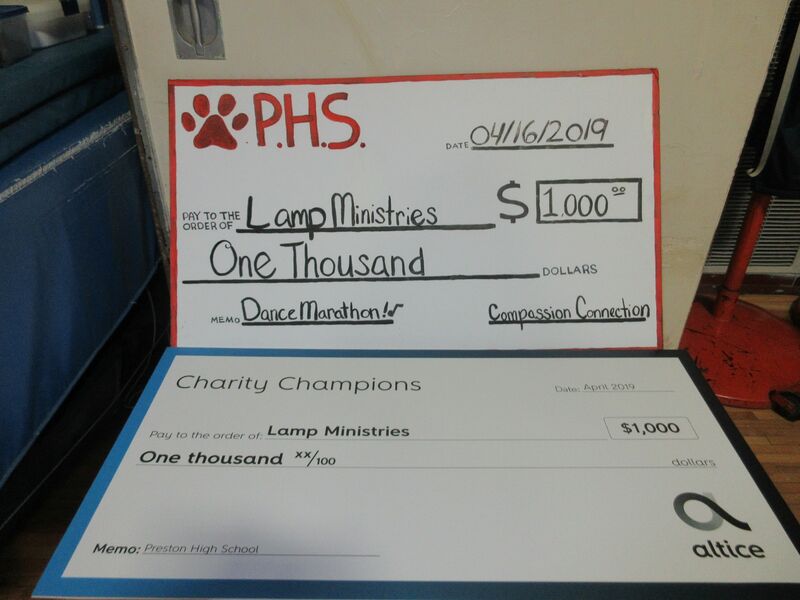 Compassion Connection invites the entire student body to show their love and appreciation for the good work done by Lamp Ministries by attending Dance Marathon on April 16! 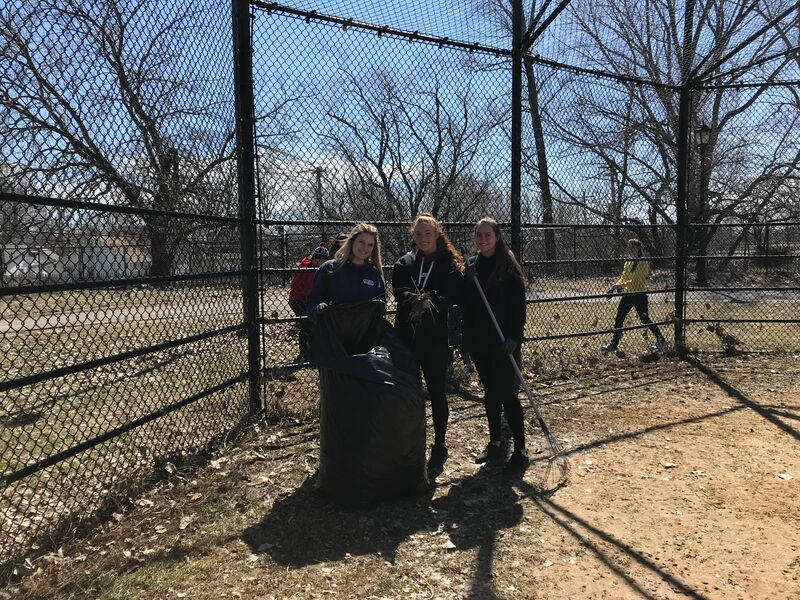 As the Softball Teams prepare for the upcoming season, both the JV and Varsity teams gave of their time to clean up their home field. At Veterans Field, a public park, both teams rolled up their sleeves and got to work. 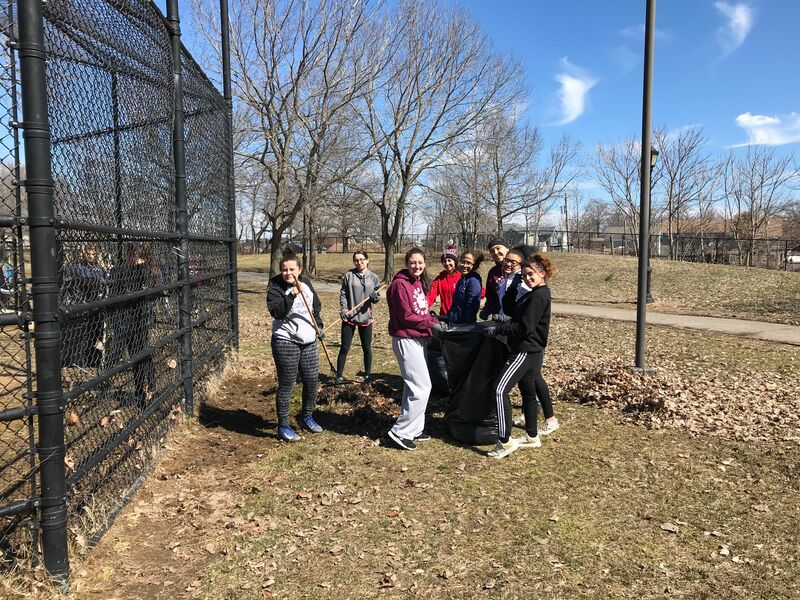 Shoutout to our Softballs Teams for taking initiative and being stewards of God's creation!! Compassion Connection has now been making sandwiches every week for one month! This week, members and volunteers made peanut butter and jelly sandwiches for Lamp Ministries. They made 120 sandwiches for the hungry of NYC. As always, Compassion Connection continually sets an example for all, not only this Lenten Season, but everyday! 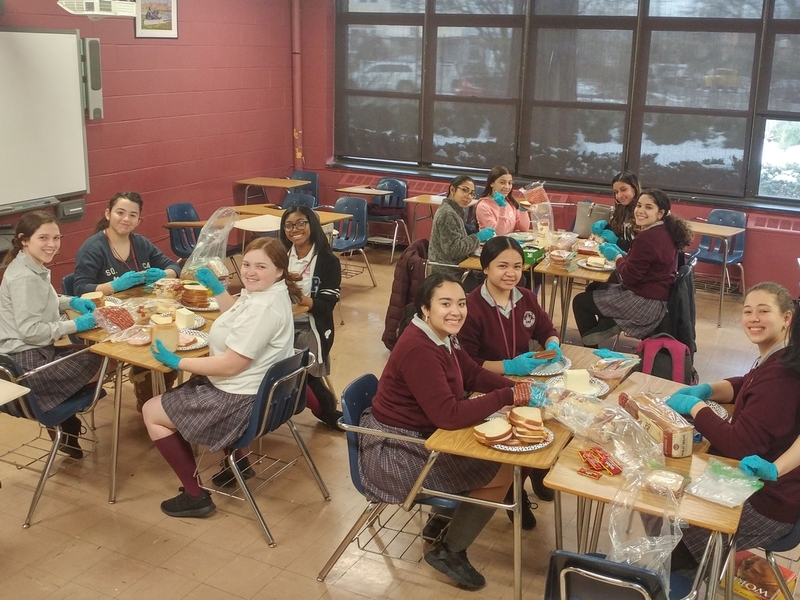 This week was the third week of Compassion Connection's Lenten project of making sandwiches! At this meeting, they made turkey or ham and cheese sandwiches for Lamp Ministries. 20 volunteers came to offer their help and make 135 sandwiches! Thank you to everyone who volunteered their time to help those in need!! 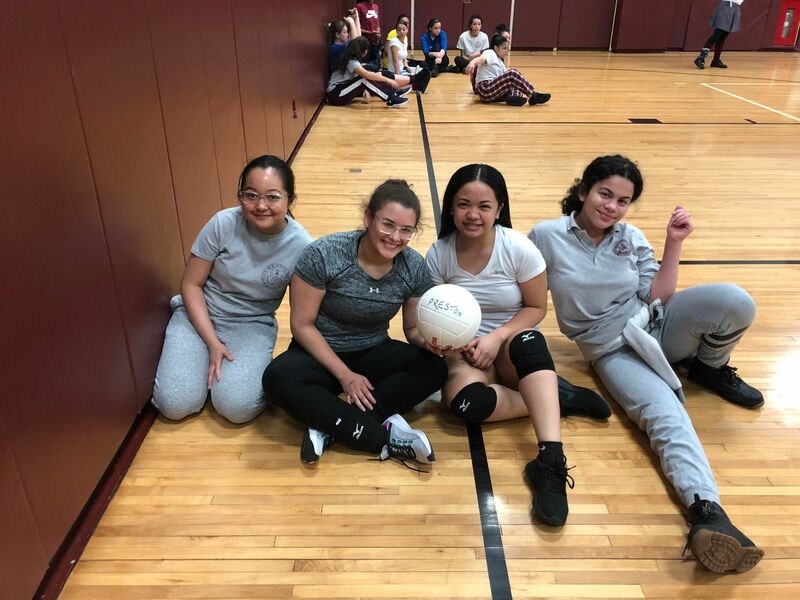 On March 21, the Spanish Honor Society sponsored their annual Multicultural Volleyball Game. 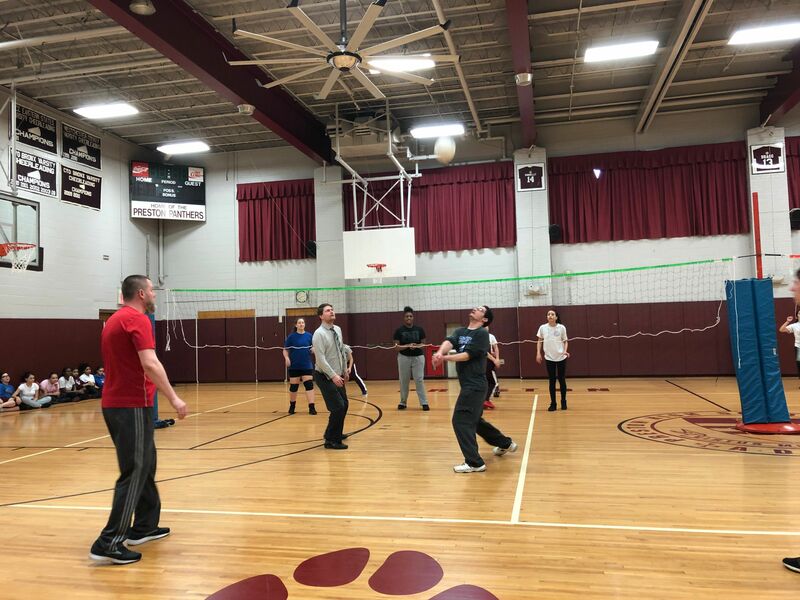 At this event, many of our cultural clubs play against each other in volleyball matches. Our winners were Caribbean Club in first place, Latin Honor Society in second place, and Asian Club in third place. This year, SHS made $132! 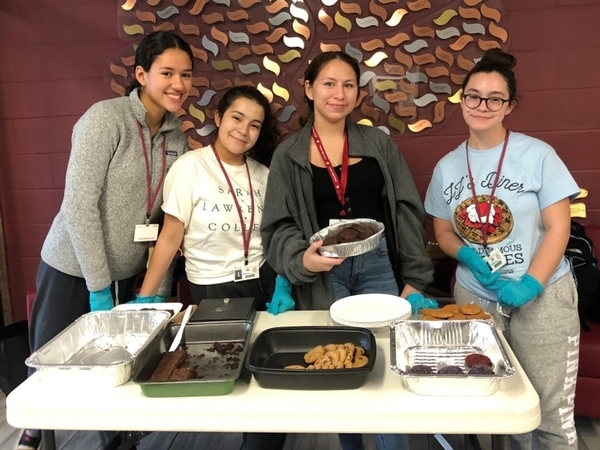 In addition to the game, the Spanish Club hosted a bake sale, in which they raised $82. Spanish Honor Society and Spanish Club raised a total of $214. All proceeds from this event will help fund the Spanish Honor Society Scholarship, which will be awarded to a Preston student at the end of the school year. Thank you to all participants and spectators! Our Service Spotlight for this week is on Daniela Garcia. At Preston, Daniela is an Admissions Intern. She helps out at events that recruit new students to Preston, represents Preston at events for local elementary and middle schools and helps manage the bookstore. When asked to describe her service, Daniela said, "Being an admissions intern has taught me the importance and uniqueness of the Preston community. It's a special opportunity that I don't take for granted!" Compassion is not only popular in Preston High School, but in the Bronx as well! 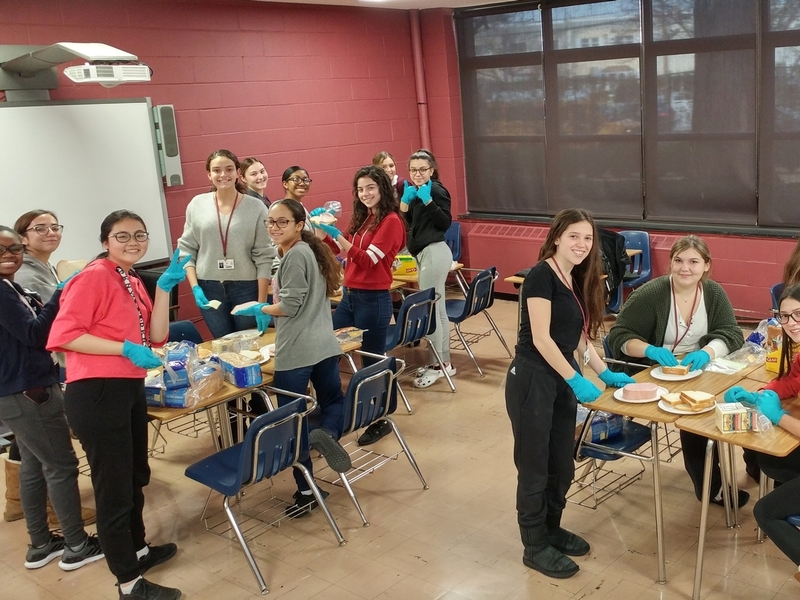 This 2nd week of sandwich making was very special because News 12 The Bronx came to do a segment on Compassion Connection! 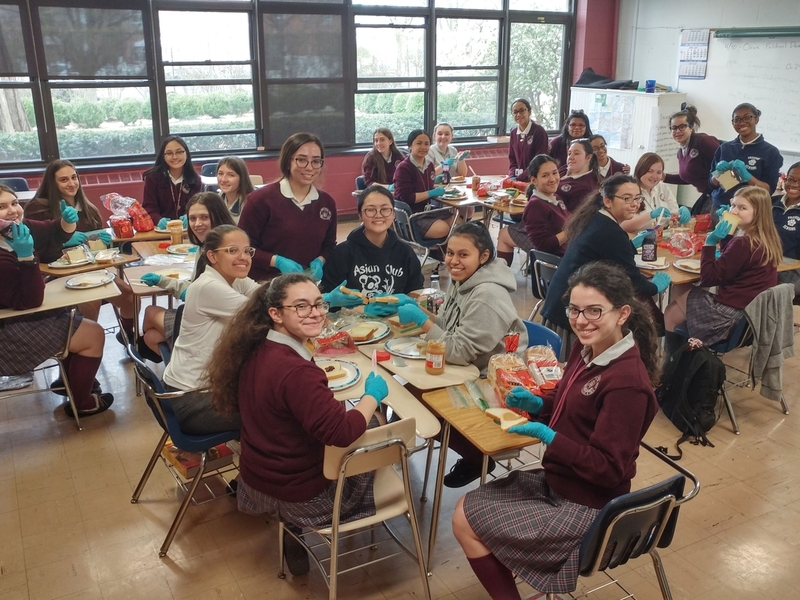 On March 14, 28 club members and volunteers came together to make 160 peanut butter and jelly sandwiches. At this week's meeting, a reporter from News 12 filmed the process, from making of the sandwiches to the weekly delivery to Lamp Ministries. 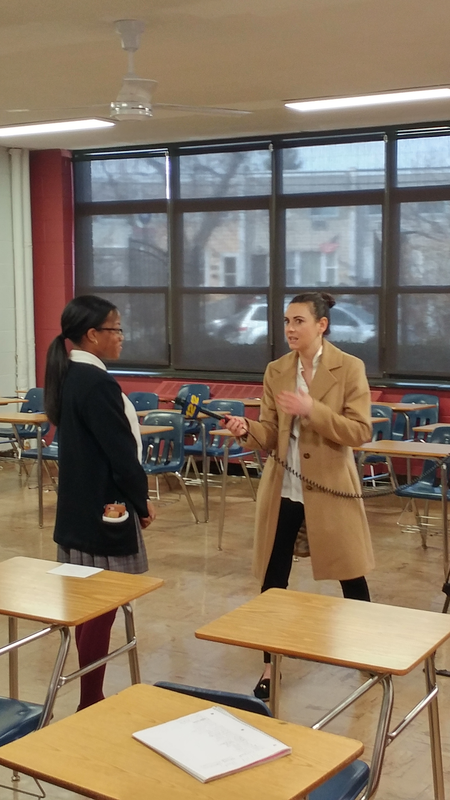 Two club officers, Aiyana Adams and Vicky Escalona were even interviewed! 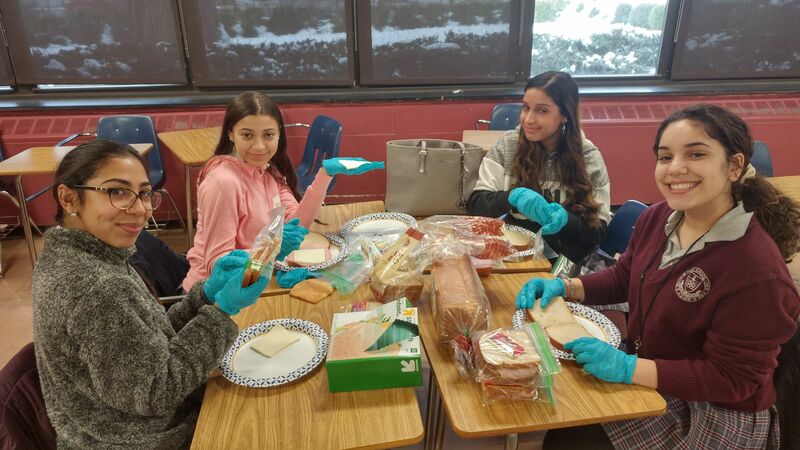 For the next month, Compassion Connection invites all members of the Preston community to stop by room 104 and help make sandwiches! 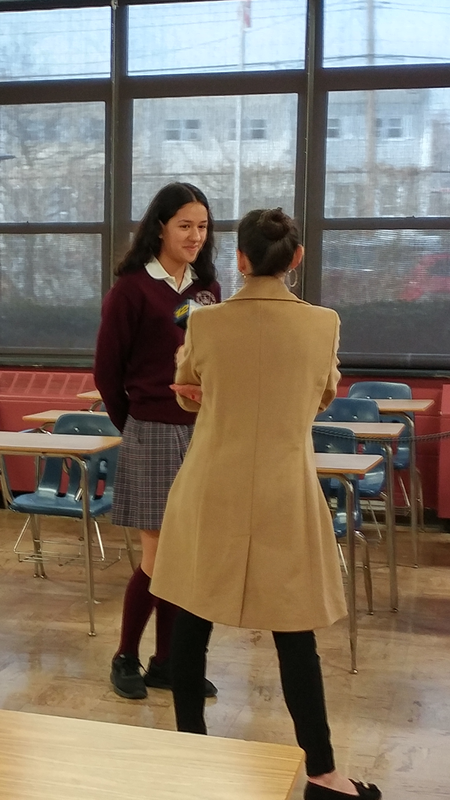 A HUGE thank you to News 12 The Bronx and Compassion Connection for always setting a precedent of compassion for all!! To see the video segment about Compassion Connection on News 12 The Bronx click here. Throughout the entire month of March, the Women's Empowerment Club is hosting a Toiletries Drive for the Sisters of Life. The Sisters of Life is a female Roman Catholic religious institute that is dedicated to the promotion of pro-life causes. Donated items can include, but are not limited to, menstrual pads, deodorants, toothbrushes and toothpastes, soap, shampoo and conditioner. All are invited to donate and place these items in the box in front of the security desk. 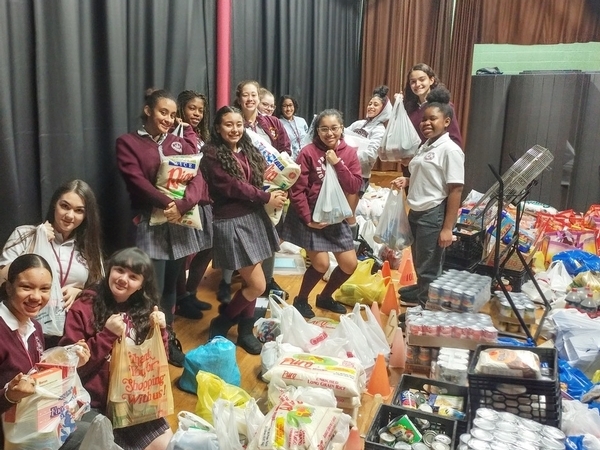 Thank you Women’s Empowerment Club for helping others this Lent! 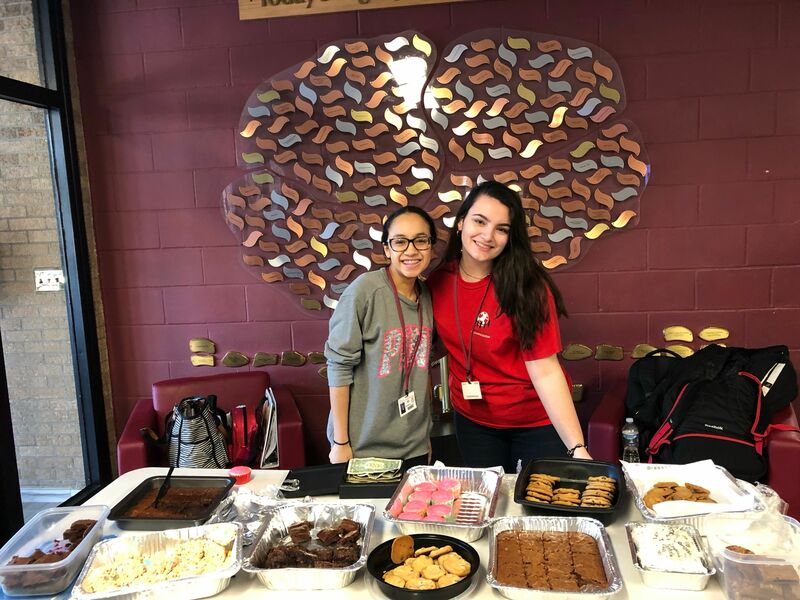 The Albanian Club had a bake sale for Ronald McDonald House, an organization that helps millions of families with sick children by providing support and resources when they need it most. They sold Albanian treats, including baklava, burek and other delicious goodies. From several of their bake sales, they've raised $200, which will be donated to Ronald McDonald House. A huge thank you to Albanian Club for being a model of charity for all! 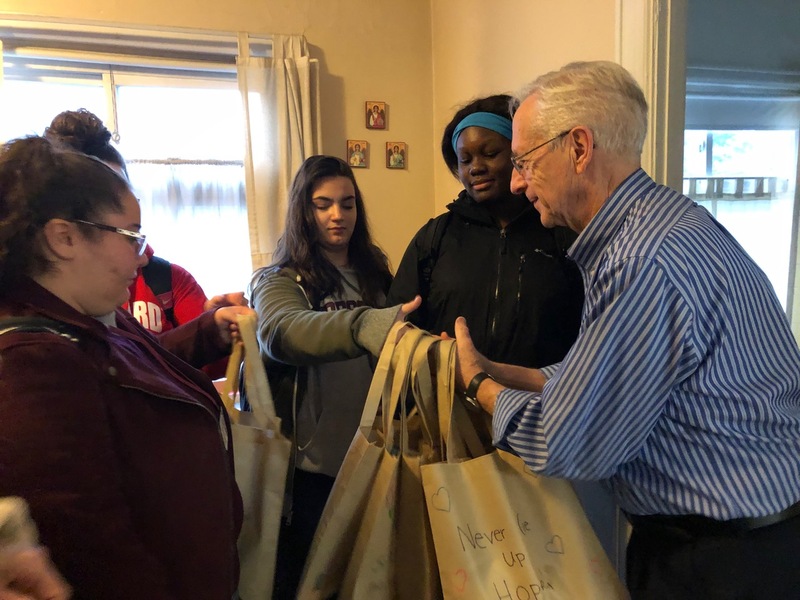 Throughout the six weeks of Lent, Compassion Connection is inviting all members of the Preston community to make sandwiches for Lamp Ministries. 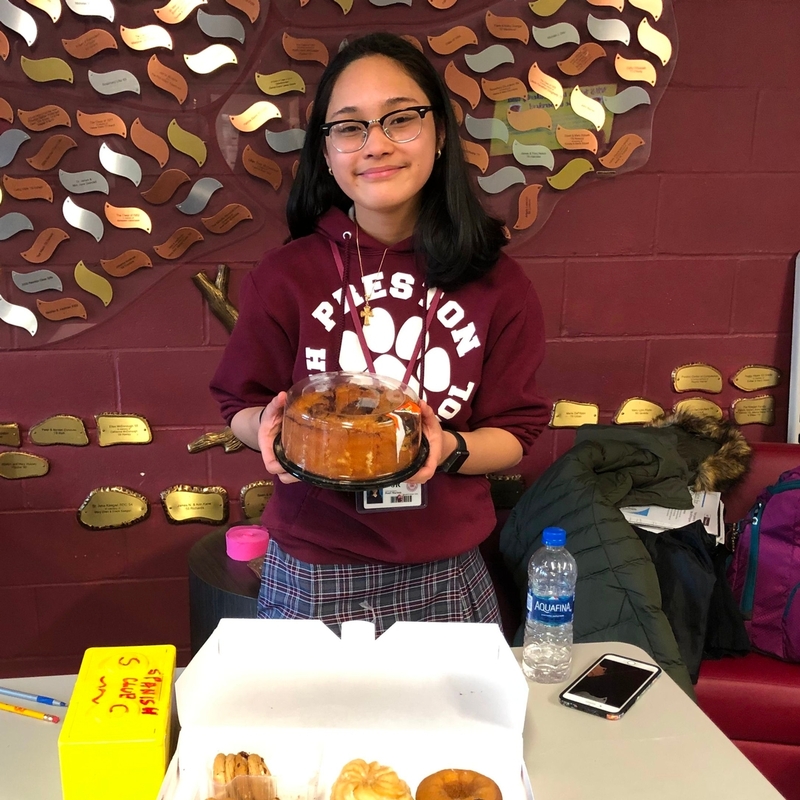 On March 5, Compassion Connection had a bake sale to support these meetings. They made $94 selling homemade brownies, cupcakes, cookies, and rice crispy treats. All proceeds will be used to purchase materials needed for making sandwiches. On Thursday March 7, the weekly sandwich making began! 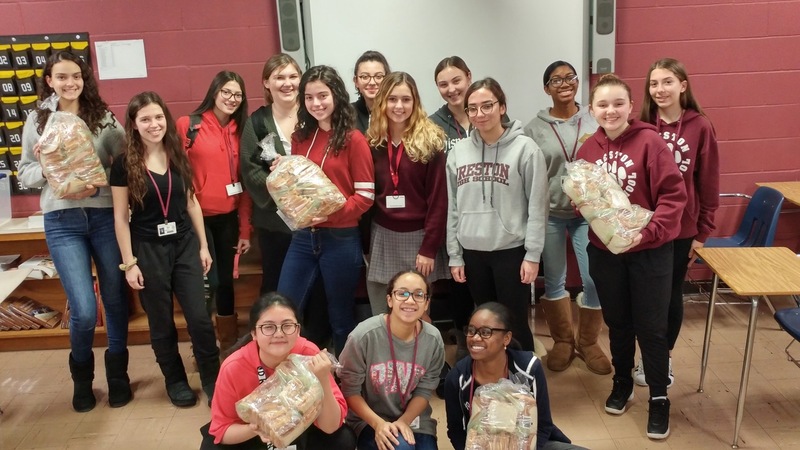 Students made 120 turkey and cheese sandwiches for the hungry in NYC. All are welcome to help make sandwiches every Thursday in Room 104. This Lent, let's reflect on Jesus, the greatest sacrifice, and share our gratitude by helping others. 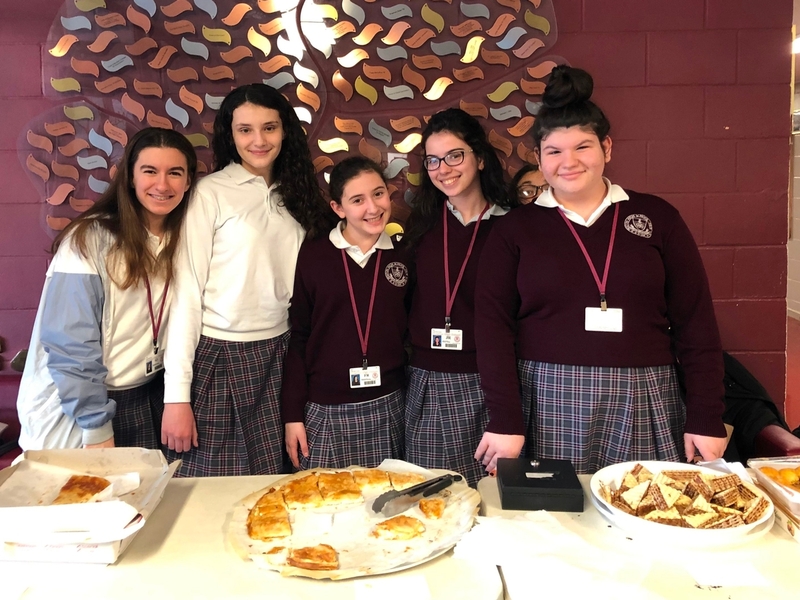 In the spirit of International Women's Day, Italian Club and Italian Honor Society hosted their annual Women's Day Party. 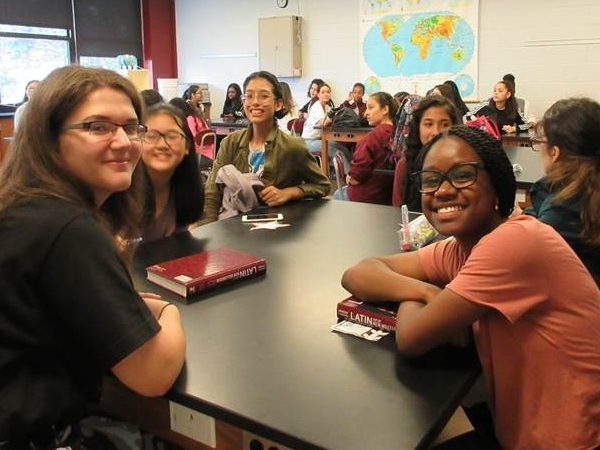 At a club meeting preceding this event, students made packages, including nail polish, lip glosses and chocolates. In Italian classes, students wrote letters for the guests of the party. The event took place on March 7. Guests included senior citizens from Preston's Center of Compassion's Seniors Program and residents of a women's shelter. All were invited to eat pizza and play bingo. Thank you Italian Club and Italian Honor Society for being an example of compassion for all this Lenten Season! 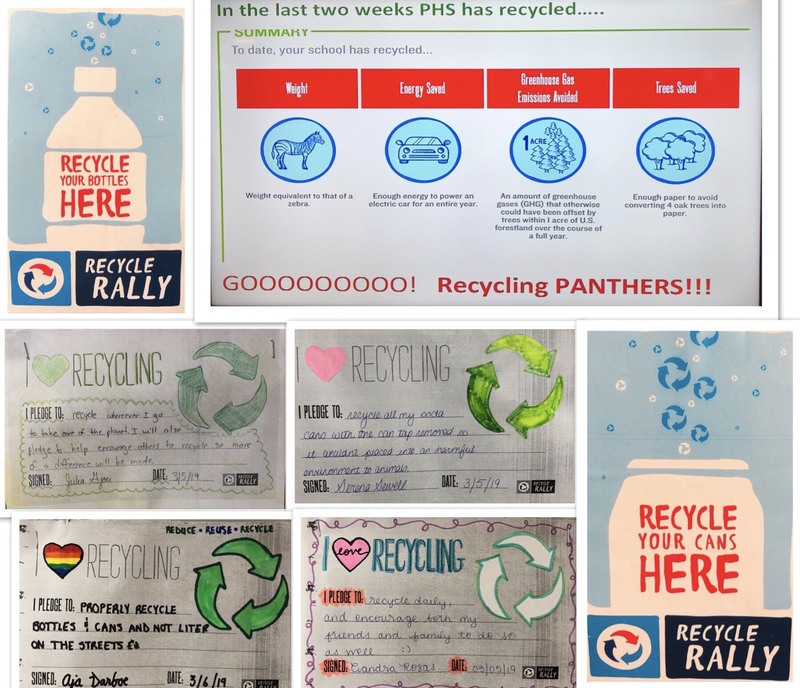 In an effort to bring awareness to the importance of recycling, Preston High School has begun to participate in the Pepsi Rally, a nationwide recycling program that offers opportunities for schools to receive supplies and rewards, motivating students to take care of our environment by recycling. Throughout the school, there are several recycling bins, labeled with stickers and posters, encouraging the Preston community to recycle. 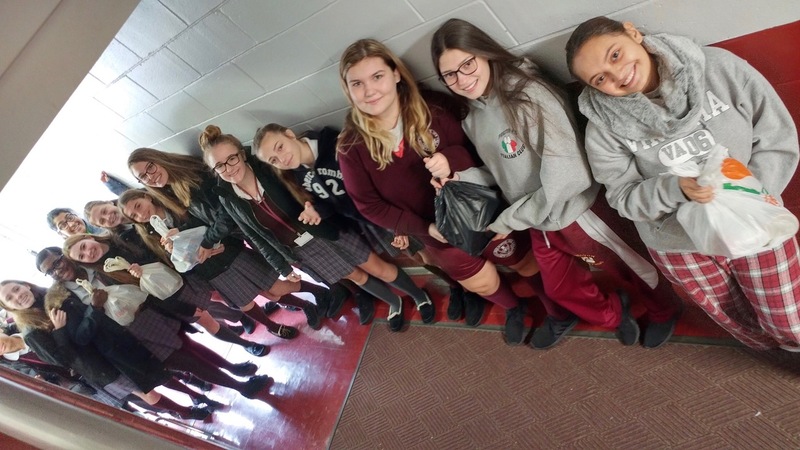 Every week, students in Dr. Zeoli’' Earth Science Honors Class weigh, measure and track our recycling activity in order to earn points. With the recycled bottles and cans, PepsiCo Recycling is able to support post-9/11 veterans with disabilities through their partnership with the Entrepreneurship for Veterans with Disabilities. 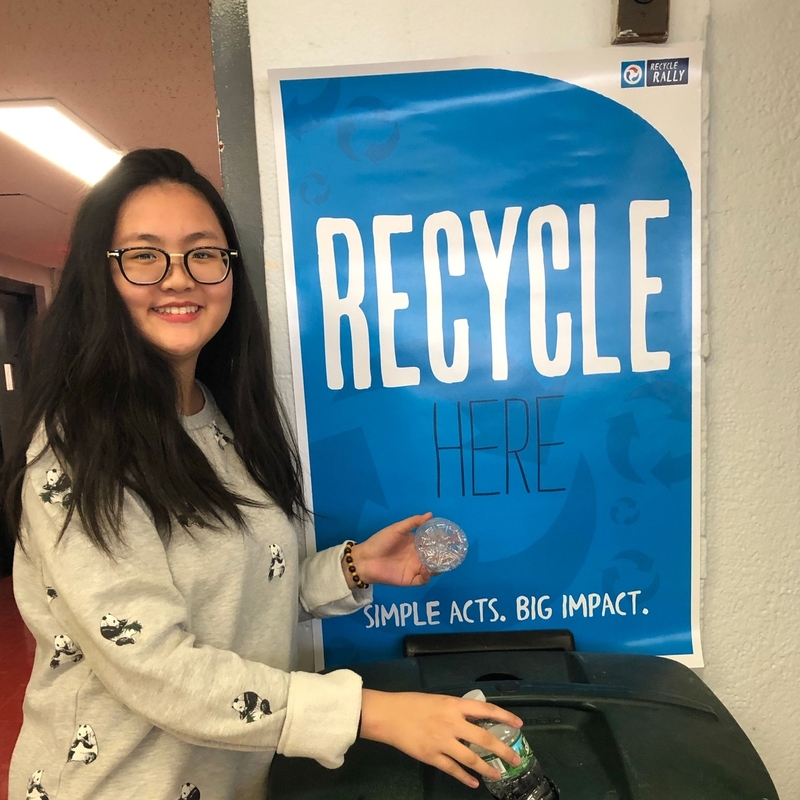 In several science classes, students were instructed to write their own pledges to themselves to reduce, reuse and recycle. Let's be good stewards of the earth by recycling our cans and bottles! 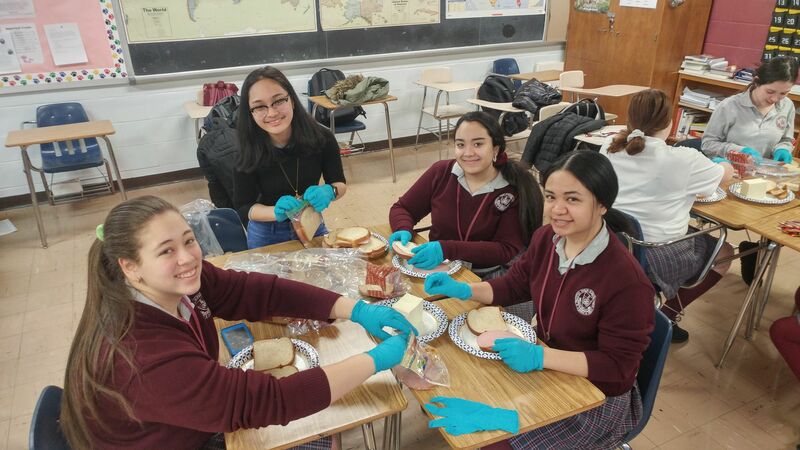 Every week during this Lenten Season, members of Compassion Connection will be making turkey and cheese and peanut butter and jelly sandwiches for Lamp Ministries, who, then, delivers these sandwiches to the poor in New York City. In order to fund supplies for these sandwiches, Compassion Connection will use monies collected from the next 6 Food Fest Friday collections on supplies. 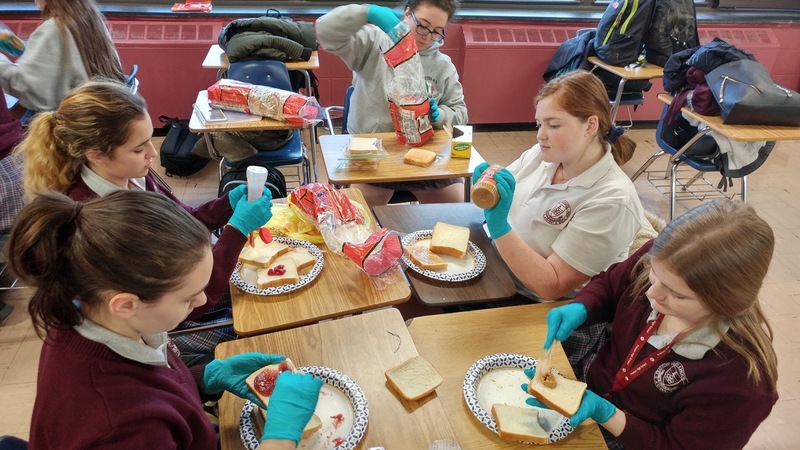 Compassion Connection invites the entire student body to dedicate some of their time to help in making sandwiches for the poor. This Lenten Season, let's be present for those in need and sacrifice some of our time to make other people's lives better! This week's Service Spotlight is on Sam Cruz. Sam is a big sister to a third grade girl named Alexa. At Preston's Center of Compassion's Big Sister Little Sister Program, she helps her little sister with homework and does fun activities with her. In describing her service, Sam said, "Through Big Sister Little Sister, I've gotten to experience what it's like to have a little sister of my own and how I could be a good role model for her." 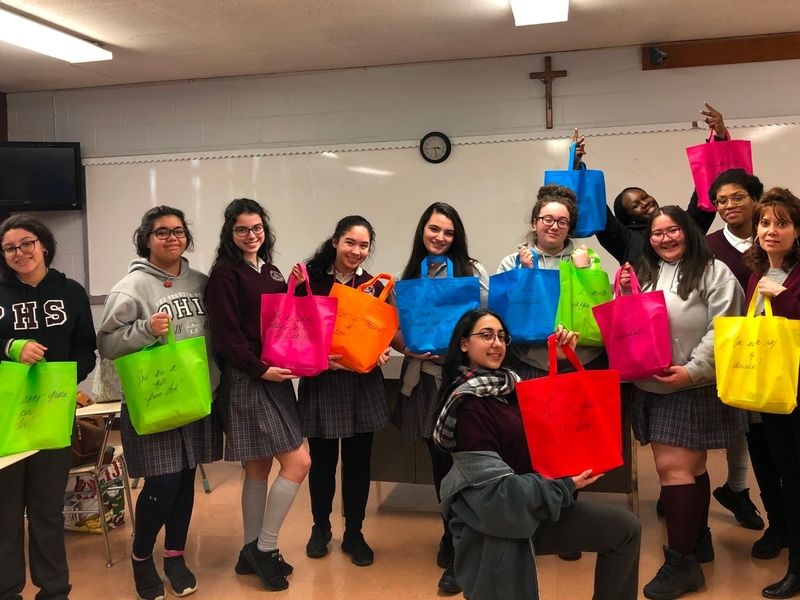 During this season of love, Italian Honor Society made 12 Valentine's Day Packages for Lamp Ministries. 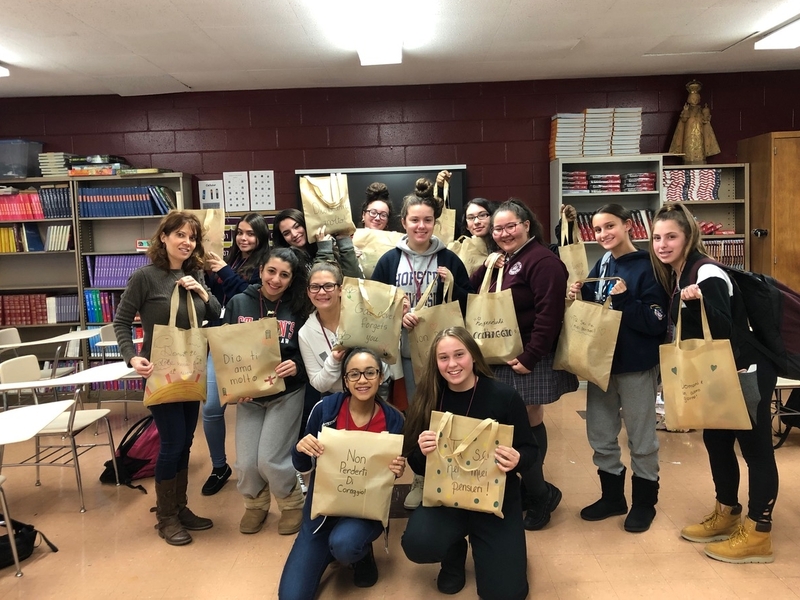 These bags contain toiletries, including deodorants, toothbrushes, and toothpastes, letters from students in Italian and inspirational messages. Lamp Ministries will be delivering these packages to women in shelters. 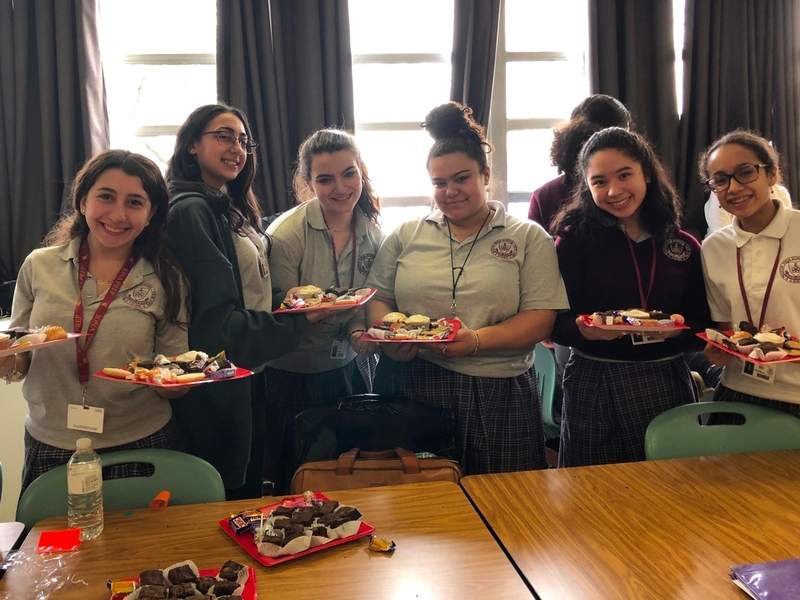 Thank you Italian Club for spreading the love this Valentine's Day! 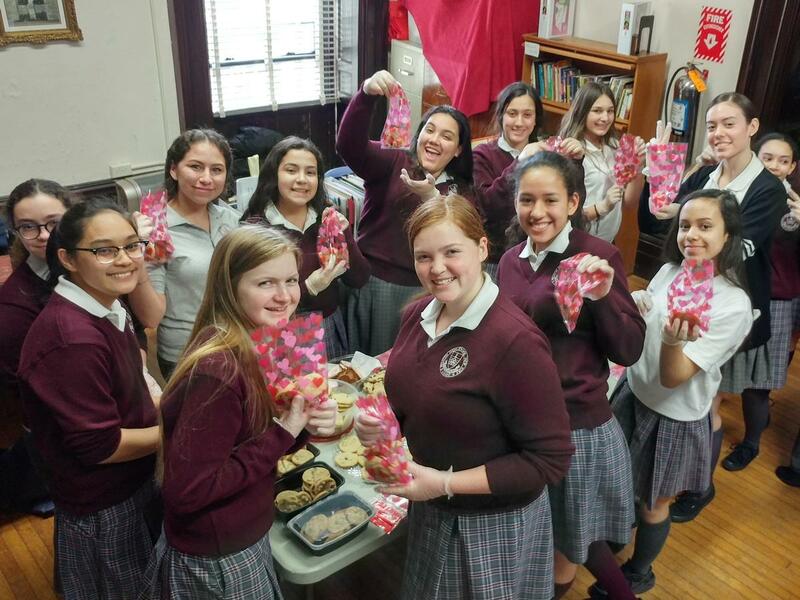 This Valentine's Day season, Compassion Connection sponsored a Cookie Gram Sale for the Children's Heart Foundation. Students and faculty were given the opportunity to send a package of 5 homemade cookies to their friends. On Valentine's Day these packages of cookies were delivered. Through this sale, Compassion Connection raised $330 for the NY Chapter of the Children's Heart Foundation. Thank you Compassion Connection for being a true model of love for everyone every day! 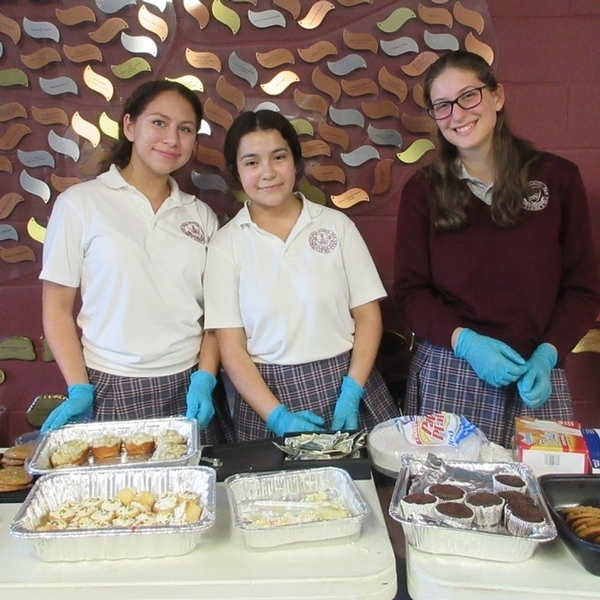 Every year, the Spanish Honor Society hosts bake sales, dress downs and many other events. SHS, then, uses a majority of the money that they acquire from all of these events to sponsor a scholarship for a Preston student. 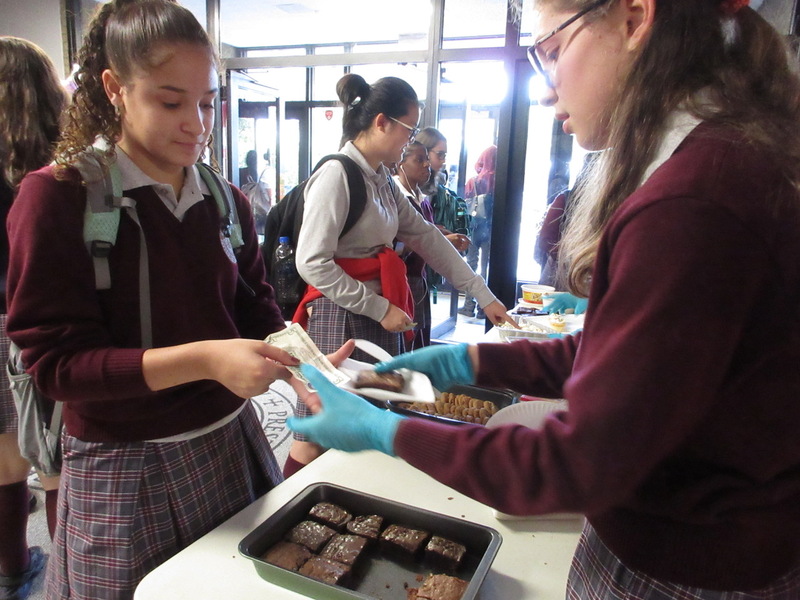 This week, SHS had a bake sale and dress down to raise money for this year's scholarship. A huge thank you to all those who donated! 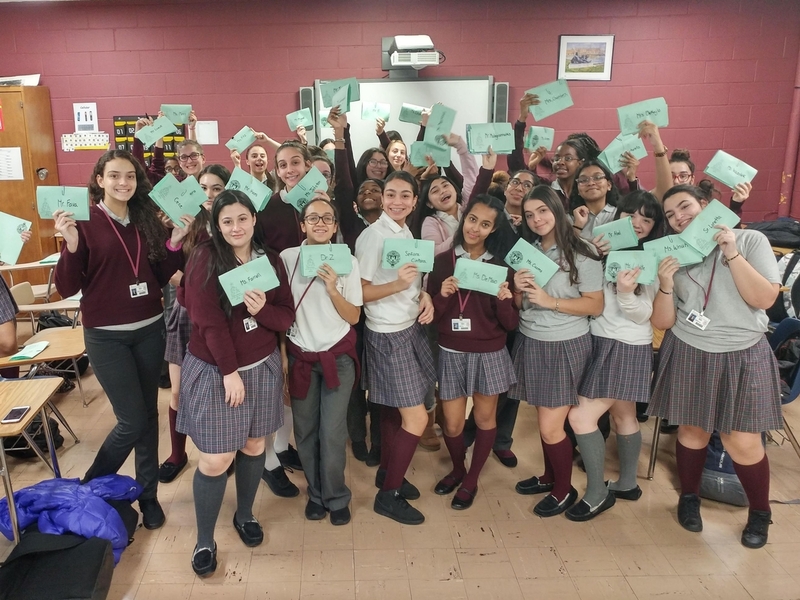 In an effort to brighten up the lives of the elderly and those in service, the National Honor Society is sponsoring a letter collection to support two charities, Love for the Elderly and Operation Gratitude. Love for the Elderly is a non-profit organization, devoted to providing seniors with the love and appreciation they deserve. While Operation Gratitude has a mission of expressing gratitude to those who serve our country by providing Americans with the opportunity to share their appreciation. 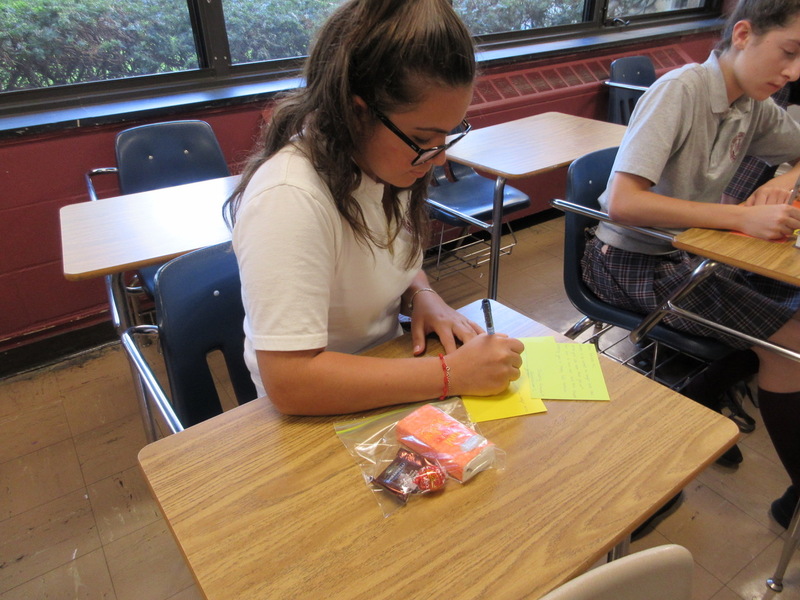 Through this service project, students and faculty are encouraged to write simple, yet creative cards for the elderly and veterans, new recruits and first responders. This shows that a simple act of kindness can truly make an impact on someone's life! Preston's Albanian Club is preparing for their Quarter 4 Can Tab War, a fun yet compassionate competition among all of our cultural clubs. The main goal of Albanian Club's Can Tab War is to collect as many can tabs for the Ronald McDonald House. Through their can tab collections, the Ronald McDonald House is able to raise thousands of dollars to help hospitalized children and their families. Beginning in April, the Albanian Club will accept contributions from the entire Preston community. It's the little things, like the tabs on your cans, that truly make a difference! Start collecting yoru can tabs now! Our Service Spotlight for this week is on Tavia Taylor. Here, at Preston, Tavia is an AV intern for Mr. Teemsma, our Director of Audio and Visual. At any events, that require audio and visual, Tavia is there to help set up and oversee all of the equipment needed. When asked to describe her service, she said, "as an AV Intern, I learned a lot about sound and visuals. Most importantly, how to work with them. Working with Mr. T has been a fun and enlightening experience." After the holiday season, Compassion Connection collected recycled Christmas-themed card tops for St. Jude's Ranch. With these card tops, St. Jude's Ranch makes new cards that are sold to the public. Throughout the year, they accept card fronts for all occasions. The proceeds from the new cards are used to help provide for abused and neglected children in Nevada. With mid-term exams around the corner, the Preston community sent motivational messages through the Gaelic Society's Good Luck Gram Sale. 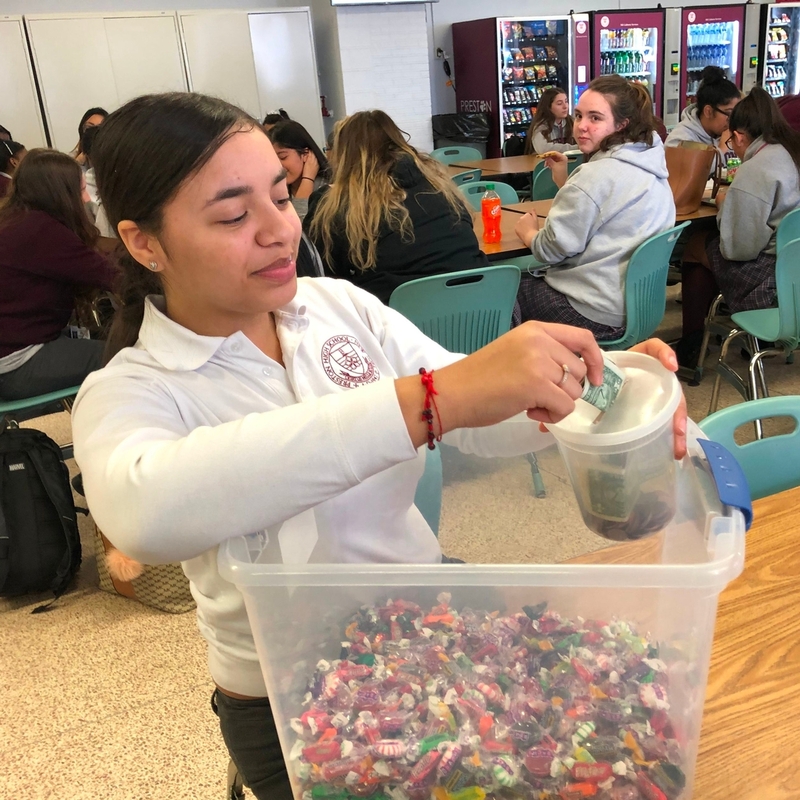 With these Good Luck Grams, students and faculty were given the opportunity to order packages of candy or cookies to wish good luck to their friends for mid-terms. All proceeds will go to Project Children, an organization that coordinates aid for children in Northern Ireland. This school year has been the best year for Food Fest Friday collections yet! Thus far, Compassion Connection has raised a total of $260 of spare change! 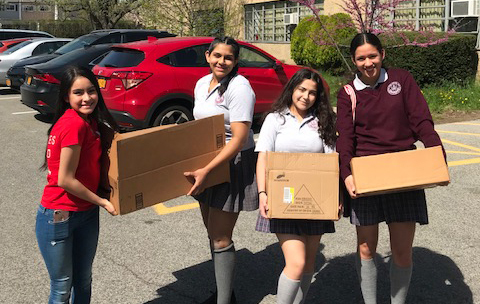 In the first quarter of the school year, with these donations, Compassion Connection was able to support several organizations, including NYC Rescue Mission, Food Bank of NYC, St. Francis Breadline, and CityMeals on Wheels. In the second quarter, CoCo used collected monies to purchase supplies to make turkey & cheese and peanut butter & jelly sandwiches that were donated to Lamp Ministries. This only shows that at Preston, every cent counts! A huge thanks to everyone who donated! Every year, Compassion Connection participates in Altice USA's Charity Champions Program. 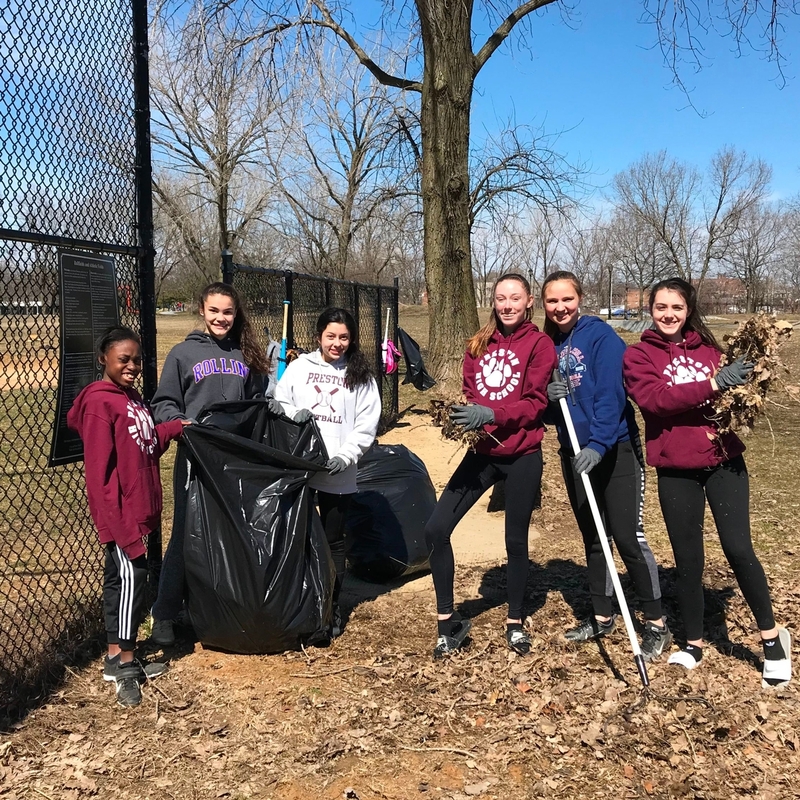 This is a contest designed to help participating schools demonstrate their community service by planning and organizing events to raise funds to help a charity of their choice. 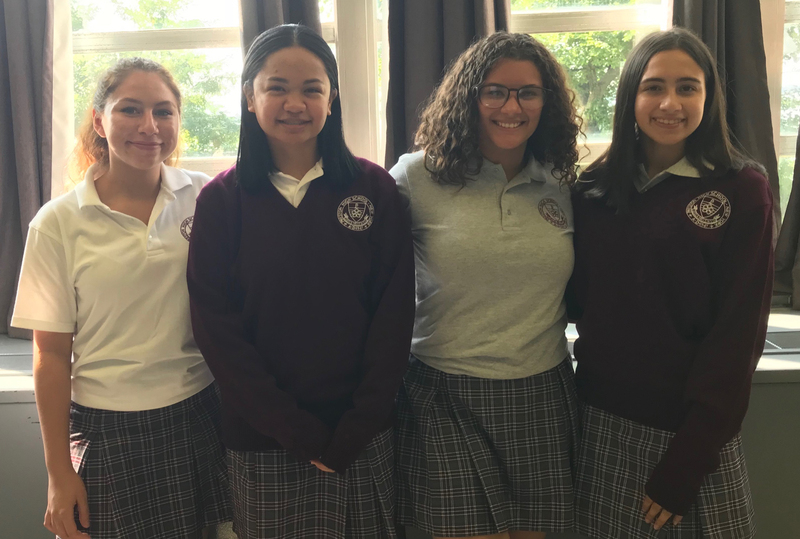 For simply participating, Compassion Connection received $250 to support and implement fundraising events throughout the school year and another $1,000 to donate to a charity of their choice. This year, they have decided to donate this money to Lamp Ministries, a Catholic missionary association that is closely affiliated with Compassion Connection. Every time Compassion Connection makes sandwiches - it is Lamp that delivers them to the hungry! 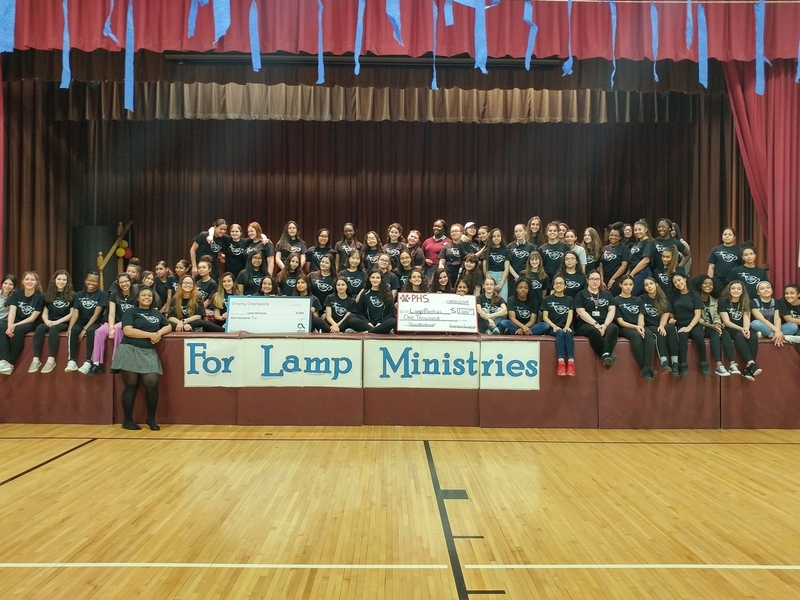 With these donations, Lamp Ministries and Compassion Connection can continue to do good works for our community! To start off the year on a positive note, Compassion Connection helped feed the poor in NYC. 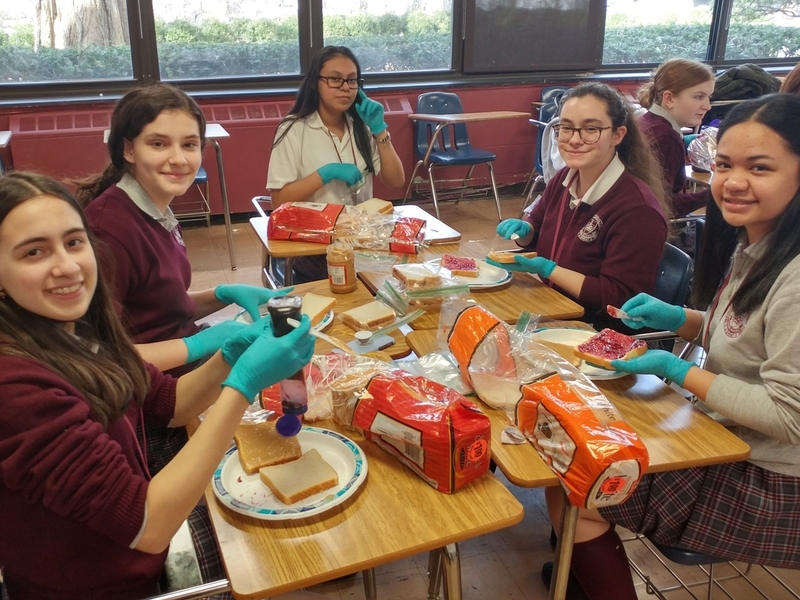 At their first meeting of 2019, members made peanut butter and jelly sandwiches, that Lamp Ministries will distribute to the homeless. With these sandwiches, Compassion Connection was able to feed 120 hungry people. Thank you Compassion Connection for your service to our community! Our first Service Spotlight of the year is on Cordelia Vohnout. At Fancy Feet Dance Studio, Cordelia is an assistant coach to young children. 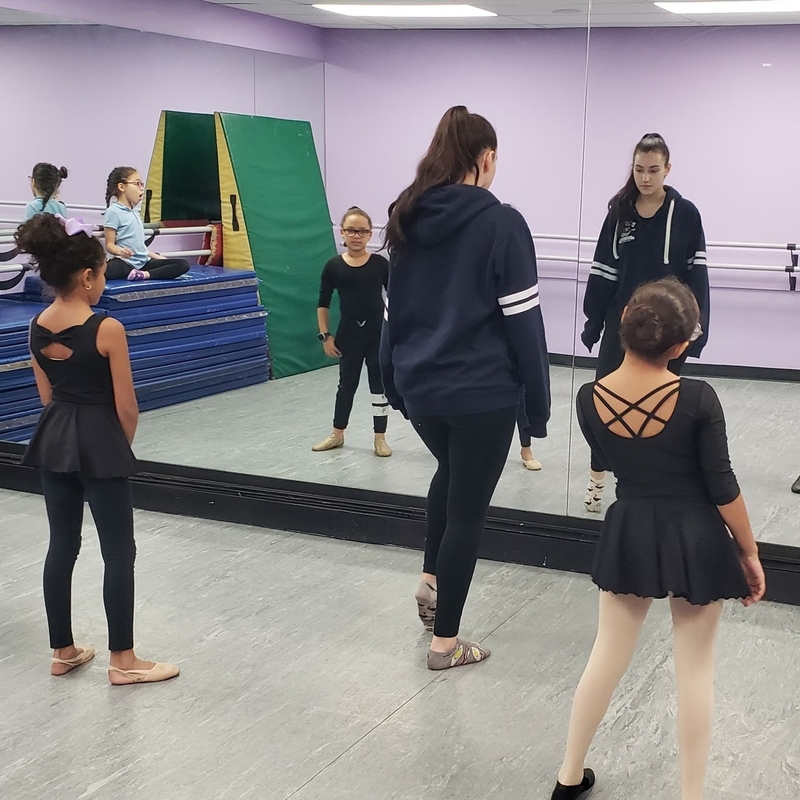 In describing her service, Cordelia said, "I'm so grateful that I get to share my love of dance and mentor the younger students at my studio." 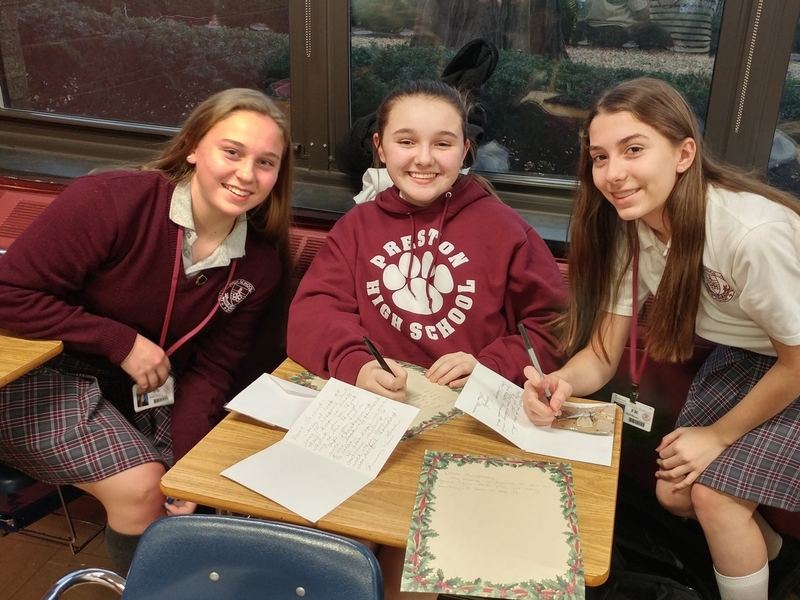 In honor of the Advent season, the student body was given the opportunity to write Christmas letters to the faculty and staff. 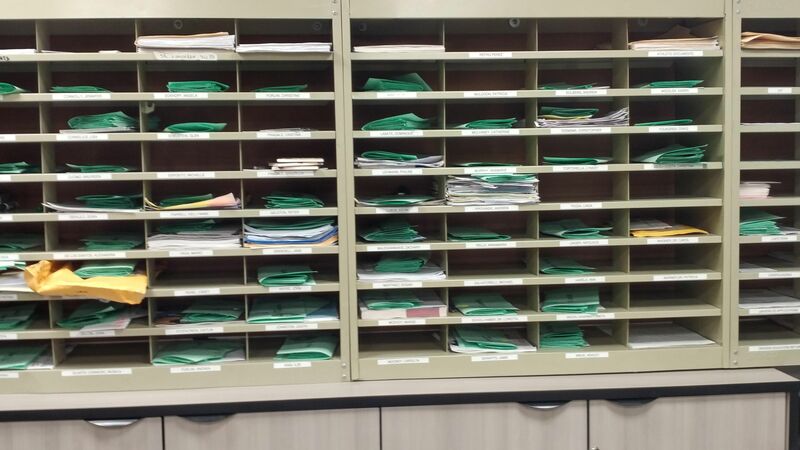 All of these letters were then collected, separated, and distributed to our faculty and staff members in time for Christmas by our helpful sophomores. Thank you Sophomores for your service! 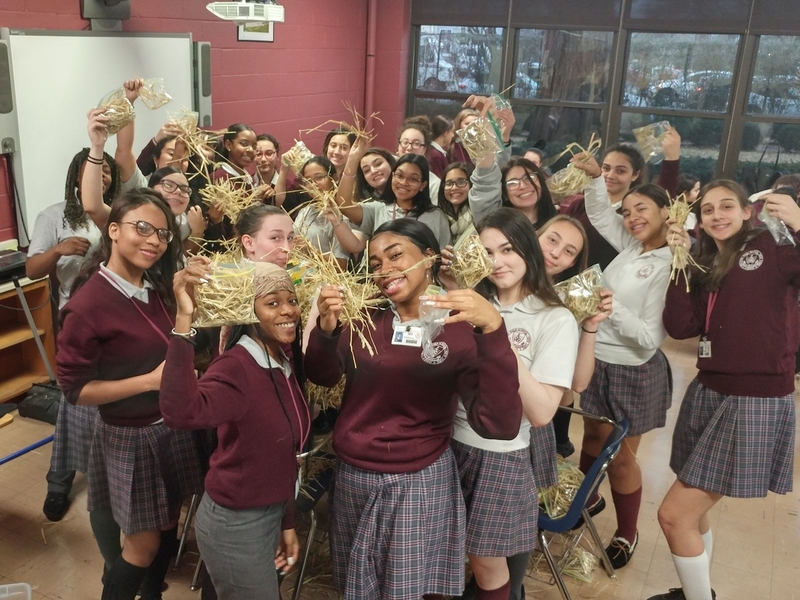 For our Christmas liturgy, our sophomores volunteered to package 500 bags of hay for the Preston community. 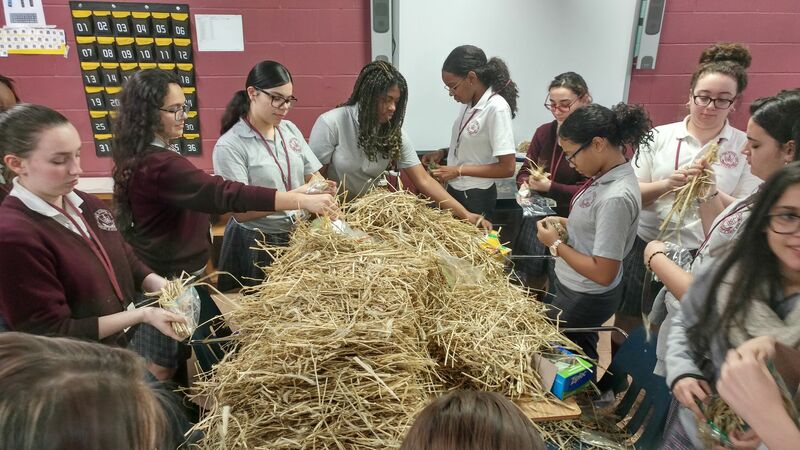 The hay serves as a symbolic representation to all of us of the birth of Jesus, the King of Kings, in a manger. At the mass, these bags of hay were blessed and distributed to everyone. 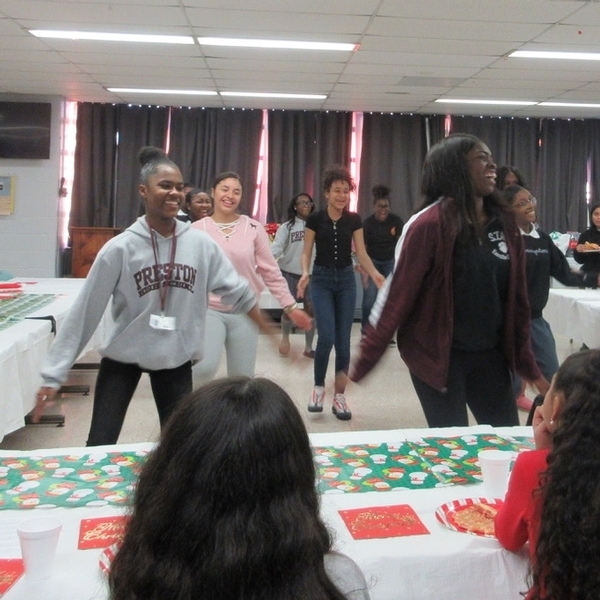 At the Big Sister Little Sister Christmas Party, Preston's Step Team performed a special routine for their audience of Bigs and Littles. The Step Team always goes out of their way to perform every year. Our little sisters and big sisters really enjoyed this year's performance. Thank you Steppers for sharing your beautiful talent with us! 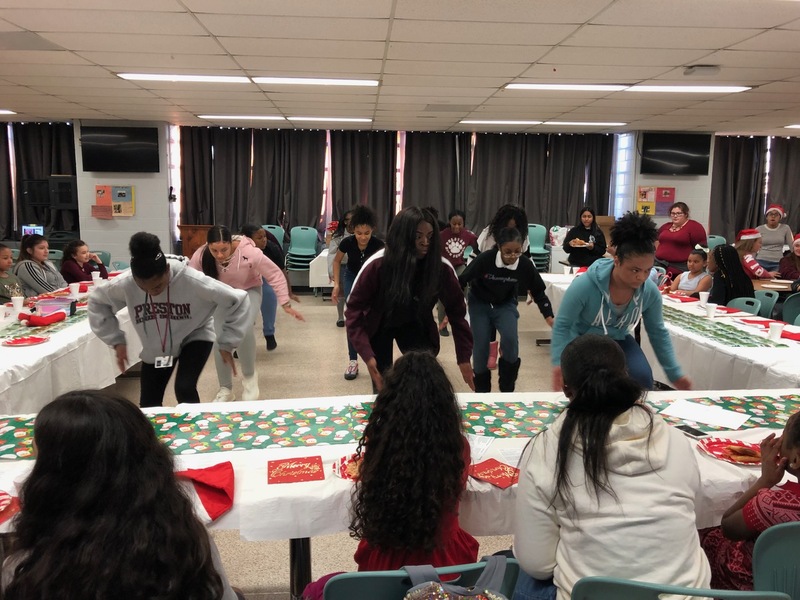 During the Christmas season, Compassion Connection hosts the Big Sister Little Sister Christmas party. 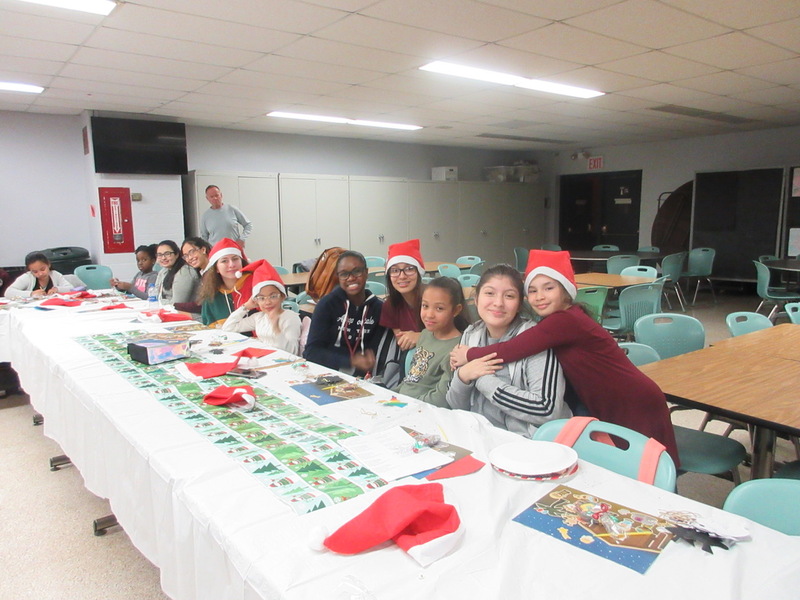 Every year, members of Compassion Connection bakes Christmas goodies and organize several fun activities for the little sisters and big sisters. 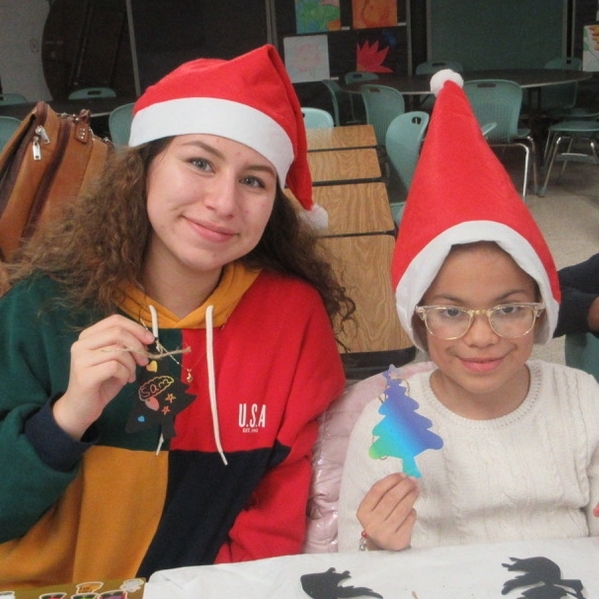 At this year's party, the Bigs and Littles enjoyed pizza and home-made Christmas-themed treats, made Christmas sticker posters, sang Christmas carols, and made ornaments. A big thank you to all those who contributed to creating such a wonderful Christmas event! Our second Service Spotlight is on Chidinma Ohadoma. 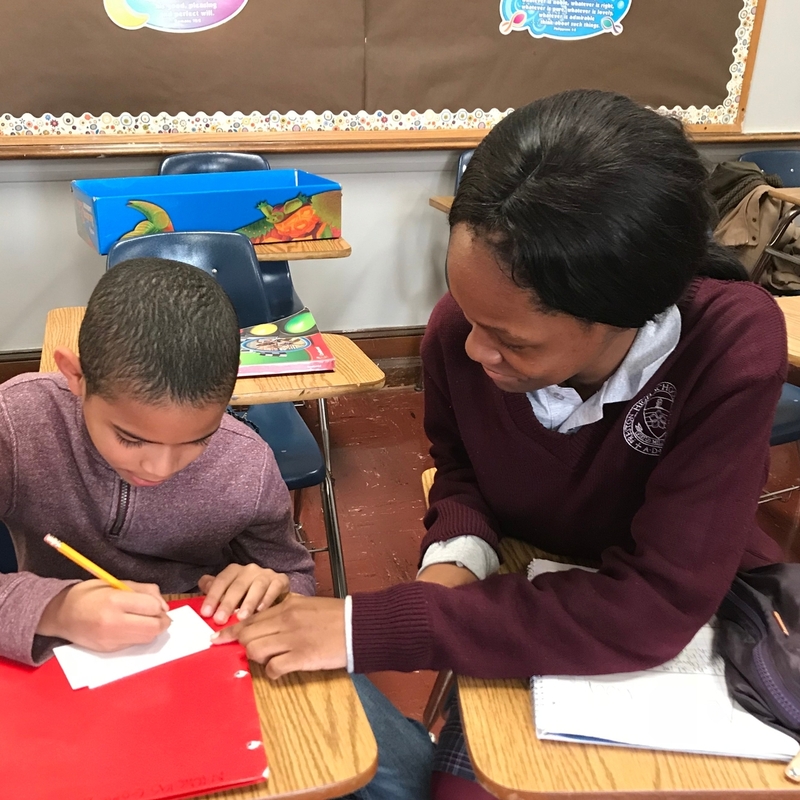 At Preston's Center of Compassion Afterschool Program, Chidinma is a tutor to children from Kindergarten to Eighth Grade. When asked to describe her service, Chidinma said, "I am so grateful that my service has given me the opportunity to educate kids in my community and make them excited to learn." 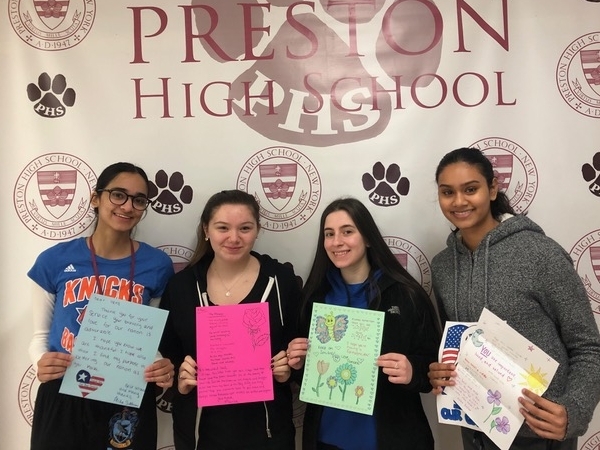 To continue to foster their relationships with residents of Providence Rest Nursing Home, members of Compassion Connection wrote letters to their pen pals. In these letters, they spoke about their favorite subjects, hobbies, and extra curricular activities. 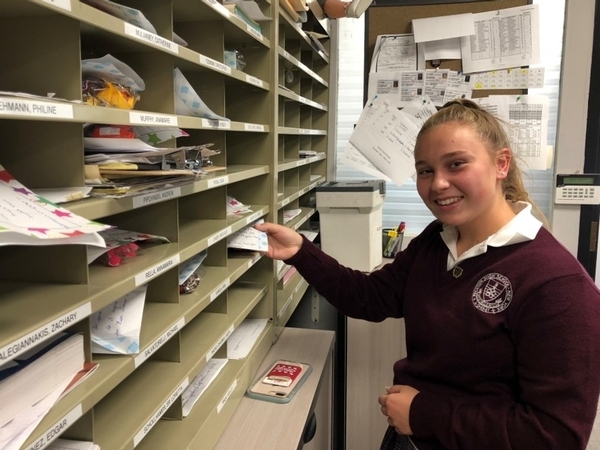 Throughout the school year, Compassion Connection members will continue to write letters to their new "pals." This week's Service Spotlight is on Lauren Romeo. Lauren is an intern explainer at the New York Botanical Gardens. At her site, she walks young children through educational activities. 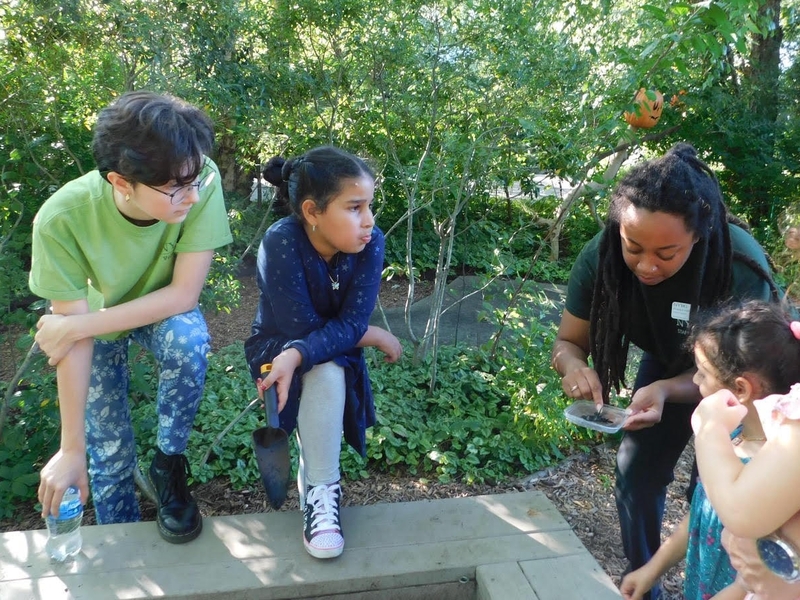 In describing her service, Lauren said, "Working in ecological education helped me to spread my love of nature with children and adults of all ages, and being able to give back to a community which nurtured my love in nature has truly enriched my life." With the donations from previous Food Fest Friday collections, Compassion Connection was able to make 120 turkey and cheese sandwiches for Lamp Ministries. Lamp Ministries ministers to the materially poor in NY City through Catholic evangelization. Thank you Compassion Connection for helping Lamp feed the hungry. And thank you being an example for others this Advent season! Our Service Spotlight for this week is on Marina Siskos. Marina works as an assistant at Zoodohos Peghe Orthodox Church in the Sunday School Program. When asked to describe her service, Marina said, "I have learned that teaching kids about God is fun and enjoyable." 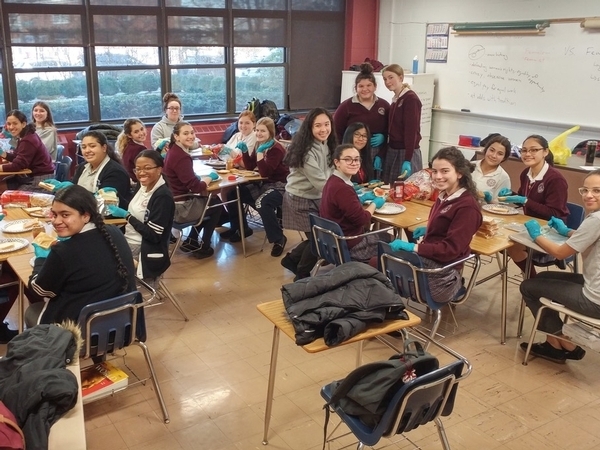 On December 3, the National Honor Society sponsored a Potluck to raise money for the National Autism Association. At this event, the National Honor Society was able to raise $360. All proceeds from the Potluck and sale of Autism Awareness bracelets will be donated to this association. Thank you to all those who came and supported! For years, Compassion Connection has been donating boxes of little gifts through Operation Christmas Child. This is a project of Samaritan's Purse through which people share God's love with children in need through gift-filled shoe boxes. (Last year over 11 million such shoe boxes were collected.) 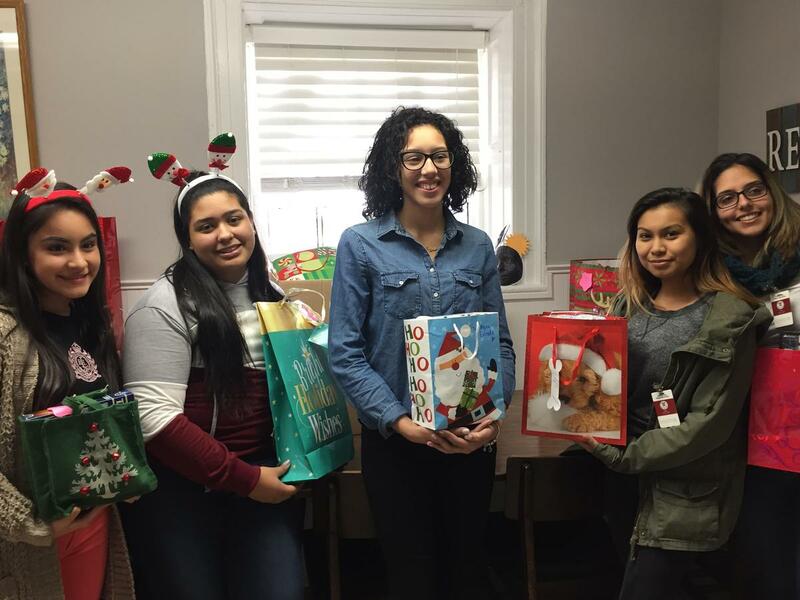 Members of Compassion Connection were able to fill 20 shoe boxes with toys, gloves, crayons, bath products, and other necessities. This holiday season, let's give compassion to those who need us the most! After four weeks of resisting the razor, No Shave November is officially over! 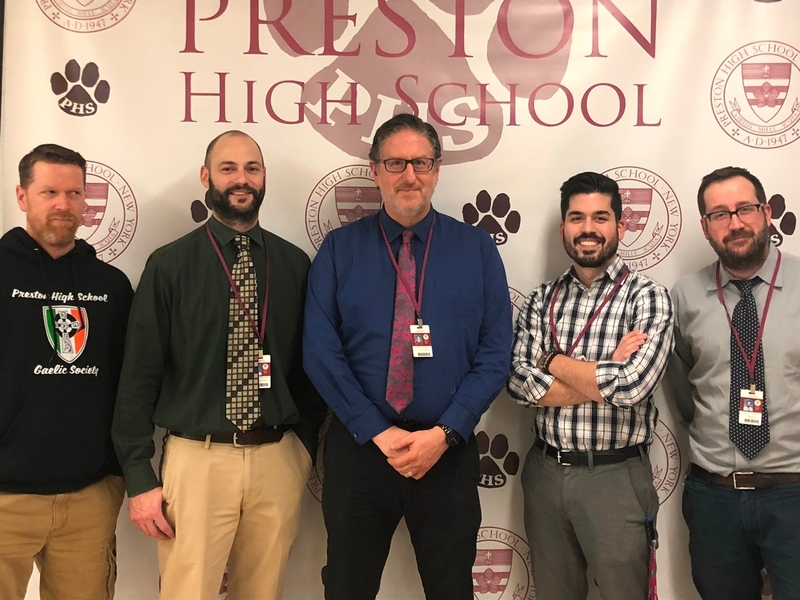 With the help of the Preston community and other donors, Mr. Carneiro, Mr. Pipchinski, Mr. Teemsma, Mr. Edelstein, and Mr. Youngren surpassed their goal and were able to raise $715 for cancer research. Thank you very much for all of your donations. Let's continue to raise cancer awareness and educate others about preventative measures. 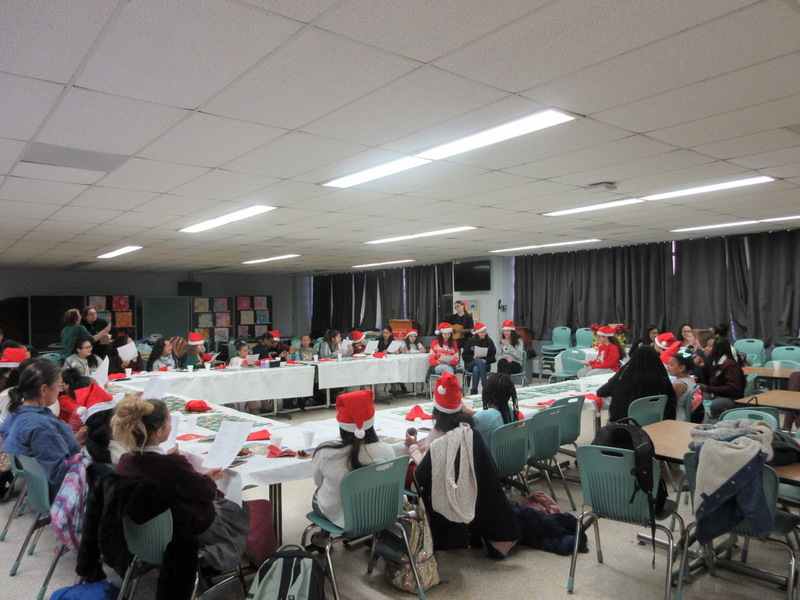 Each bag included hats, scarves, gloves, candy, and letters in Italian and English from members of the Italian Club. 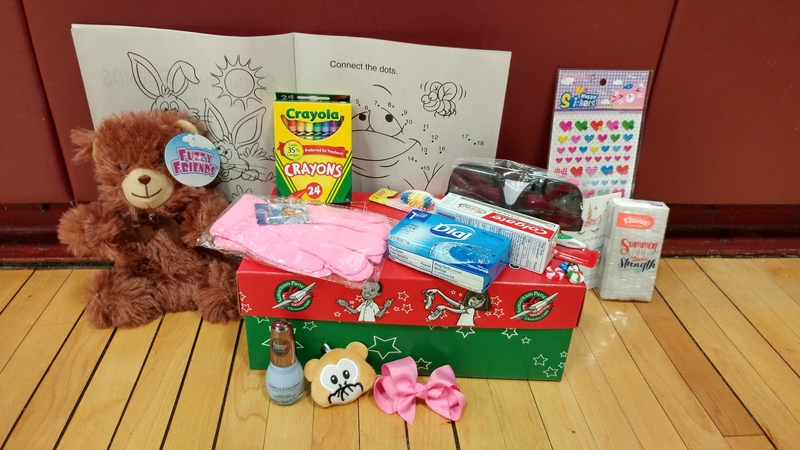 With these items, the Italian Club was able to help 15 families with children and parents. 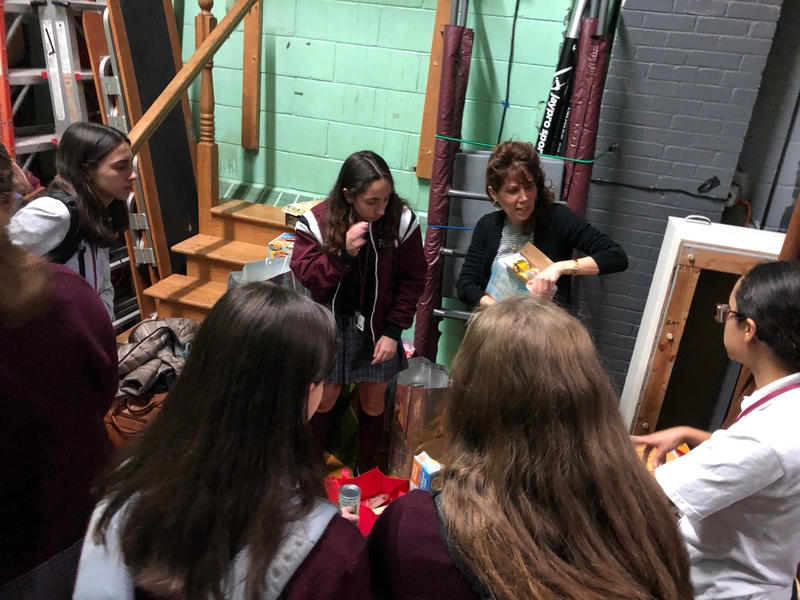 Thank you Italian Club for always offering your time and service to those in need! This week's Service Spotlight is on Antonia Paturzo. 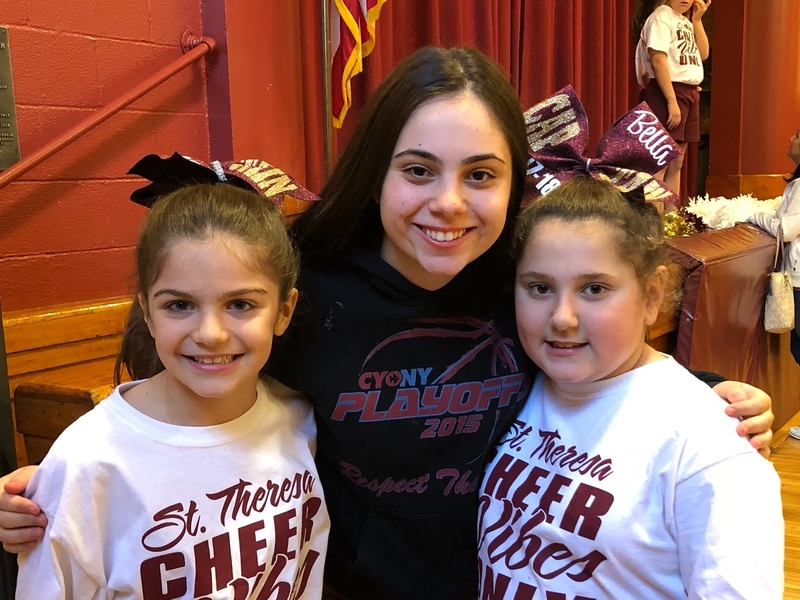 At St. Theresa, Antonia is an assistant coach for the cheerleading team. 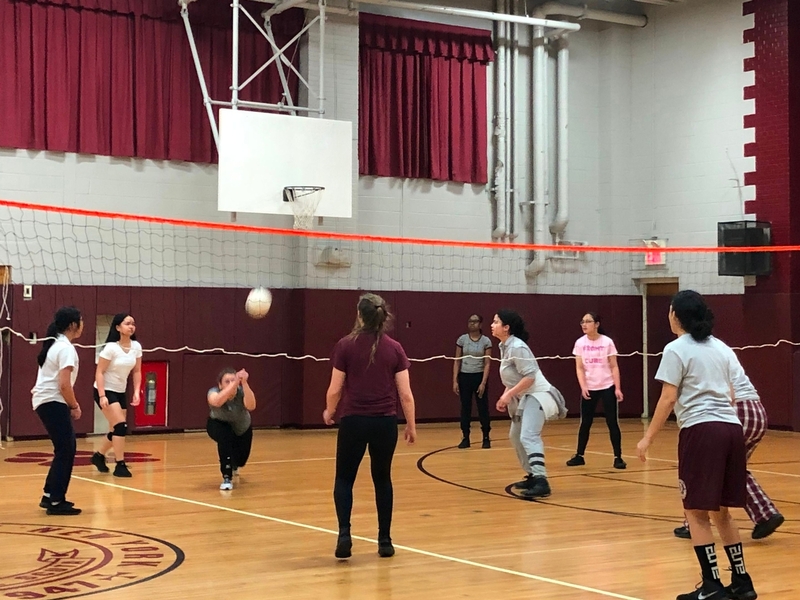 In describing her service, Antonia said, "Doing my service at my old elementary school, St. Theresa, has allowed me to teach young children the fundamentals of sports and has helped me to get more involved in both the school and neighborhood communities." Thank you, Antonia, for your service! 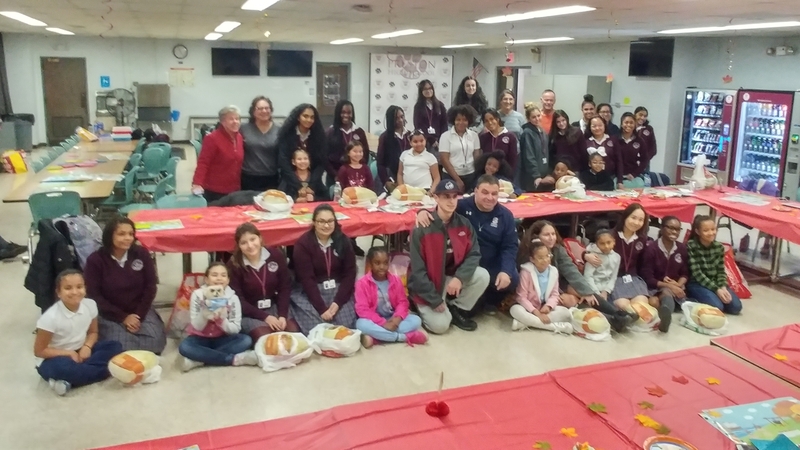 Every year, Compassion Connection hosts the Big Sister Little Sister Thanksgiving Party. Big Sister Little Sister is an after school program sponsored by Preston Center of Compassion, in which 16 third graders from P.S. 72 in the Bronx are paired with 16 juniors from Preston High School. These juniors act as big sisters and mentors to the little girls by helping them with their homework along with doing fun activities. 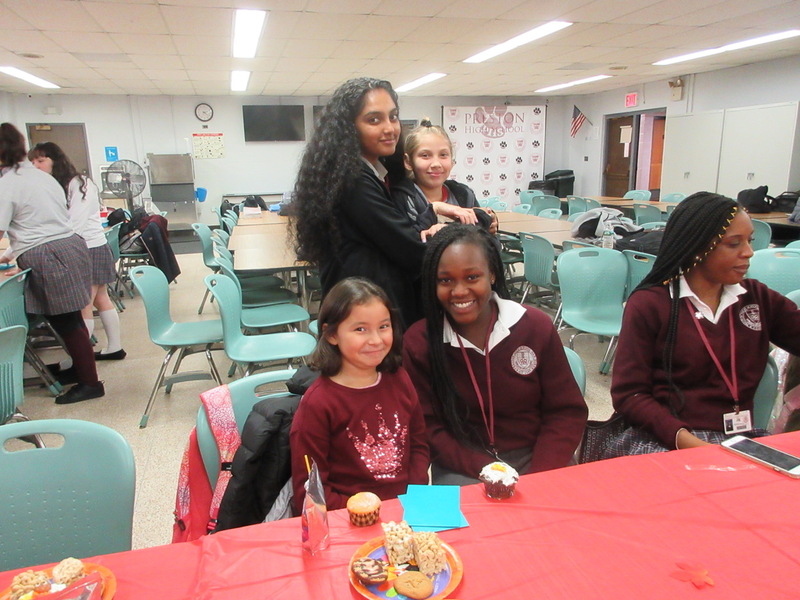 At this year's party, the Bigs and Littles enjoyed home-made Thanksgiving-themed baked goods and participated in a variety of activities ranging for Thanksgiving sticker posters to Turkey Kahoot. 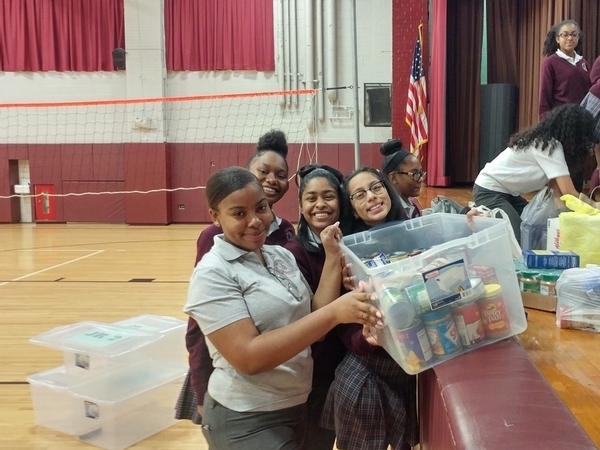 To top off the festivities, each little sister received a frozen turkey and a package of food for their families to be able to celebrate Thanksgiving. Thank you to all those who contributed. These packages definitely made the little girls very happy! 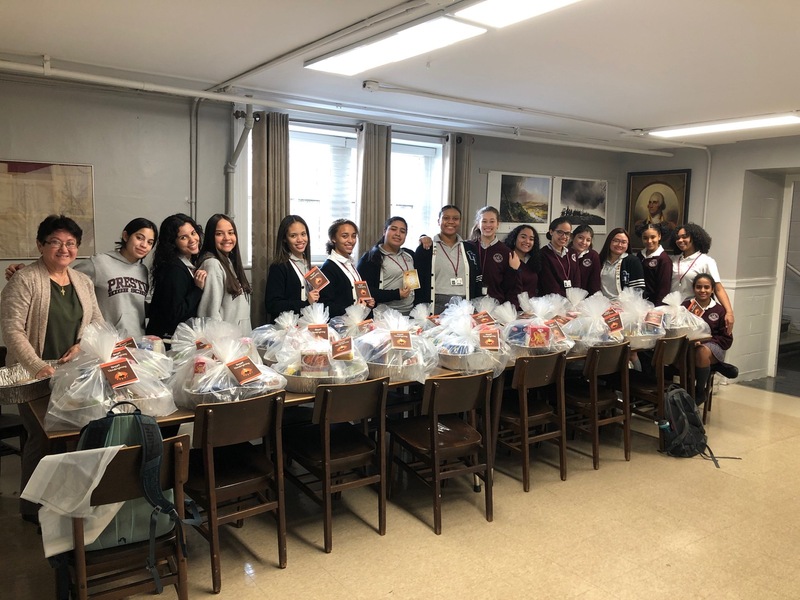 In honor of the giving season, Preston's Spanish Honor Society made Thanksgiving baskets for 30 families of Santa Maria Parish. 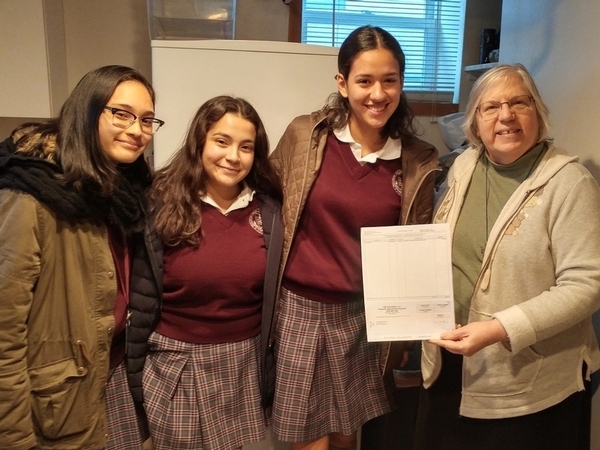 For many years now, the Spanish Honor Society has maintained a close relationship with Santa Maria and annually gives donations to them.These packages included turkeys, stuffing, soup, and canned vegetables and fruit from Preston's Thanksgiving Food Drive. Thank you Spanish Honor Society for taking the time and energy to create these packages to warm others' hearts during the Thanksgiving holiday! The top 4 highest donating homerooms were Senior 2- Señora Varela, Senior 3- Ms. Wicks, Senior 1- Ms. Connolly, and Junior 4- Ms. Farrell. 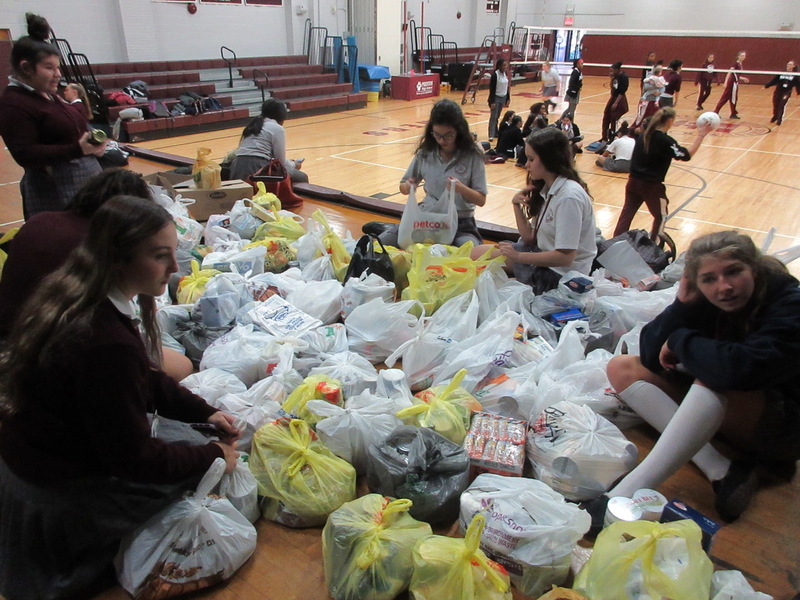 Thank you so much to everyone who played a role in making our Thanksgiving Food Drive a success! This all could not have been possible without the help of everyone who donated food or money, and offered their time to help organize and weigh the food. Ms. Farrell deserves a special shout out. Since she started teaching at Preston, her homeroom consistently places in the top 4! And a special thank you to Alumnae Gabriela Johns (Class of 2018), Michelle Luchetti (Class of 2008), and Caroline Ozdemir (Class of 2014) for dropping off food to support our efforts! 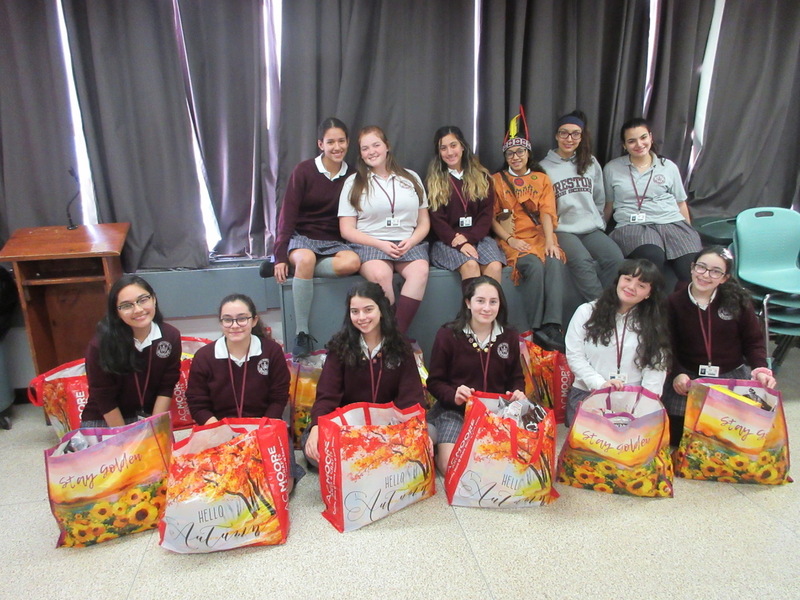 In preparation for Thanksgiving, the Italian Club made and delivered packages to Lamp Ministries. 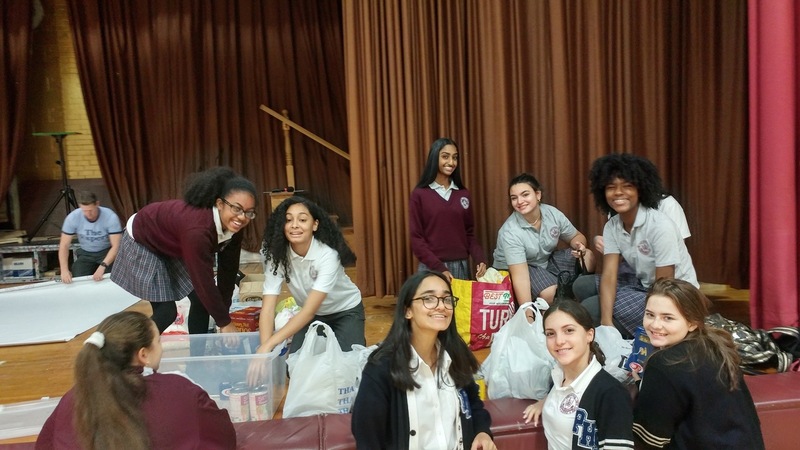 With contributions from the Preston Community from our Thanksgiving Food Drive, the Italian Club was able to make 15 packages. These packages consisted of cereal, rice, fruit and vegetable cans, soup, and personal letters from several Italian Club Members. These donations will surely help many families this Thanksgiving! With just 2 days left of the Thanksgiving Food Drive, the Preston Community is well over halfway to our goal of 10,000 pounds. As of today, we have raised 6116 lbs of food. That's 3884 lbs to go! Please bring in food to help those who need our help. Several pantries are counting on us and there are over 100 Thanksgiving packages to be made... Let’s show everyone that 5 tons of food is nothing for the Compassionate students of Preston! Compassion Connection also had a bake sale this week, to raise money for Hour Children. In 1986, Hour Children, a leading provider of services for incarcerated women and their children, was founded to acknowledge the important relationship between a mother and her child. This organization continues to help incarcerated women and formerly incarcerated women and their children by providing community-based services and in-prison programs, including housing, employment training, case management and therapy, and transportation and visitation services. Thank you to all those who helped raise $72 for this compassionate organization! 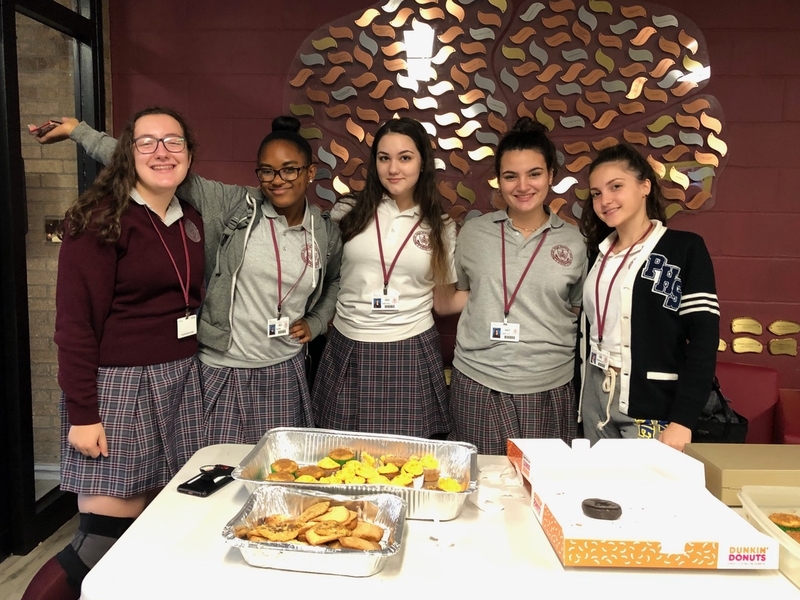 On November 6th, the Italian Club held a bake sale to raise money for future projects that will benefit the homeless. Monies raised will be used to purchase supplies for packages, that will be delivered to Lamp Ministries. 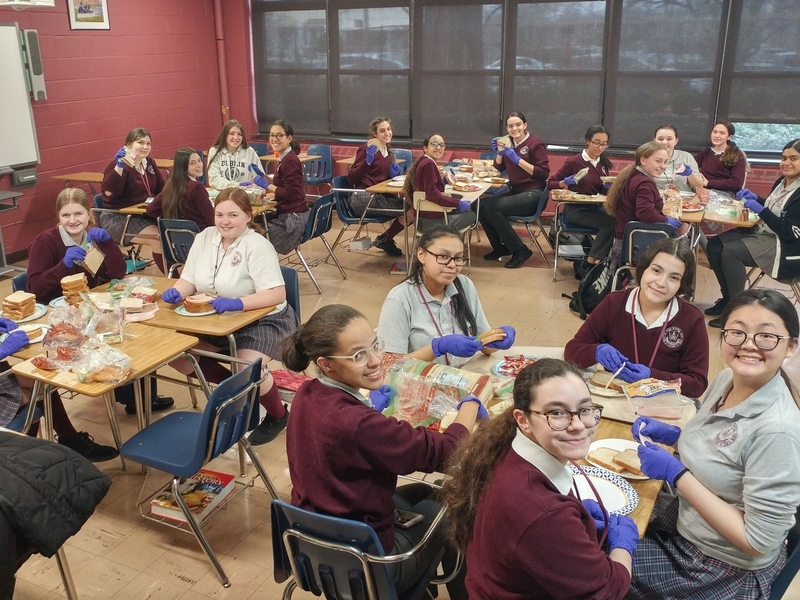 During this holiday season, the Italian Club will make and deliver several packages for Thanksgiving and Christmas, including food from the Thanksgiving food Drive, hats, gloves, and scarves. A big thank you to the Italian Club for setting an example of Compassion for the rest of the Preston Community! 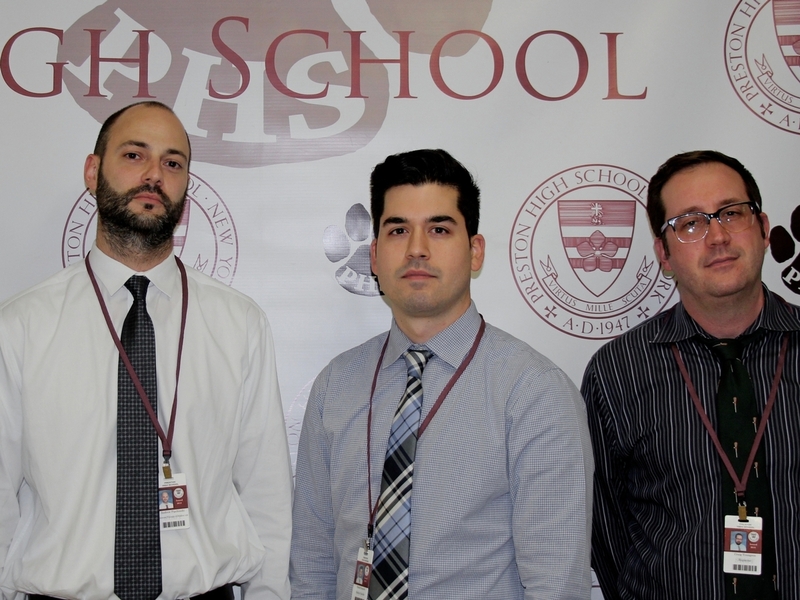 Several male members of our faculty and staff have taken on a new challenge… the No Shave Challenge! Mr. Carniero introduced this latest act of compassion at Preston to raise cancer awareness, specifically Prostate Cancer. Throughout the course of the entire month of November, these male teachers will go without shaving. Let’s team up against Prostate Cancer! This school year, the Campus Ministry brought back a old tradition here at Preston. 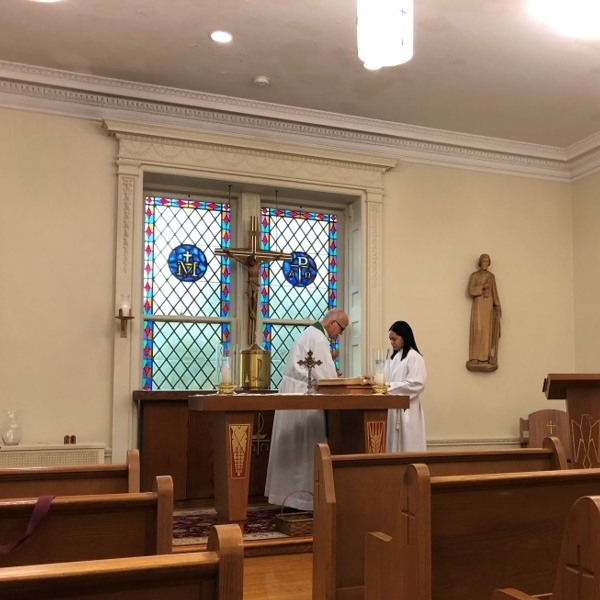 Every Wednesday morning, liturgy is celebrated in the chapel. A Jesuit Priest from Fordham comes every week to celebrate the mass. From these masses, our Preston community is given the chance to receive the Eucharist, listen to the Word of God, and worship and praise God to start their day off right. We encourage all members of the Preston community to take advantage of this opportunity to become closer to God! As of this week, we are halfway through the Thanksgiving Food Drive! We still have an additional 8,467 lbs to go! Let’s bring in as much non-perishable foods to not only get a day off, but more importantly, help those in need of our help. A big thank you to all of those who already donated! Italian Club is grateful for all of the things that administration and teachers do for us! 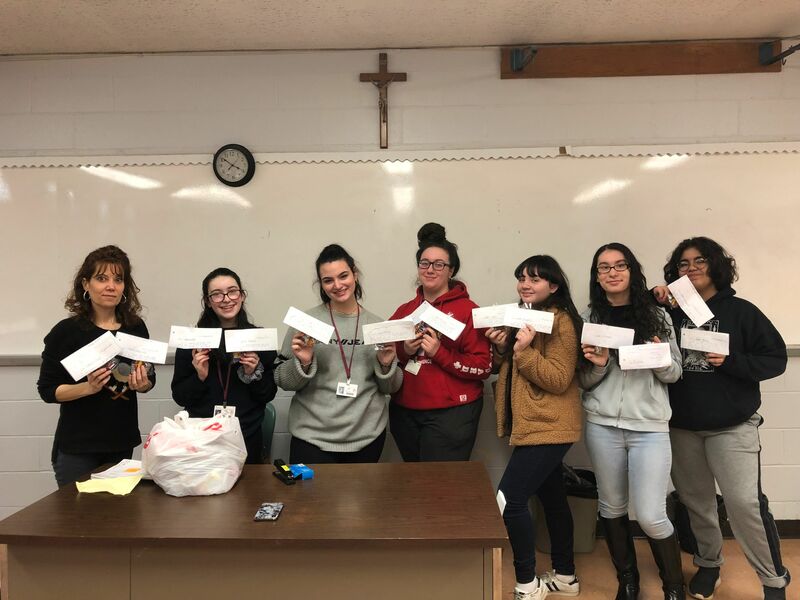 In preparation for the arrival of Thanksgiving, Italian club wrote letters and made candy packages to thank our faculty and staff for all the wonderful things that they do for us. GO ITALIAN CLUB! With the help of the Preston community, Compassion Connection raised another $50 from Food Fest Friday. Spare change really makes a difference! Donations were given to St. Francis Breadline and CityMeals on Wheels. Thanks again to all those who donated their spare change! Every October, the month of Breast Cancer Awareness, the Preston community dedicates a day to bring awareness to this important cause. 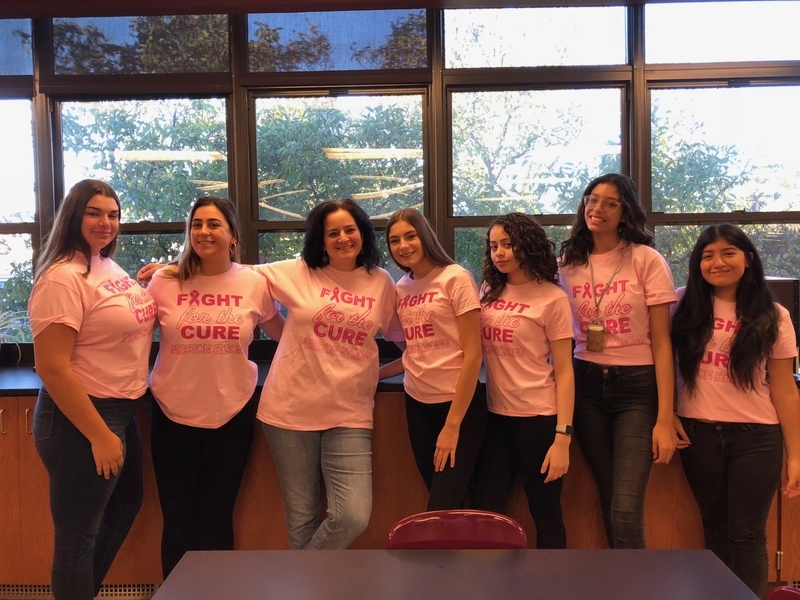 To show their support, Preston had a Breast Cancer Awareness Paid Dress Down Day where students were encouraged to wear “Fight the Cure” T-Shirts or anything pink. After school, the JV and Varsity Volleyball teams played their last home game for Breast Cancer Awareness. All proceeds will be donated to the American Italian Cancer Foundation. One of Italian Club’s most popular annual events is the Festivale Culinario! Organized and sponsored by the Italian Club, Festivale Culinario is an event for the senior citizen community of Throggs Neck. Here, they are able to spend quality time with one another, enjoy some food, and play Bingo. 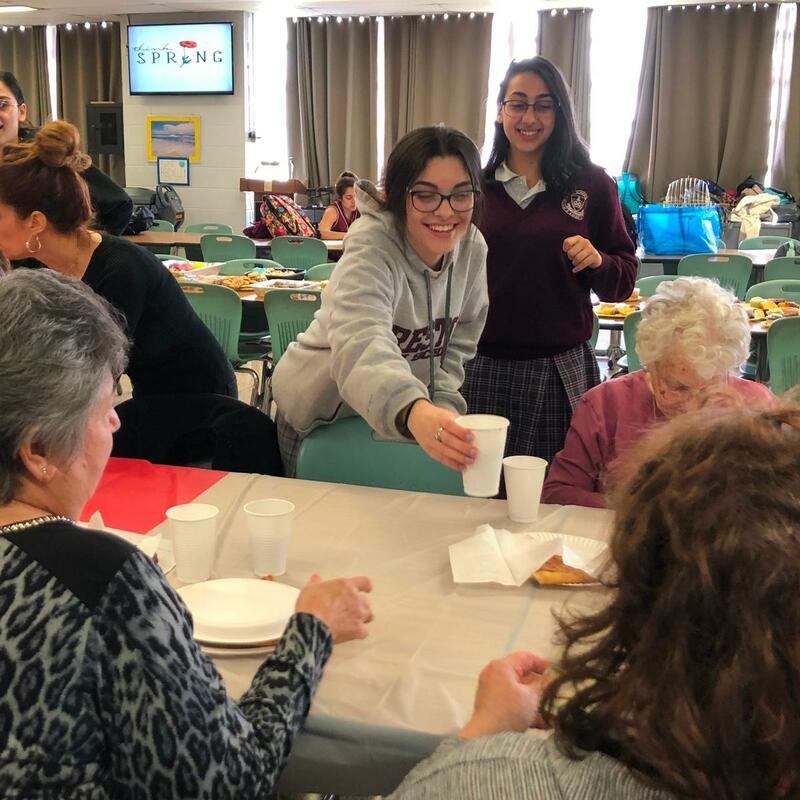 The members of the Italian Club served food, hosted the games of Bingo, and most importantly, spent time with the elderly! GO ITALIAN CLUB PANTHERS! Our Preston community is very eager to give to those in need. In just one week, we've already raised 463 lbs of food for the Thanksgiving Food Drive! With only 5 weeks to go, our Preston community needs to raise an additional 9,537 pounds of non-perishable foods in order to get a day off. We can do this!! A Preston Panther welcomes such challenges! For the first time ever, we would like to present a Service Spotlight! This week’s spotlight is on Emily Lam. Emily is a junior who volunteers at Preston’s Center of Compassion Afterschool Program. Emily tutors children ranging from Kindergarten to Eighth Grade. 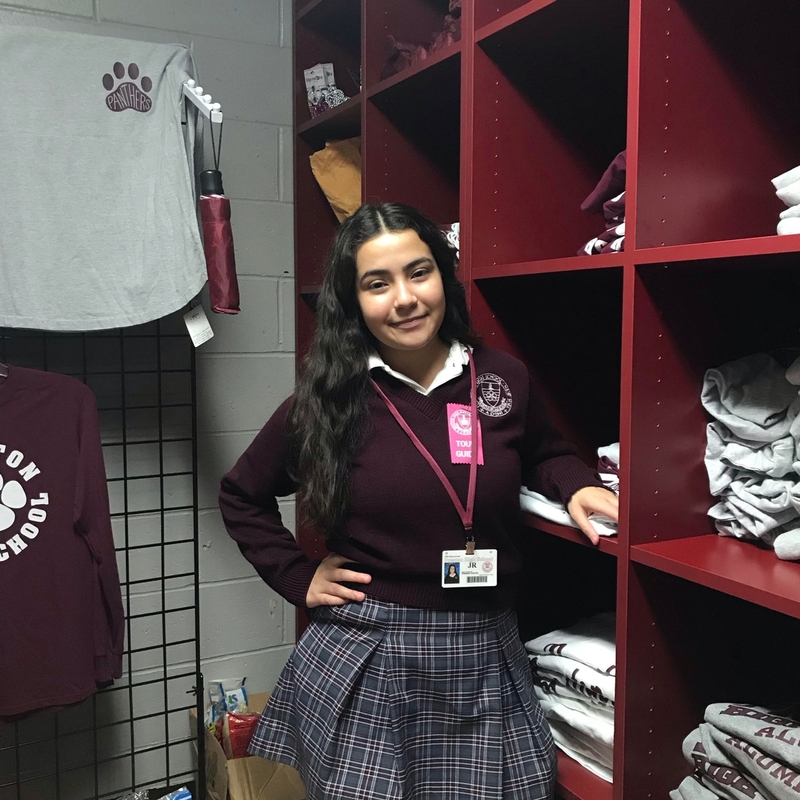 In describing her service experience, Emily said, “By tutoring young children, I’ve learned that I love giving back to others.” Go Compassion Panther! Our Preston students are all about compassion! Compassion Connection members have already raised over $50 from Food Fest Friday spare change collections! Thanks to students' generosity, Preston was able to support the NYC Rescue Mission and the Food Bank of NYC with donations. A huge thank you to all those who donated their spare change! What a great way to begin the new Compassion Connection School Year! 94 members attended the first Compassion Connection meeting. Members wrote letters and made packages, including travel tissues and chocolates, for some 50 patients at Providence Rest Nursing Home. Preston High School alumn Michelle Luchetti works as Providence Rest's Director Of Therapeutic Recreation. 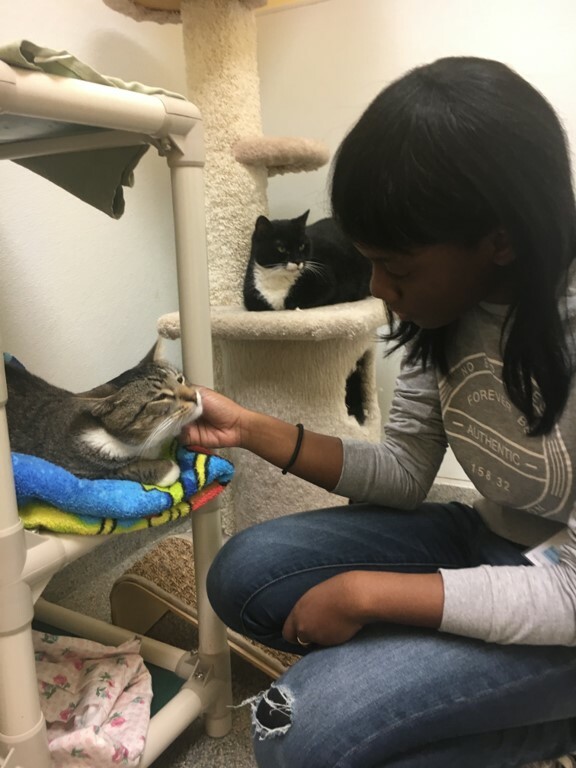 Recently, she reached out to Compassion Connection in hopes of collaborating with Preston and establishing relationships between the patients and members. GO COMPASSION PANTHERS!! Compassion Connection raised $197 to help victims of a recent natural disaster. Compassion Connection will be donating the proceeds of their first bake sale to Catholic Charities - Hurricane Florence relief in North Carolina. Be it by baking, purchasing home made goodies, or simply by making a donation... our Preston students are always willing to offer help in times of need. At all of Preston's liturgies, the Gospel Choir leads us in singing songs of praise to God. Every week, they practice in order to perfect the music that will enrich Preston's many religious services. 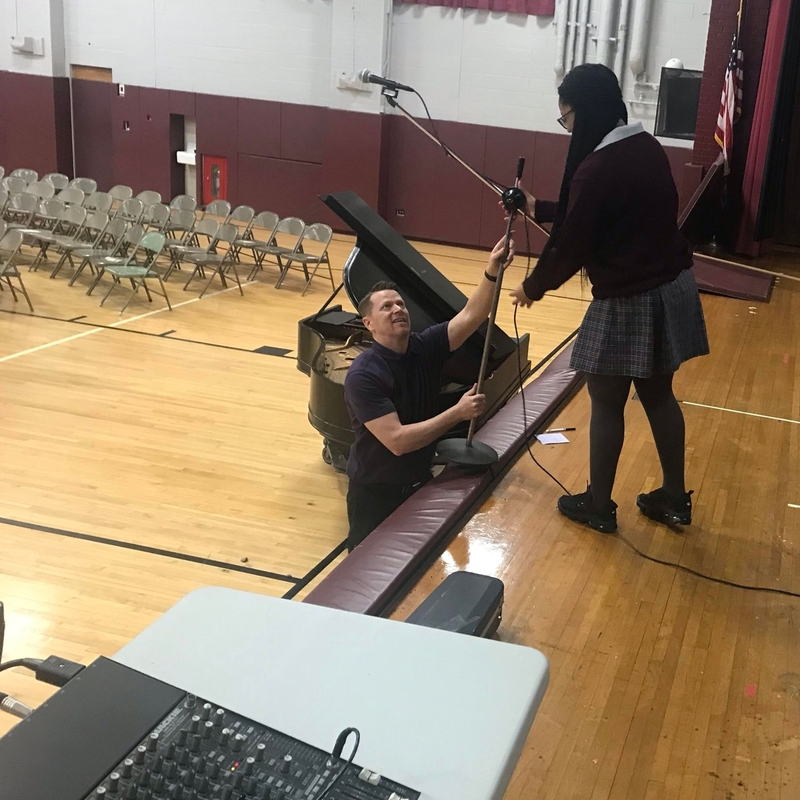 From singing “We Are The Family” to “Awesome God,” the Gospel Choir motivates our students to participate in the mass through music. 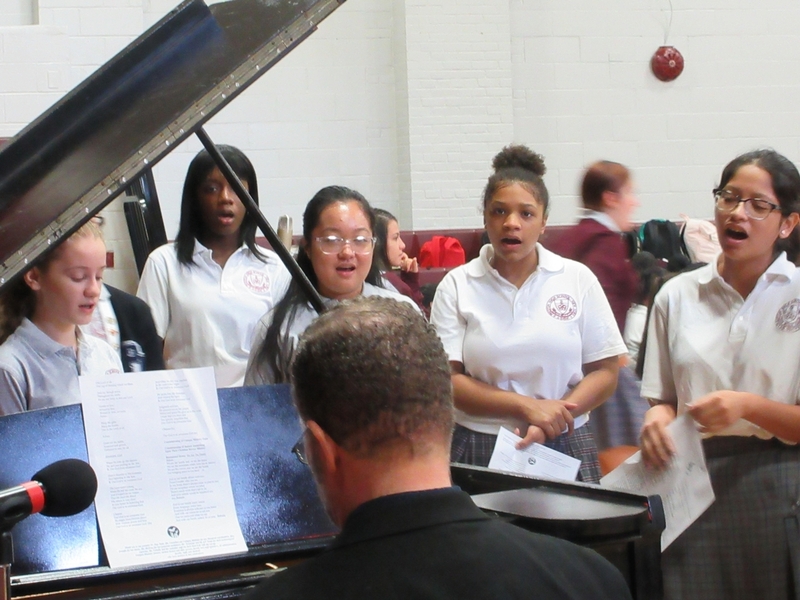 Most recently, Gospel Choir helped to kick off the school year in praise-worthy spirit at the Mass of the Holy Spirit. The members of Gospel Choir showed compassion to the Preston community by sharing their God-given talents of song… GO GOSPEL PANTHERS!! One of Preston's treasured traditions is Class Parties! At Class Parties, the Freshmen meet their Junior Sisters for the first time and the Sophomores rekindle their bond with their Senior Sisters. The Freshmen are able to learn more about the life of a Preston student, ask for advice, and establish a bond with their Junior Sisters. Meanwhile the Sophomores who met their Senior Sisters last year, are given the chance to spend time with them at a party in Preston's back yard. 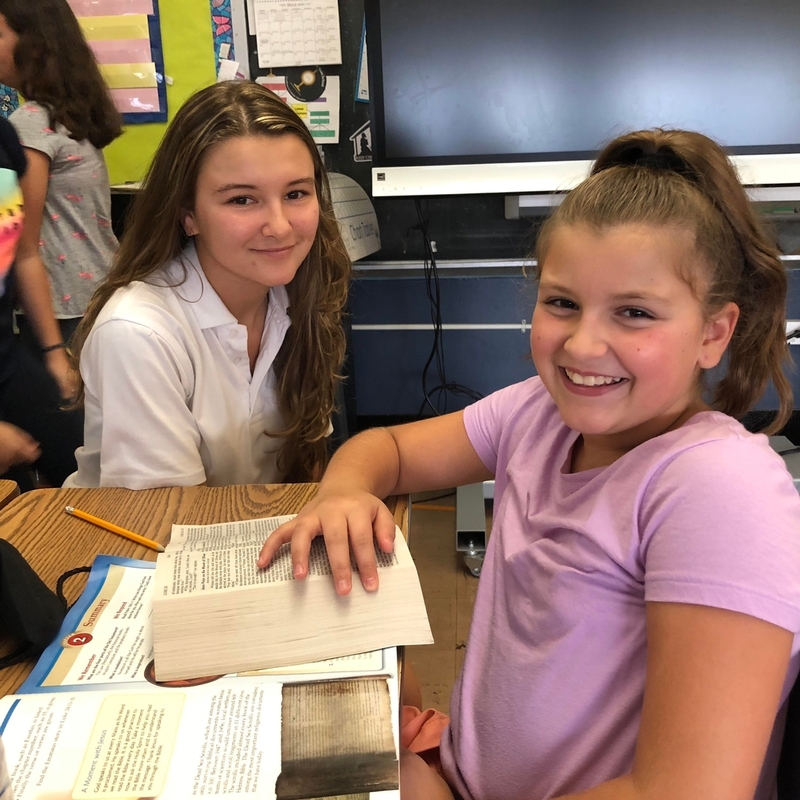 Throughout the year, our Preston students will continue to spend time with their sisters and do what all sisters do-- love and care for one another! 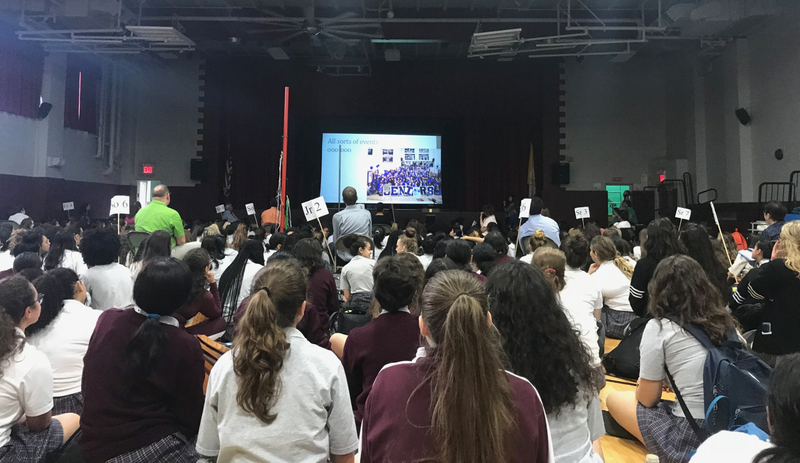 As Preston's Class of 2022 embark on their high school journey, their Junior Ambassadors will be at their sides. 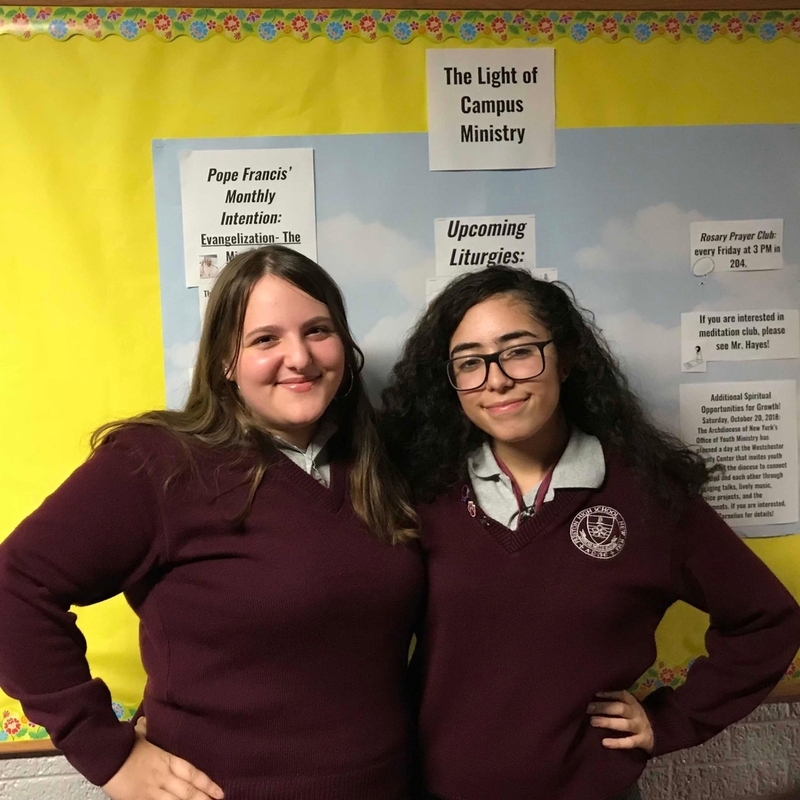 Their role is to guide them and be role models of how Preston High School students should behave - as women of dignity, honor, respect, and compassion. 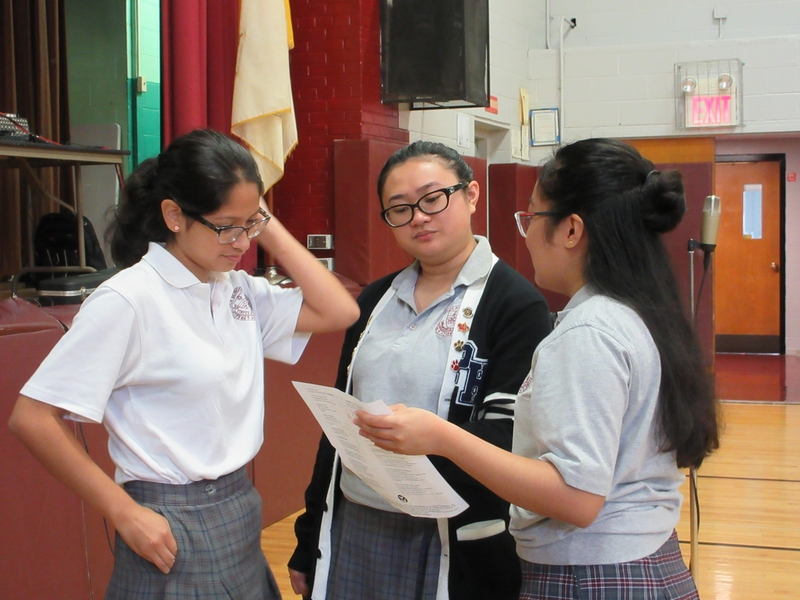 At this summer's Freshman Orientations and during the first days of school, the Junior Ambassadors devoted their time and efforts by making the incoming freshmen feel welcome: giving tours of the school, explaining the student handbook, and answering various questions. 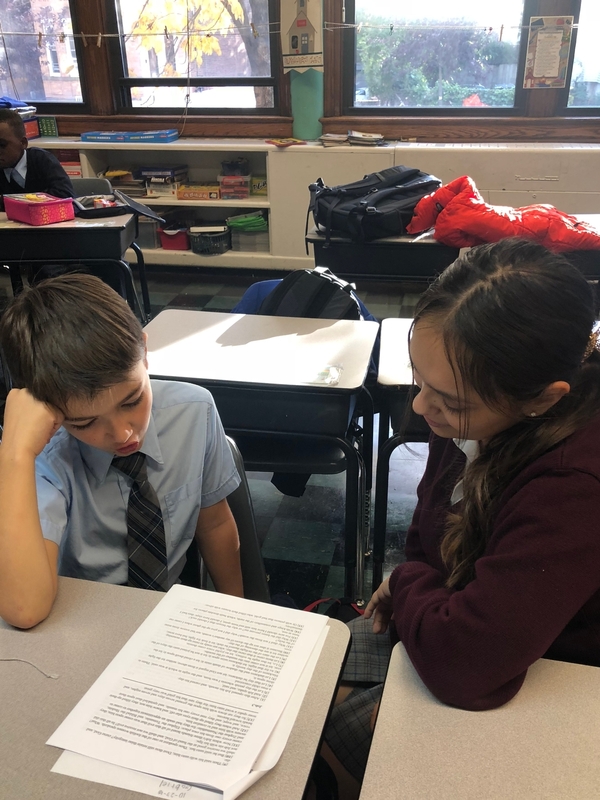 Already in their first days in the school, our freshman students see that Preston is a place of compassion! 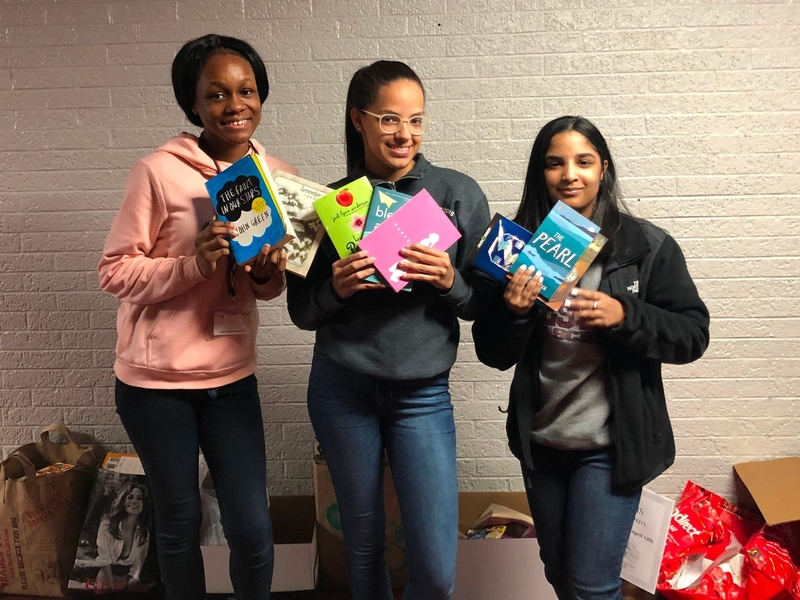 In just four weeks, the Preston community, students and staff alike, rallied together to contribute to the National English Honor Society’s annual book drive. Over 1000 books were collected and donated to Jacobi Hospital, the pediatric, adolescent, and adult wards. Believing that knowledge is power, Preston did not hesitate to help those who have never owned a book or have no means of attaining one. 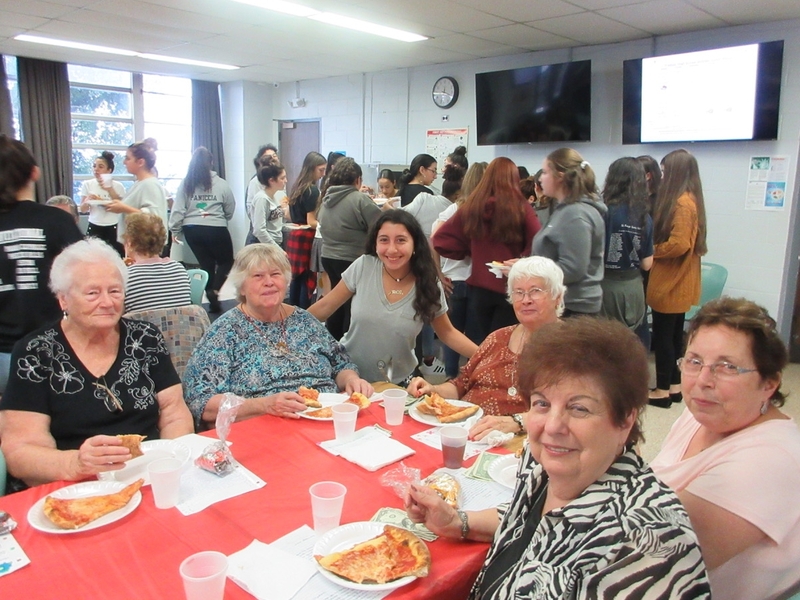 The Italian Club hosted their second Senior Citizen Party of the year. The guests from the Preston Center of Compassion were greeted with refreshments, including beverages, pizza, and freshly baked goods. 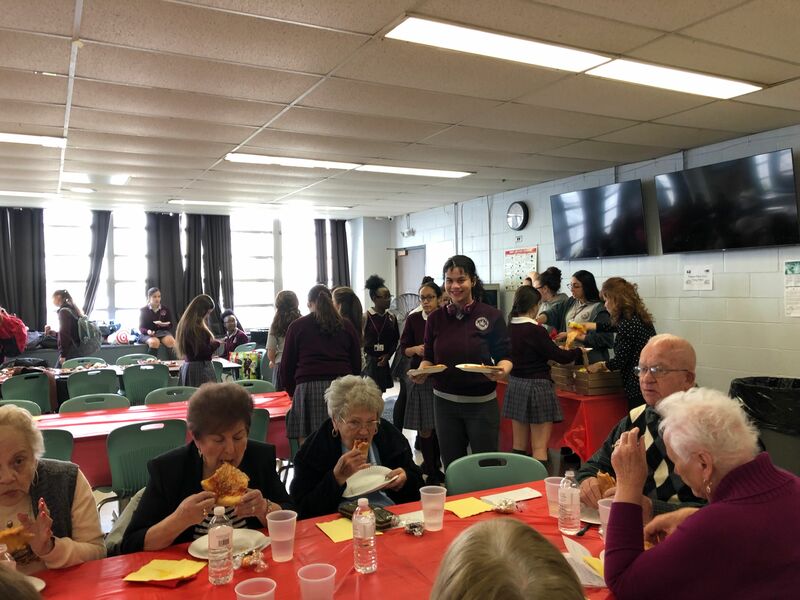 The Italian Club offers senior citizens the chance to socialize, play “tambola” (bingo in Italian), and be surrounded by charismatic and helpful Preston students. What a way to spend an afternoon! 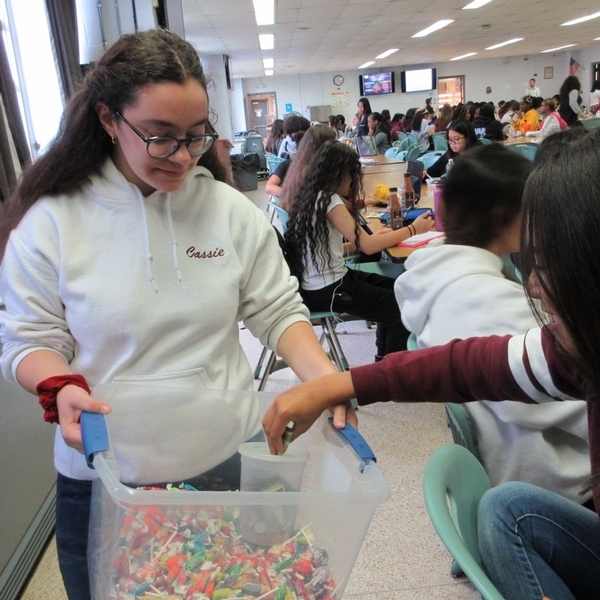 The National Honor Society held their annual charity event. This year, NHS decided to incorporate the ideal that we are “diverse yet unified” in an international potluck event. Students coming from various cultural backgrounds all came together to share an afternoon with the intentions of helping the homeless. 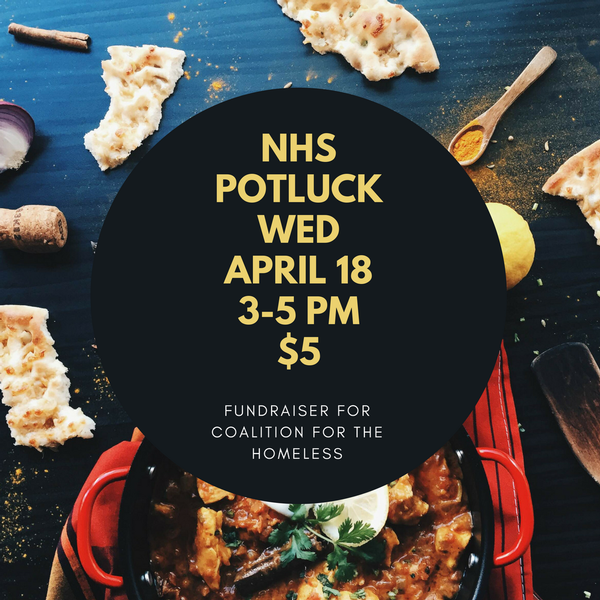 With the sale of tickets, NHS was able to donate $200 to The Coalition For The Homeless, a social services organization originated in NYC. Preston High school dedicated their dress down to commemorate the lives lost during the fatal bus crash of the junior hockey league. Faculty and students wore hockey jerseys to pay respect those who were injured and killed. 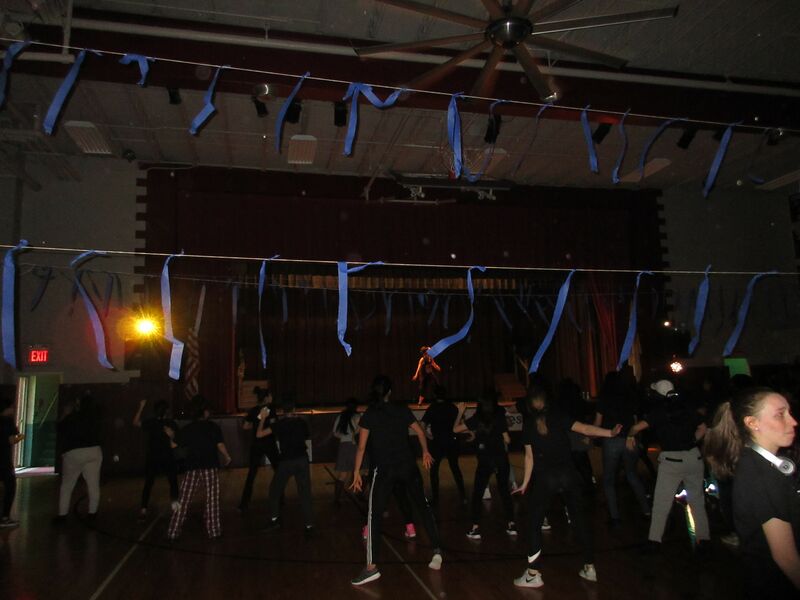 Compassion Connection held their annual dance marathon event. 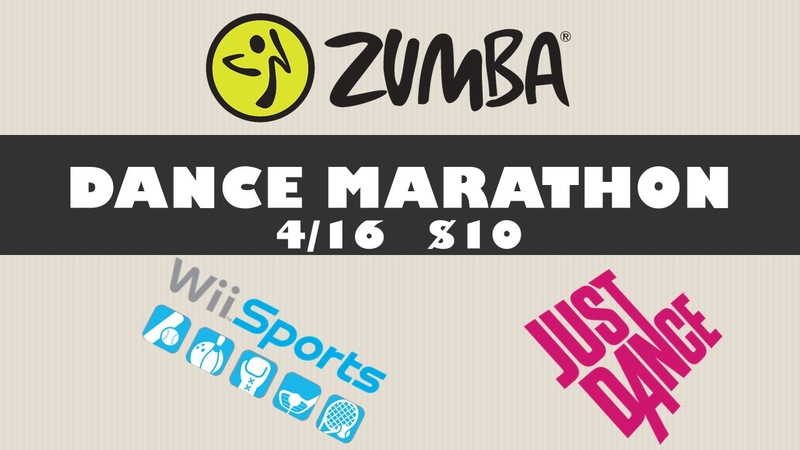 Dance Marathon entails a variety of dancing activities and wii sports to raise money for a particular charity. 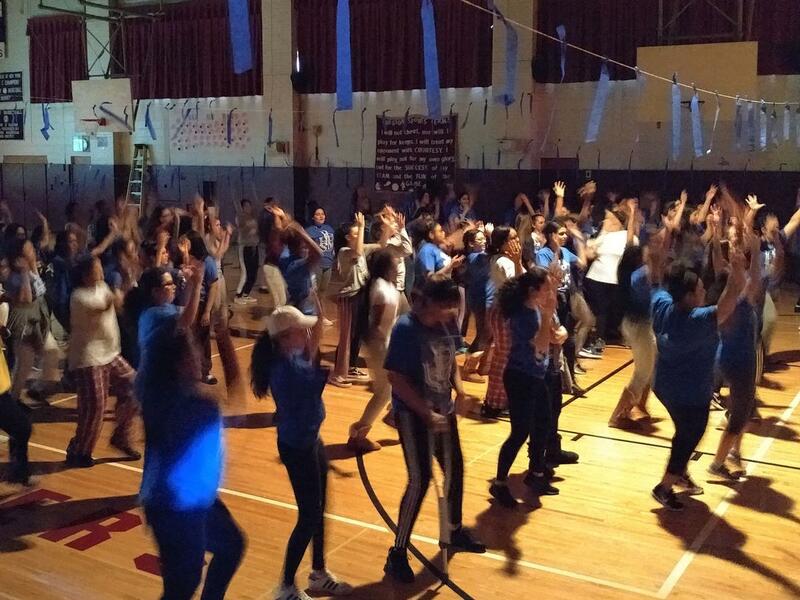 Dance Marathon included a professional Zumba session, Wii sports, and Just Dance dancing games. This year, the proceeds were donated to The Little Sisters of Therese. The Little Sisters of Therese operate in Haiti, a poverty stricken and destitute country, with the purpose of “spreading the word of God, educating peasant children and adults, introducing environmentally sound agricultural techniques, and providing programs for the promotion of women.” The Little Sisters of Therese consist of 250 nuns, all Haitian. The sisters struggle to carry out their vocation due to their lack of monetary and medical resources. In addition to this, the sisters often cannot reach their destinations because of the rugged Haitian terrain. With Preston’s contribution, The Little Sisters of Therese are closer to affording a truck for traveling and moving supplies. At this year's Dance Marathon, Compassion Connection raised an impressive $1800! Italian Club continues to show their compassion at the onset of the Spring season. Club members wrote letters in Italian and English and made candy packages to show their appreciation for Preston faculty and staff. 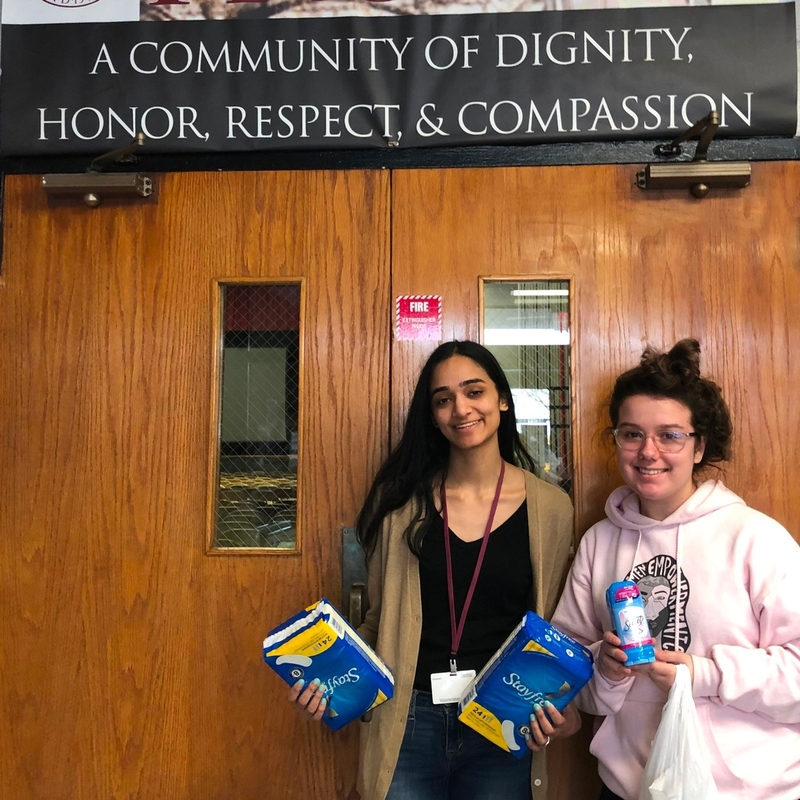 Likewise, Italian Club members made "Women's Day Spa Packages" with chocolate, hand cream, shampoo and nail polish, and wrote Italian/English cards for the senior citizens of the Preston Center of Compassion. 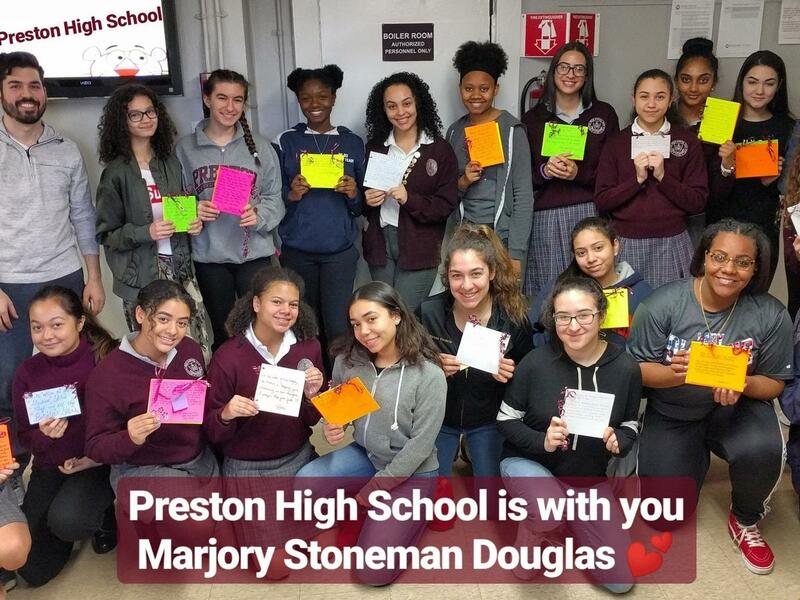 In the wake of the tragedy that occured in Marjory Stoneman Douglas High School, the Preston community rallied together to send words and thoughts of comfort. 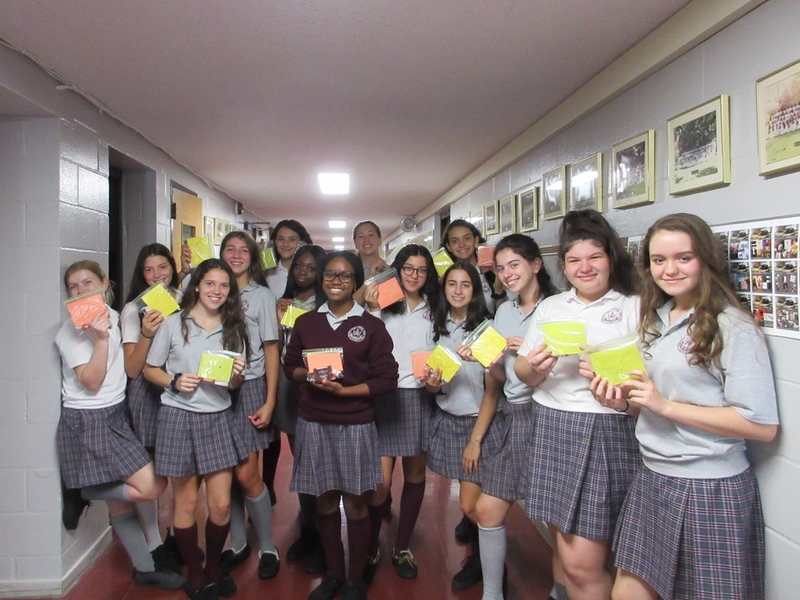 Junior Art classes created cards with simple paintings and touching messages. The entire school also wrote words of comfort on cards. Although these cards are small gestures, they demonstrate the way Preston keeps those who suffer in mind; even if they are 1000s of miles away. Compassion Connection is making sandwiches... lots of sandwiches to feed the hungry! This year, the community outreach club of Preston has decided to make the Lenten pillar of almsgiving a reality. 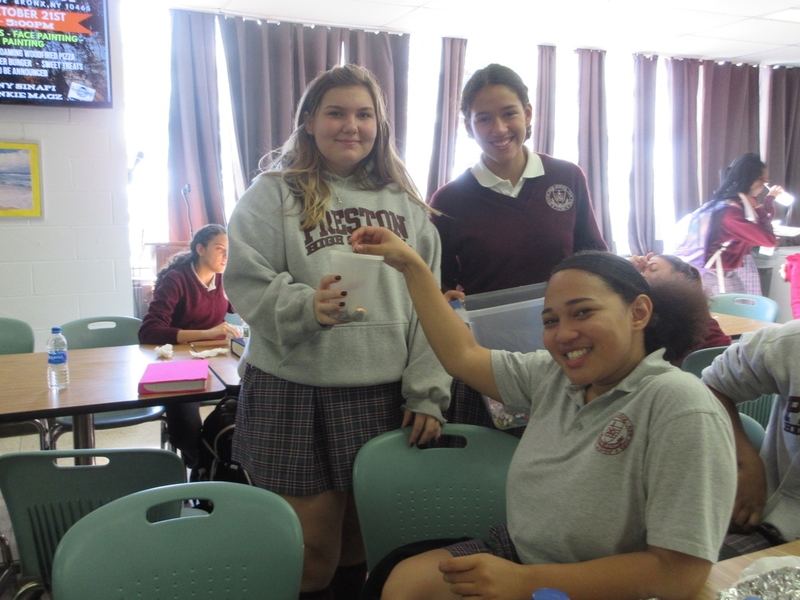 Every Friday throughout Lent, spare change is collected during Food Fest Friday collections. Then the money collected is used to purchase sandwich supplies. Every following Thursday, sandwiches will be made and delivered to Lamp Ministries, down the block from the school. Lamp Ministries ministers to the homeless of New York City, and is very happy to receive our weekly contributions of 100 sandwiches. This Valentine’s Day season, Preston spread the love through the Compassion Connection Cookie Gram Sale. 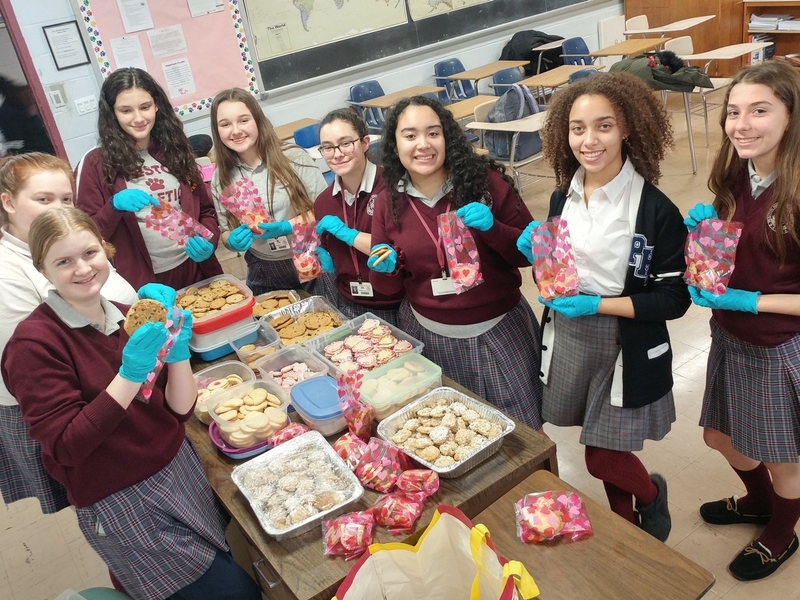 Students and faculty had the chance to order homemade packages of cookies - to be delivered to their friends for Valentine's Day. All proceeds were donated to the the American Heart Association. Over $150 was donated. 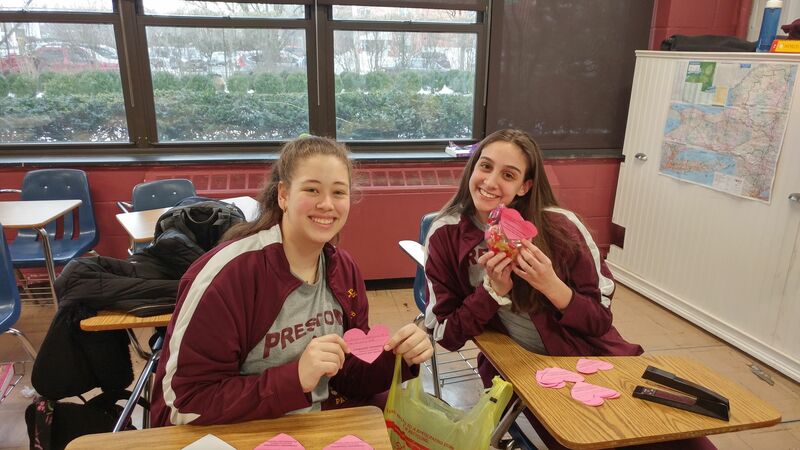 In addition to the cookie gram sale, 60 Valentines with chocolates were made for Preston Center of Compassion Senior Citizens. Compassion Matters... especially on a day when all should feel loved! 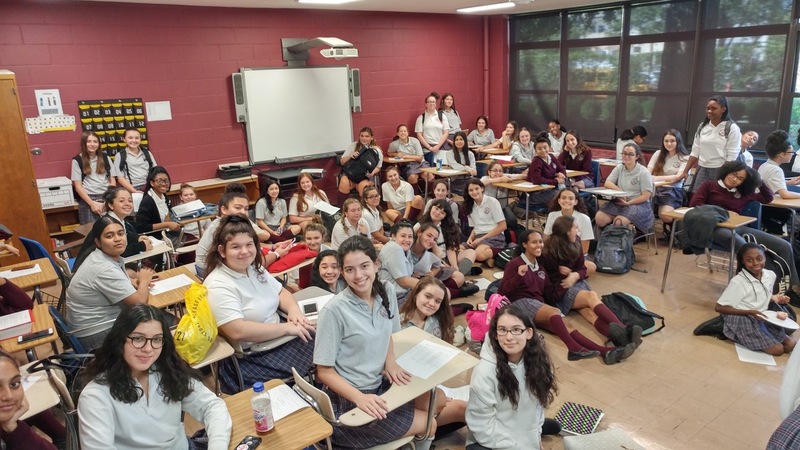 The Spanish Honor Society is closely affiliated with the Santa Maria Parish and often partners to spread compassion. SHS members completed a toy drive for children from Santa Maria who are subject to disadvantaged circumstances. Gifts were delivered in time for Christmas. Each athletic team adopted a family in need this holiday season, and bought personal presents for every family member. The athletes wrapped the presents in festive paper and bows. Jamie Skrapits, Preston’s athletic director, and the athletes hosted a Christmas party for the families. The athletes helped Jamie prepare a home cooked Italian dinner. Most of the children are waiting till Christmas to open their presents, but the ones who couldn’t wait were ecstatic because of all the toys and clothing they received. The smallest things mean the most; anyone who’s felt Preston’s compassion can testify to this. Lesson learned by all Preston Athletes! IT IS BETTER TO GIVE THAN TO RECEIVE!!! 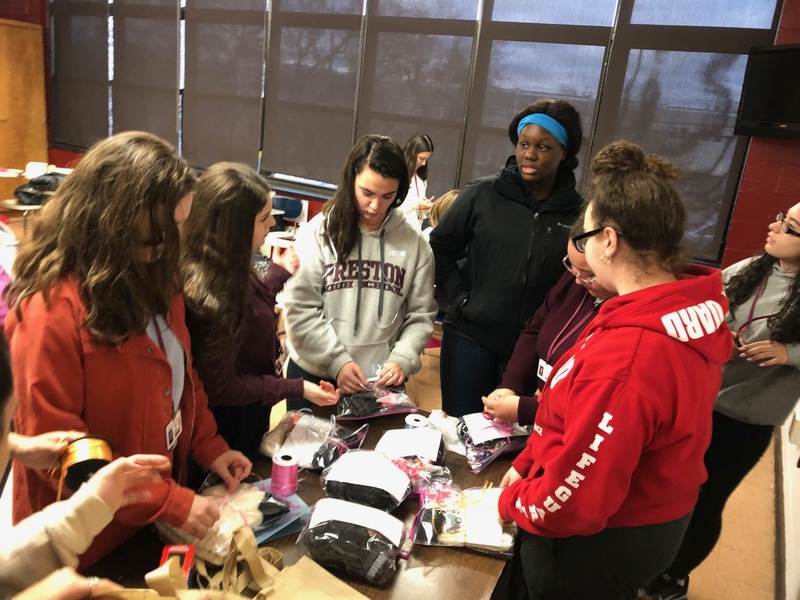 Compassion and Connection hosted their second party of the year for the Big Sister-Little Sister Program. The festivity was heightened by the Christmas decor in the cafe, the seniors' ugly Christmas sweaters, and holiday tunes. The "littles" were treated with homemade cookies, brownies, and cupcakes. 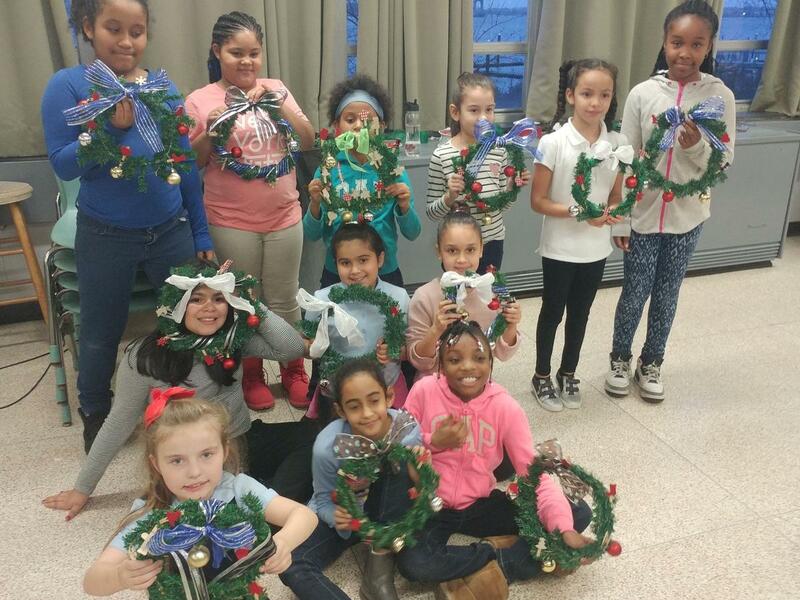 The "bigs" helped their little sisters decorate wreaths with ribbons and ornaments to take home. For entertainment (and to the delight of the "littles,") the Step team performed several routines. Finally, every sister pair had a chance to decorate a gingerbread house. "Christmas is a necessity. There has to be at least one day of the year to remind us that we're here for something else besides ourselves." 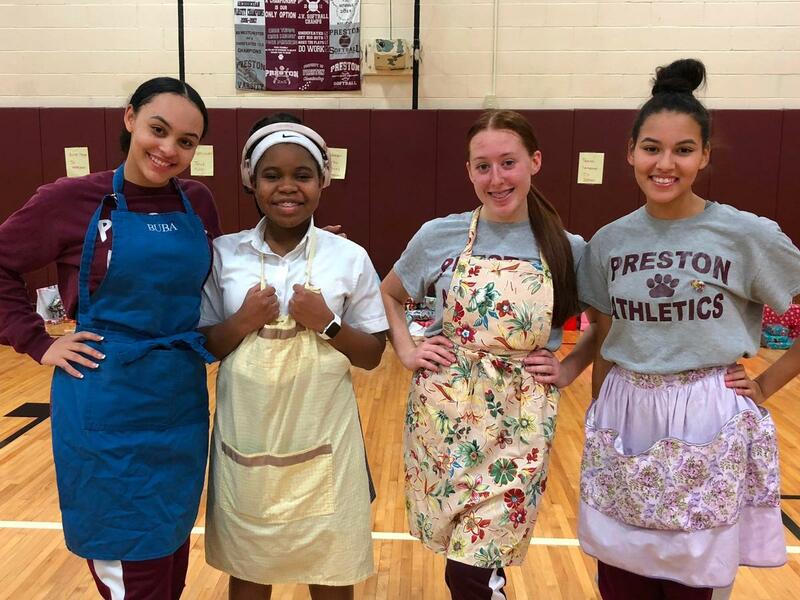 At Preston, the "big sisters" take the holidays as an opportunity to make a profound difference in the lives of their "little sisters." The proceeds from this Food Fest Wednesday-Friday are going to The Food Bank for New York City. The Food Bank of New York City intends to provide 10 million meals to New Yorkers in need this holiday season. Every donation received by the FBNYC is going to be doubled by a benefactor. Although compassion sets the tone every day at Preston, it is amplified during the holidays because panthers cannot bear the thought of anyone being without a warm meal to eat. 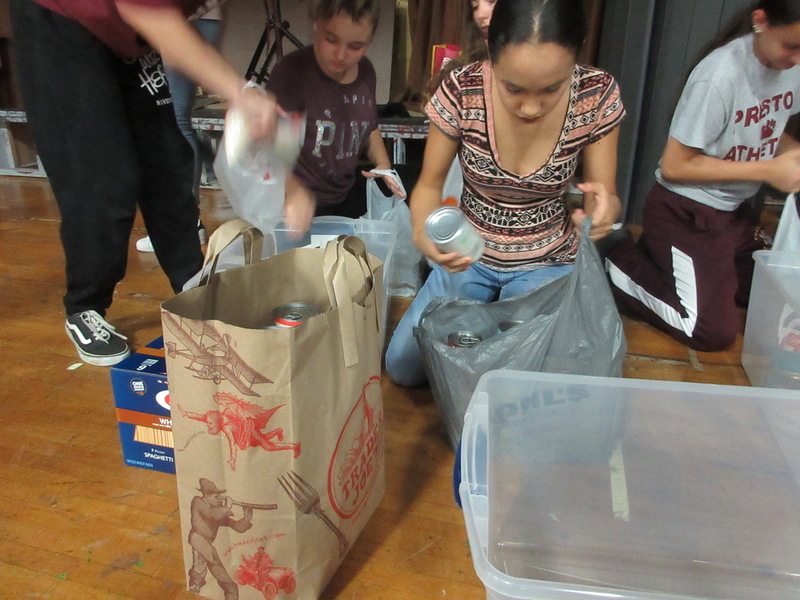 The Spanish Honor Society packed 28 bags of groceries for families from the Santa Maria Parish. In addition, SHS provided turkeys so these needy families can enjoy a traditional Thanksgiving. Preston’s compassion encompasses all charities, small or large. Donating to individual families rather than a large organization, SHS understands the BIG difference they make by helping these SMALLER causes when they see the thankful faces of the people whose lives they are touching. 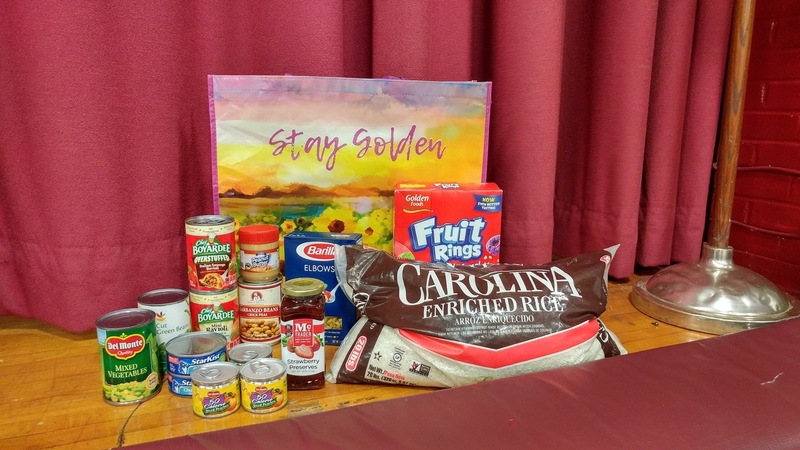 The end of the food drive is always an exciting day in Preston’s “compassion matters campaign.” In total, the Preston community collected an astonishing 10,240 pounds of food. 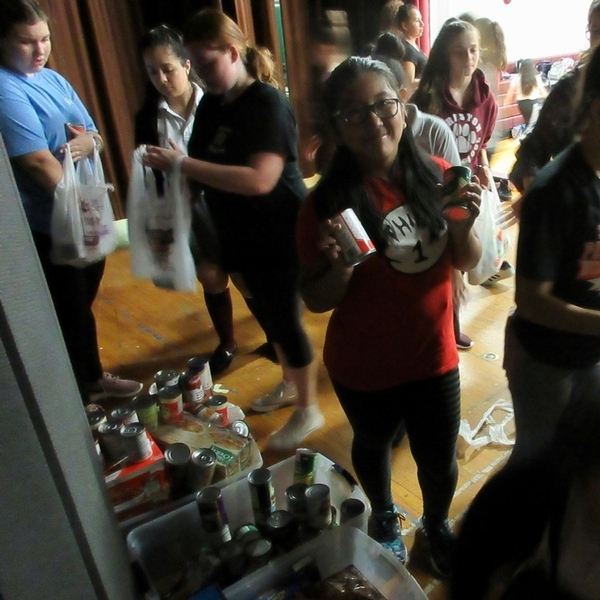 Students spent hours passing food along assembly lines from the makeshift pantry on the stage to various pickup trucks, a bus, and cars in the faculty parking lot. 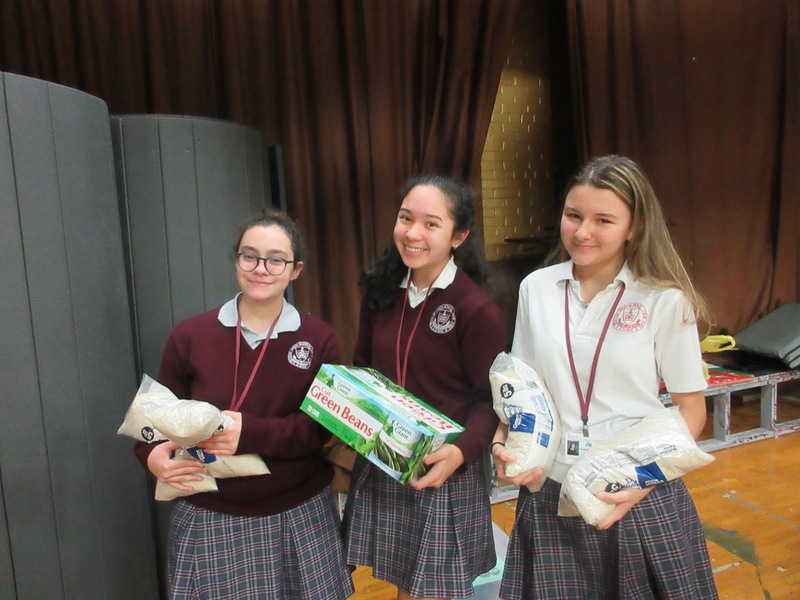 Approximately 3,500 lbs went to the Divine Compassion Food Pantry in Dover Plains, 2,000 lbs went Mercy Center in the Bronx, 2,000 lbs went to St. Raymond’s pantry in the Bronx, and 2000 lbs went to Our Lady of Assumption Pantry in the Bronx. 70 food packages were delivered to individual families. With our deeply rooted determination and passion, Preston will never settle for defeat. The charity we accomplish through the food drive every year is the epitome of compassion. 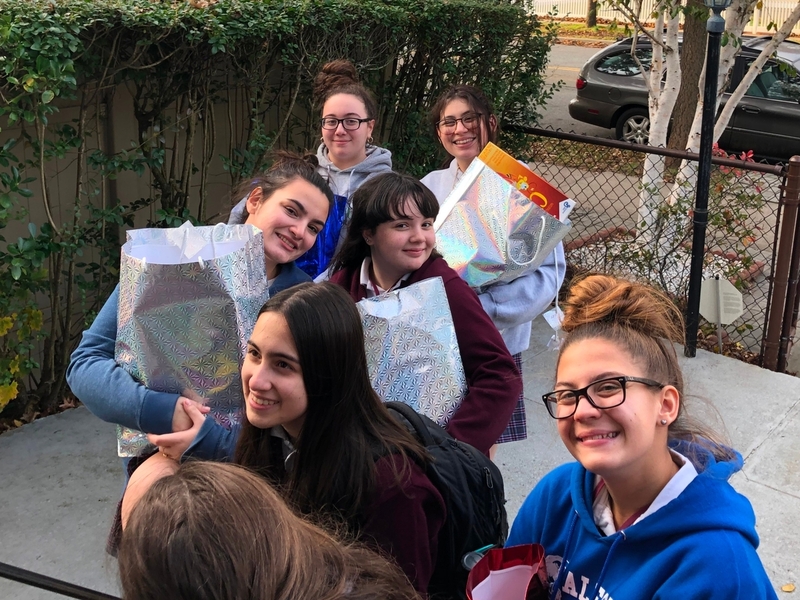 The Italian Club (moderated by Ms. DeMaio) delivered packages of cans to a local organization called LAMP ministry in Throggs Neck. The vocation of LAMP is to help everyone know God’s love. LAMP ministry preaches at St. Thomas Aquinas Church and Corpus Christi, proclaiming the word of God and feeding the poor. 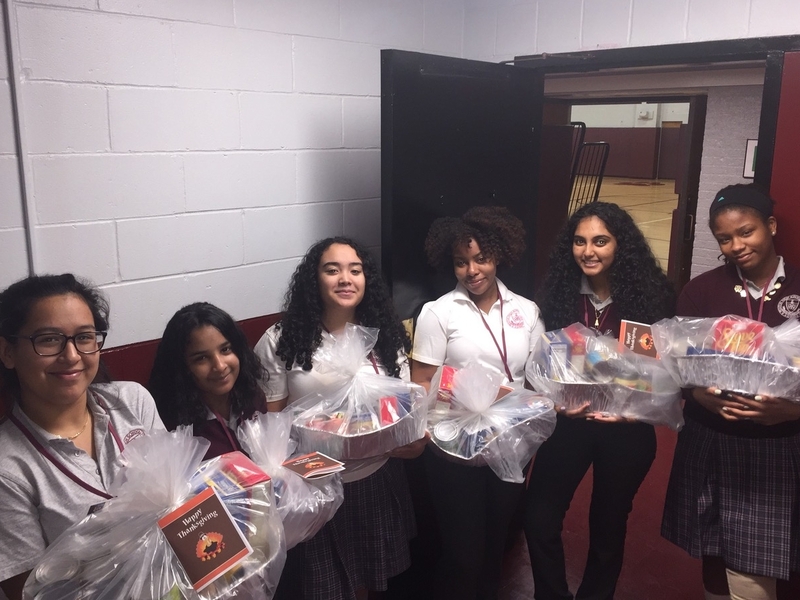 Although LAMP ministry delivers food to three different parts of the Bronx, Preston’s packages will be delivered specifically to homeless families and pregnant mothers since these packages crafted with love. According to the organizers of LAMP, “the greatest poverty that the poor experience is the lack of spirituality.” Here's to spreading God's love! 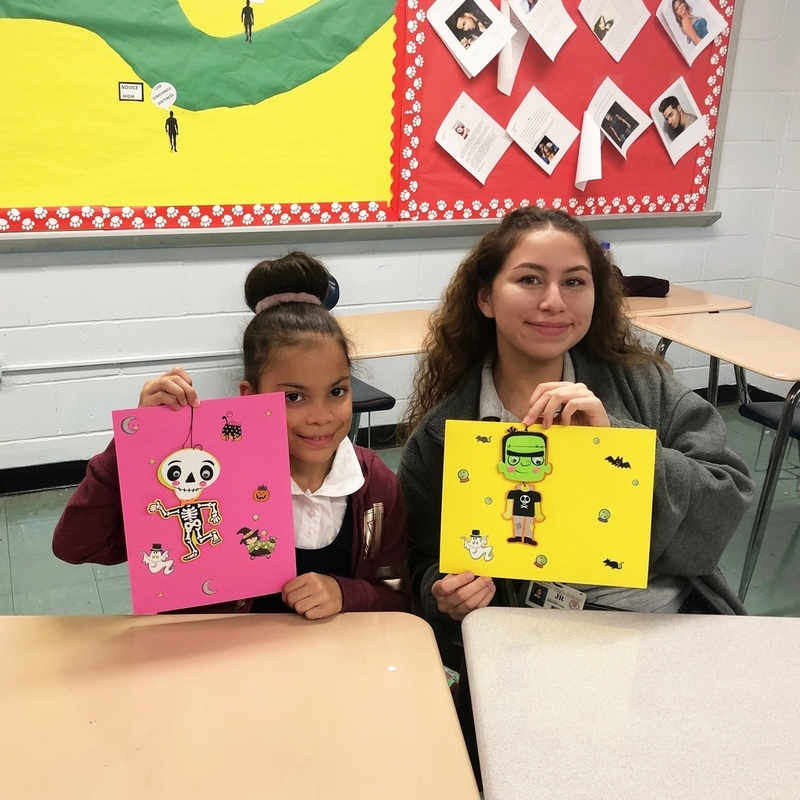 Big Sister-Little Sister is an afterschool program on Tuesdays in which selected Preston juniors are paired with 3rd grade girls from a public school in the Bronx. These girls often come from struggling families in which the parents work full time and are unavailable to help the girls with homework. These girls are not as fortunate to have the “traditional, ideal family life." 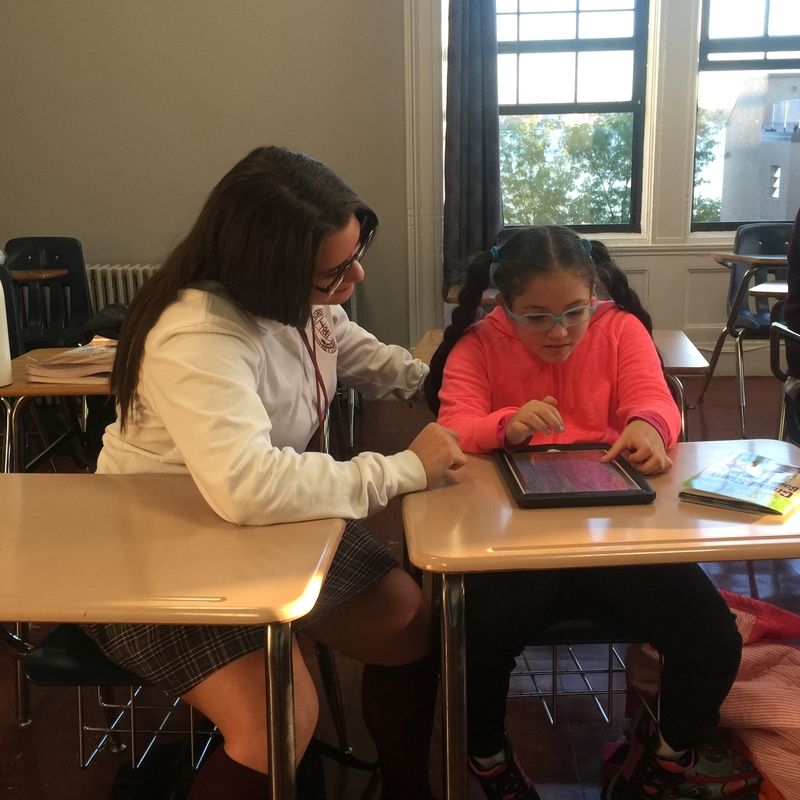 Our Preston girls act as their “big sisters,” helping them with homework, and building relationships with them. 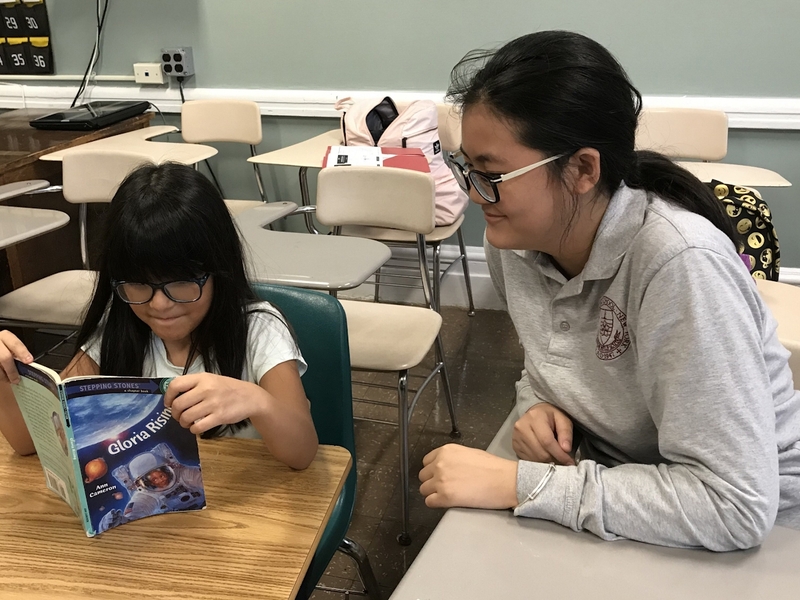 The “big sisters” instill values such as honesty, determination, commitment, and passion in their “little sisters.” This is an amazing opportunity for girls to have a role model, someone to aspire to be like. Compassion Connection organized Big Sister-Little Sisters' first party of the year to celebrate Thanksgiving. Students brought in homemade baked goods for the Big and Little Sisters to share. Together they made necklaces, sang Disney songs, and danced. 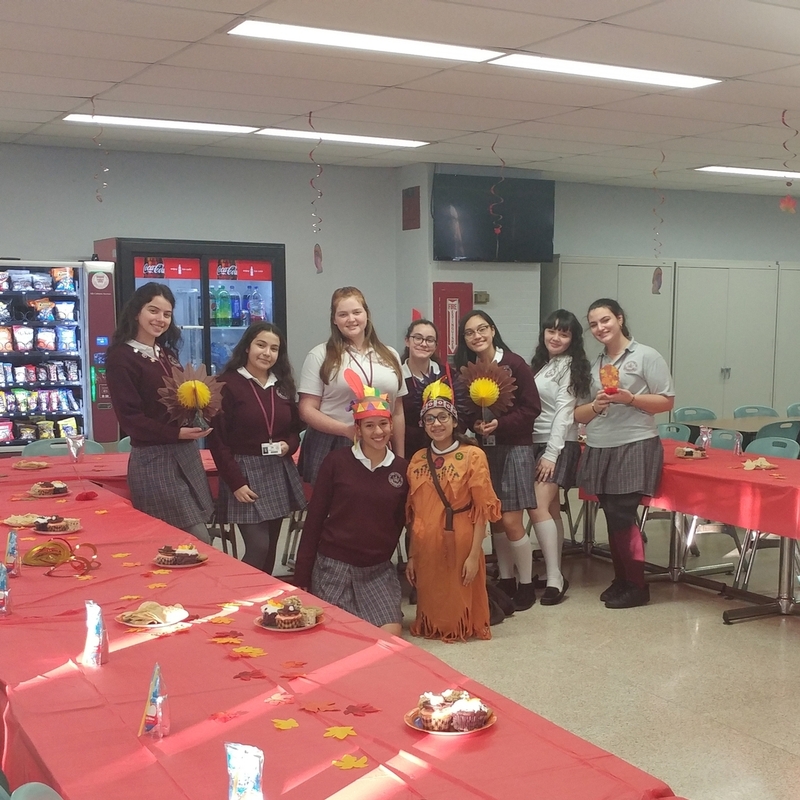 The Italian Club and Honor Society celebrated Thanksgiving early with members of the senior citizen community. The guests were greeted with Italian cookies, pizza, refreshments, and a chance to win cash prizes playing tambola (bingo). Students were thankful to share an evening with such incredible carriers of their culture, wisdom, and experience. The Senior citizens were amazed by all the charity the Italian Club and Honor Society does! The proceeds from this week's Food Fest Thursday-Friday will be going to City Meals on Wheels, an organization that serves homebound elderly in all five boroughs. Without this mobile food pantry, many New Yorkers, unable to walk to the supermarket due to age and disability, would be at risk for malnourishment. Preston’s compassion permeates throughout New York, by supporting this organization. Unfortunately, many elderly individuals are manipulated, disregarded, and taken for granted. However, the Italian Club adopts senior citizens into the Preston community. 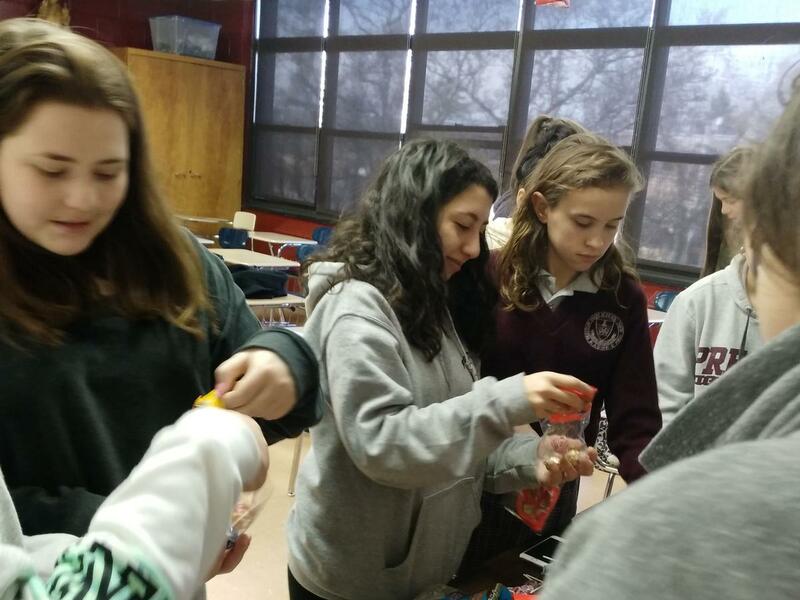 The Italian Club prepared for the next Senior Citizen Night by crafting candy packages "made with love!" 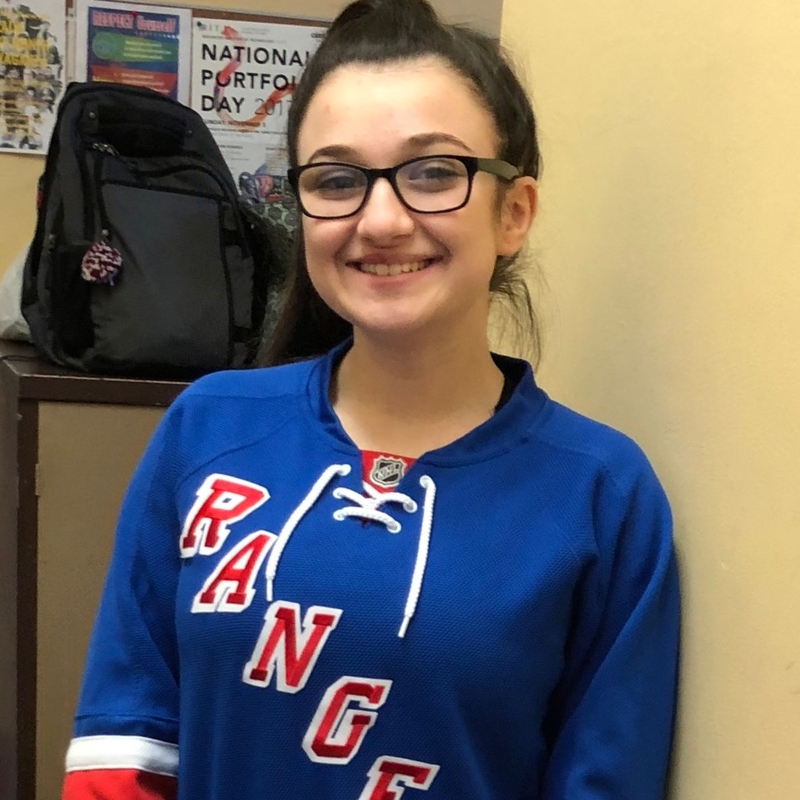 Megi Alikaj (Class of 2019) enjoys engaging with the senior citizens because "they are full of life and excitement especially when playing "tombola" (Bingo in Italian) in hopes of winning prizes." 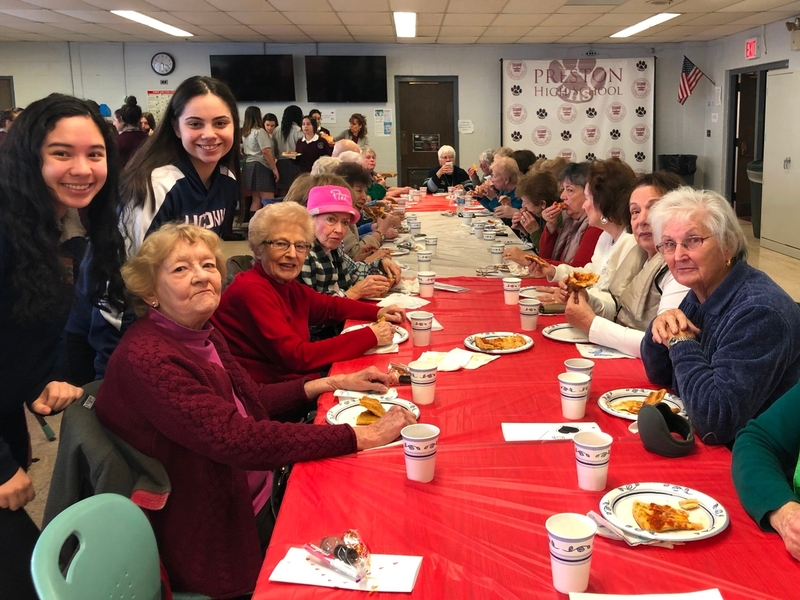 The Italian Club defies the misconception of age barriers as Preston students interact and bring happiness to the senior citizen community. Some candy packages will also be set aside for a LAMP ministry. 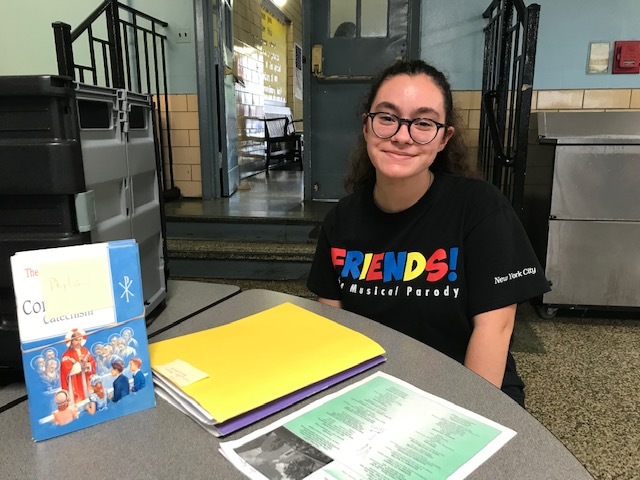 Embracing another marginalized group, the Italian Club writes letters to the homeless, hoping to inspire and uplift those who are struggling economically. Another week down - another 1000 pounds of food donated! The Preston community contends with only 3 weeks left of the food drive. 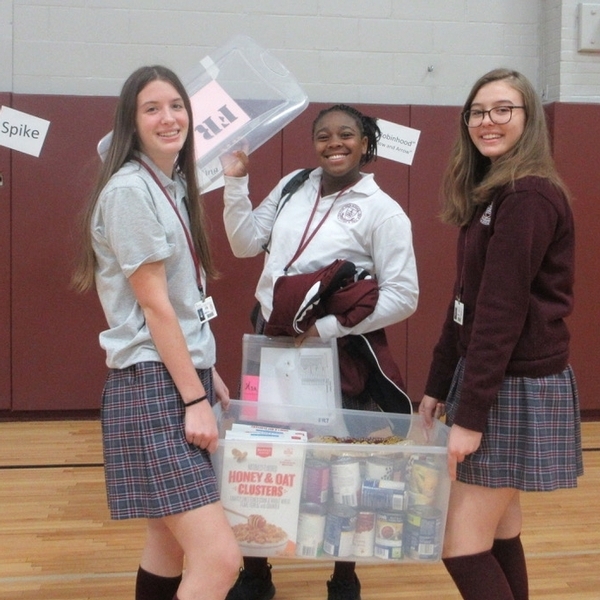 At the midway point of our food drive, students have donated a total of 3345 pounds of non-perishable foods. 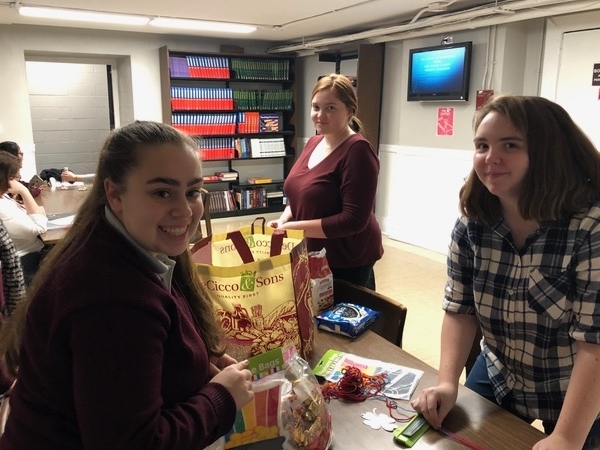 Compassion Connection members sorted and pulled out food items that will be needed to make Thanksgiving baskets and packages by Italian Club and Spanish Honor Society. The rest was packed up and made ready for a pantry pickup. Mercy Center came with a pickup truck and assembly lines moved 2000 pounds of food from the stage to the faculty parking lot. If our goal is reached, we will collect 9000lbs and get a day off from school! With the clock ticking and the goal awaiting, incentive is high and the tone in the school is a generous one! 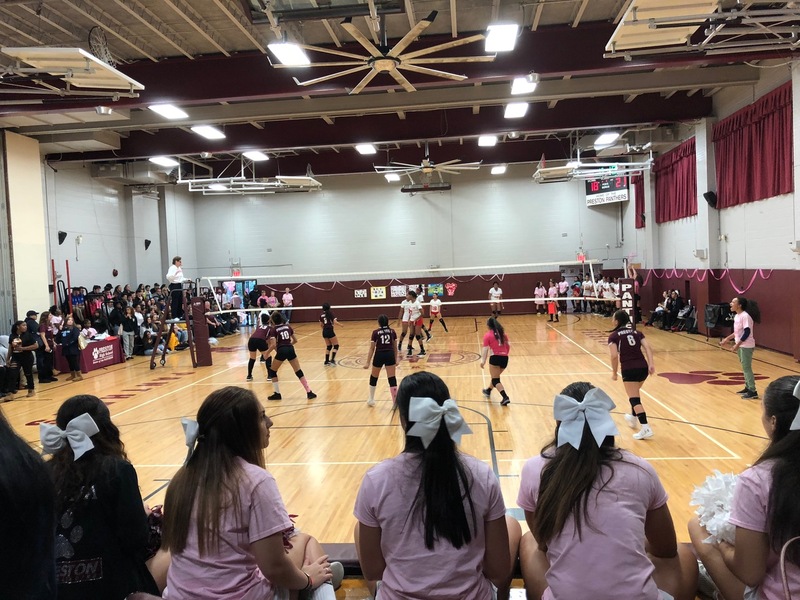 Preston’s Annual Breast Cancer Awareness Game ignites excitement among the volleyball players and individuals whose families have been affected by breast cancer. 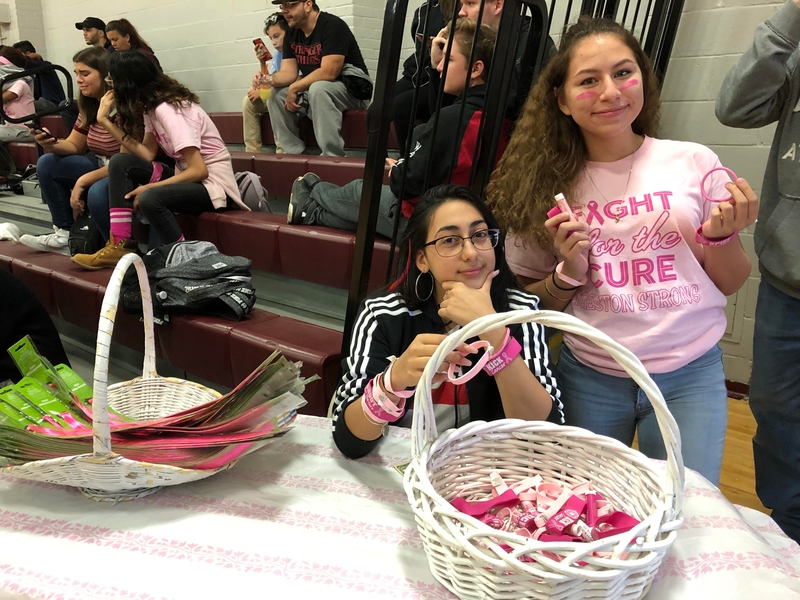 This game raises funds for The Breast Cancer Research Fund by selling pink shirts and hair extensions worn by members of the Preston Community is these photos. I could not have gotten thru it without the kids at PHS, especially the Athletes. They were there for me every step of the way and I will never forget that. Students continue to bring in food for our schoolwide Food Drive. At the conclusion of the second week of the drive, our donations weigh in at 1876 pounds. A steady stream of canned soups, boxes of cereal, and bags of rice keeps coming in. 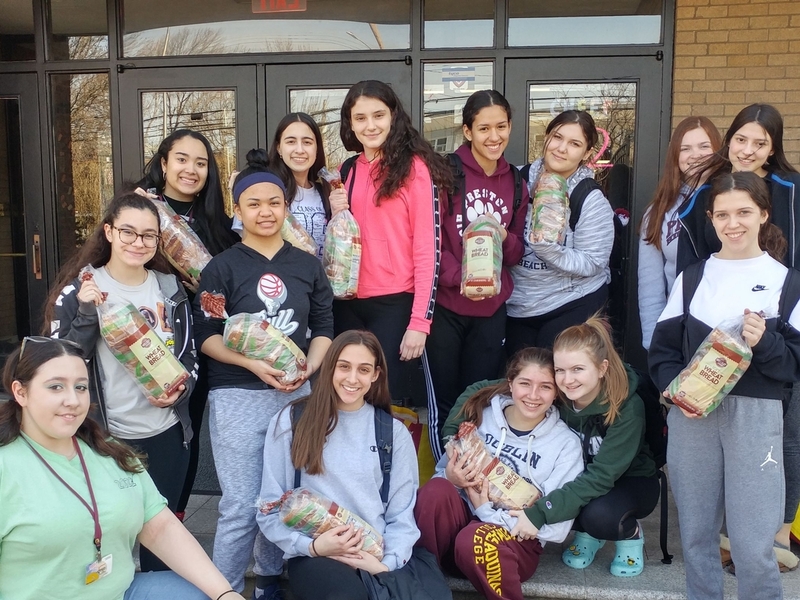 Compassion Connection has already sorted out stacks of food for the various baskets and packages that will be made by Italian Club and Spanish Honor Society. 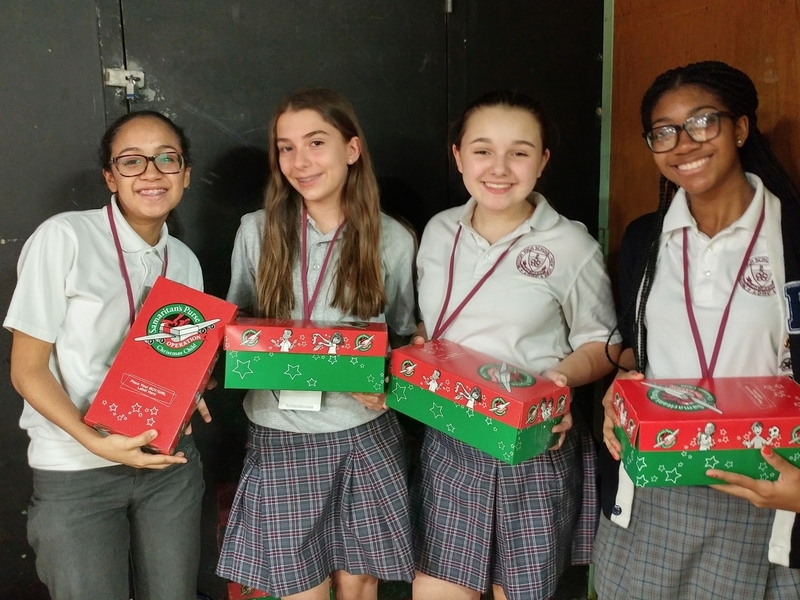 Compassion Connection collected donations from its members to fill shoeboxes with gifts for underprivileged children through Operation Christmas Child. 20 boxes were filled with little stuffed animals, boxes of crayons, hair ribbons, toothbrushes, tooth paste, bar soap, knit gloves, and candy. 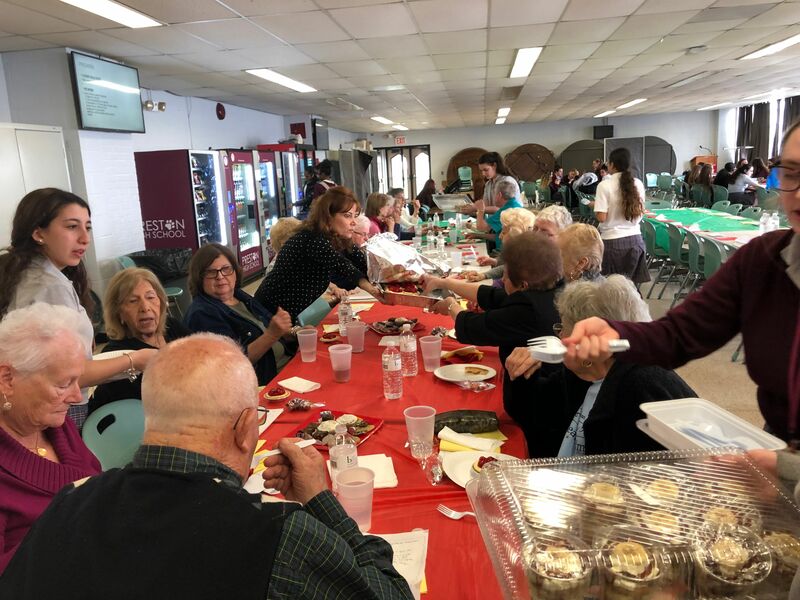 The Italian Club hosted its annual Festivale Culinario, an event in which Preston students interact with members of the elderly community. Italian Club members serve their guests beverages, Italian pastries, and other hors d'oeuvres. The guests, especially the ladies, were thrilled to take photos with Preston girls! 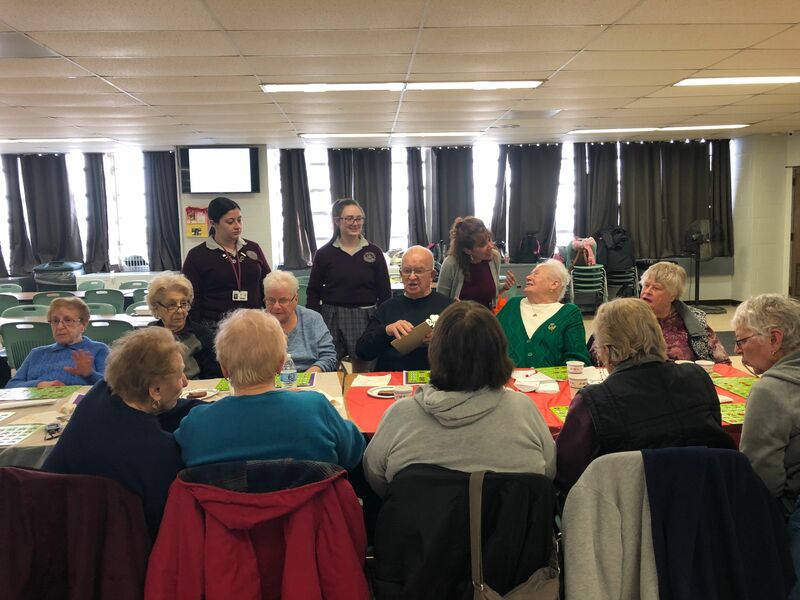 Playing bingo, socializing with one another, both the guests and the Preston students enjoyed an afternoon filled with laughter and shared stories! The pace is picking up for Preston’s food drive! Homerooms compete to bring in the most canned goods and bags of rice! Compassion & Connection members arrange the items of food and keep an accurate record to track the progress! It’s incredible that in just one week Preston students have brought in 639 pounds! Throughout the course of the drive, all donated foods will be distributed among different organizations, churches, and charities. Our women of dignity, honor, respect, and compassion represented Preston High School at Orchard Beach’s Walk For Breast Cancer Awareness. Rather than concentrating their energy in one cause, Preston’s compassion is felt by all in need, despite geographical, language, and religious barriers. Our Cheerleaders even cheered for the cause! A special thank you to Preston's Athletic Department and Italian Club for organizing the pink Tshirts. 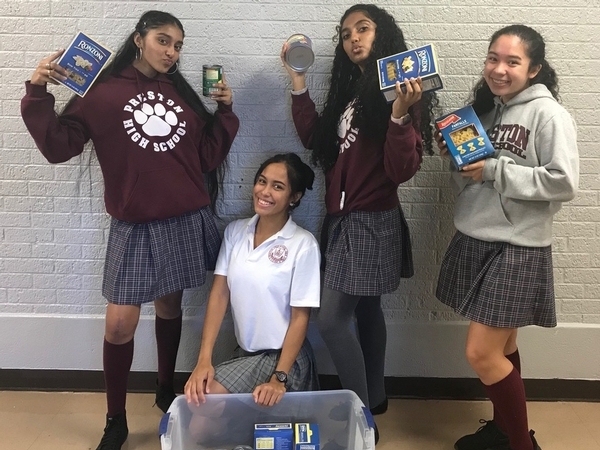 The students and faculty have started off the 2017 Food Drive on a very positive note. Just in the first week 639 lbs of food were donated. Compassion Connection members are already sorting donated foods, getting them ready for distribution to the various organizations that count on it. This week, another charitable act took the form of hurricane relief for Puerto Rico. The proceeds from two FoodFest Friday collections totaled $135. They were used to purchase needed items that are being collected by Preston's World Relief Club. Not only do we embrace those in need at the community level, but Preston’s compassion reaches over sea. Once the calendar reaches October, the acts of compassion officially commence at Preston High School! The Italian club crafted goodie bags to distribute to the elderly community at Preston's bingo night. Also, members sold pink tickets, including lip care items and hair extension, to support breast cancer awareness. Preston's annual food drive began as well. Last year, the Preston community collected 8823 lbs of canned goods, rice, and other food items. This year, the standard has been set for 9000 lbs among the 482 students and 59 faculty members. Students were exhilarated by a sense of purpose and duty during Food Drive Assembly Sing-a-long! Preston's most popular club, Compassion Connection, sponsors an endless amount of fundraising events, such as the bake sale in the photo. The members contribute by bringing in exlusively home baked goods to be sold. There are very few times when a Compassion Connection bale sale doesn't sell out! The proceeds from this bake sale will fund the many projects Compassion Connection will endeavor this fall, such as personal fall themed packages for senior citizens. Compassion Connection embraces all members of society through their acts of charity and kindness! PHS students really make Preston's Liturgy a captivating experience. The choir provided us with beautiful and engaging songs. 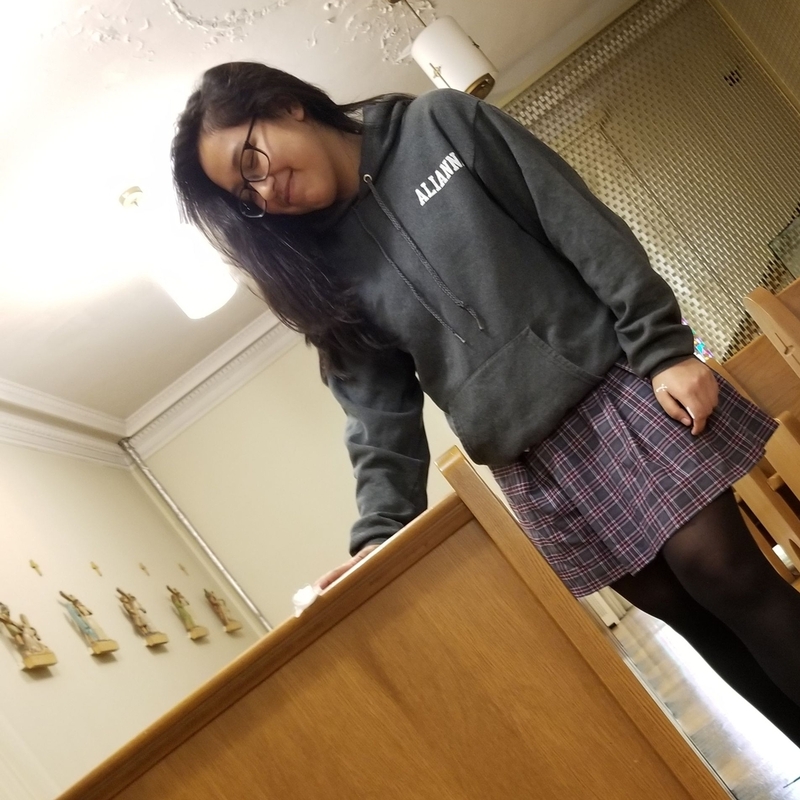 Miranda Y. Martinez stated that "she is an alter server because she enjoys serving her Lord and the Preston community." Liturgy is an opportunity for our community to congregate in the name of the Lord. This year's Liturgy of the Holy Spirit included plaques that represent the members of Preston's family. We started this school year unified, singing songs of praise, and celebrating our faith. 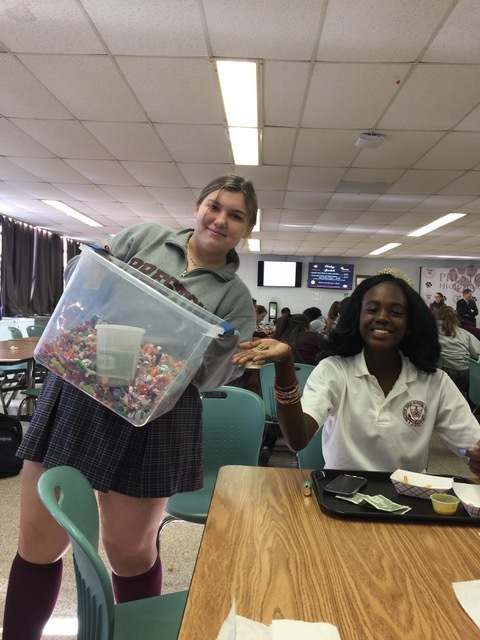 Preston's Food Fest Friday is opportunity for students to donate their spare change to particular cause every Friday in exchange for a lollipop. This is a small way in which Preston's club, Compassion & Connection, make a difference in a world full of people in need. It is a Preston tradition for every junior to "adopt" a Freshman. The Juniors imitate "big sisters" to the Freshmen class in our Preston Community. 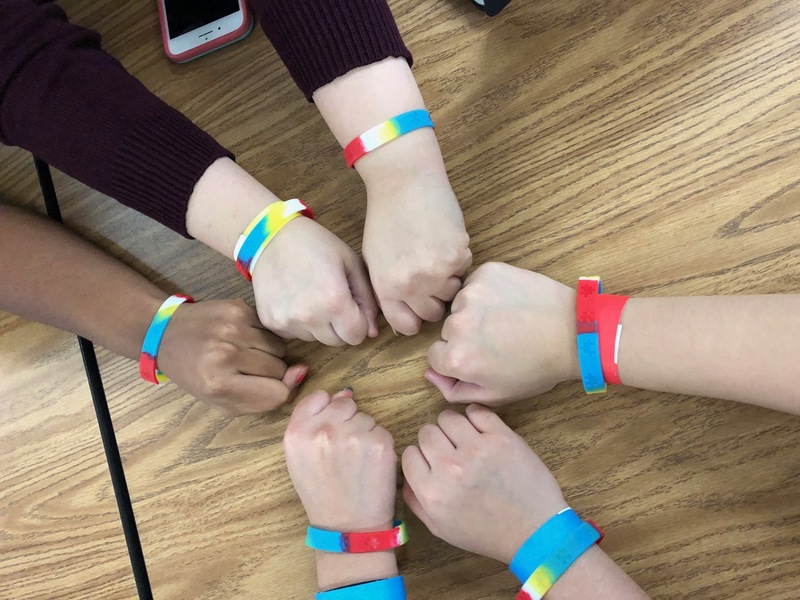 To many, it may appear admirable how the Juniors are so willing to intercede for the Freshmen, but it's a "norm" at Preston High School, where compassion is in the air. Also, certain girls volunteer to be "Junior Ambassadors". These girls are devoted to positively impacting the Freshmen class. Junior Ambassadors attend Freshmen orientation over summer vacation to answer questions and give tours of the Preston grounds. 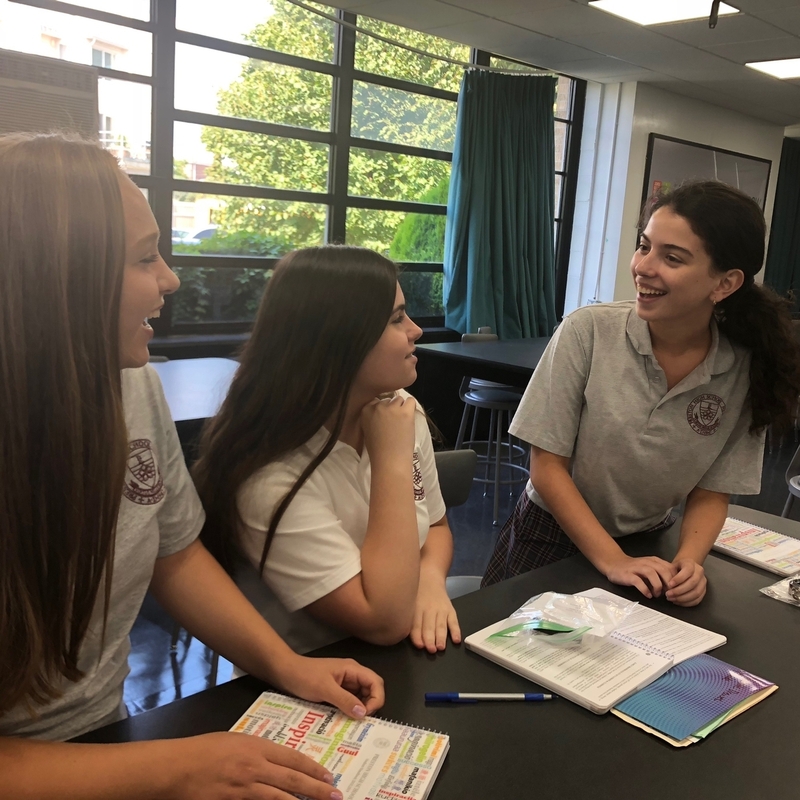 Junior Ambassadors also meet regularly with the Freshmen during homeroom to discuss upcoming events and traditions. The Junior class does everything in their power to integrate the Freshmen into the Preston family.